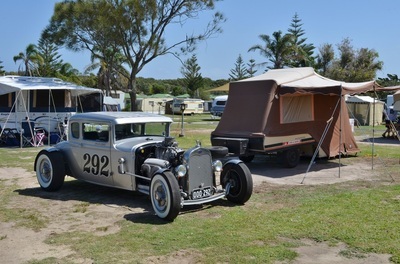 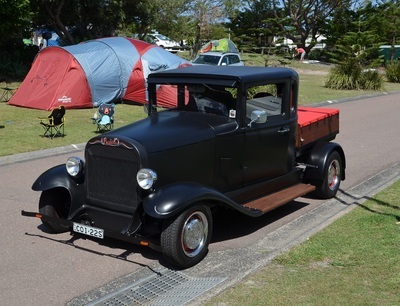 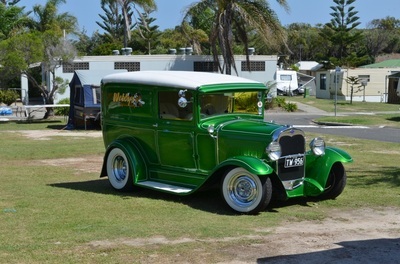 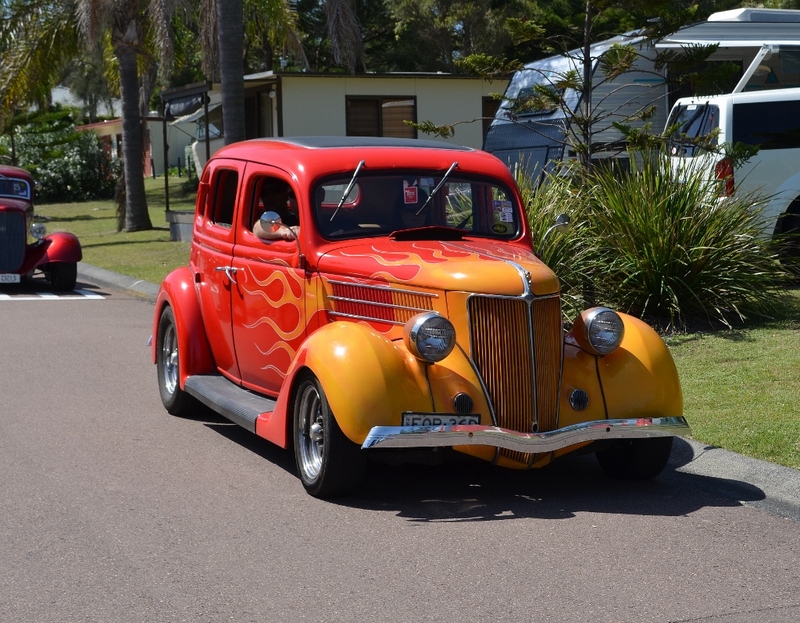 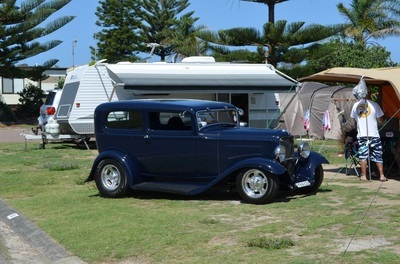 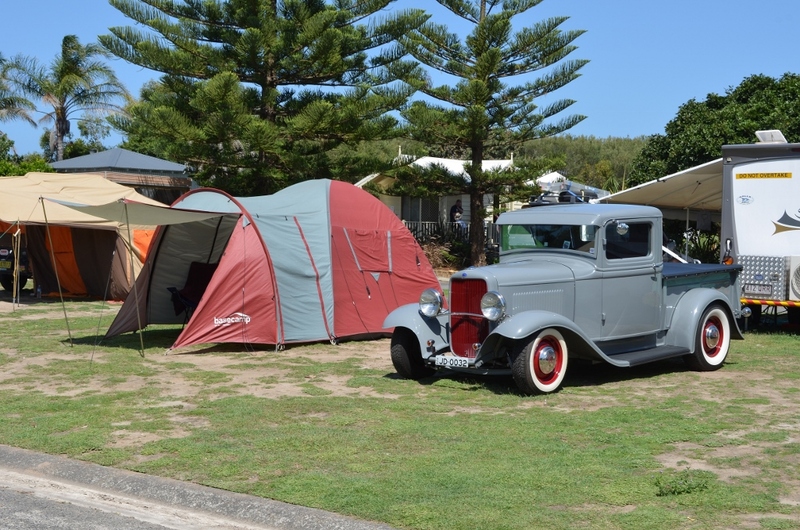 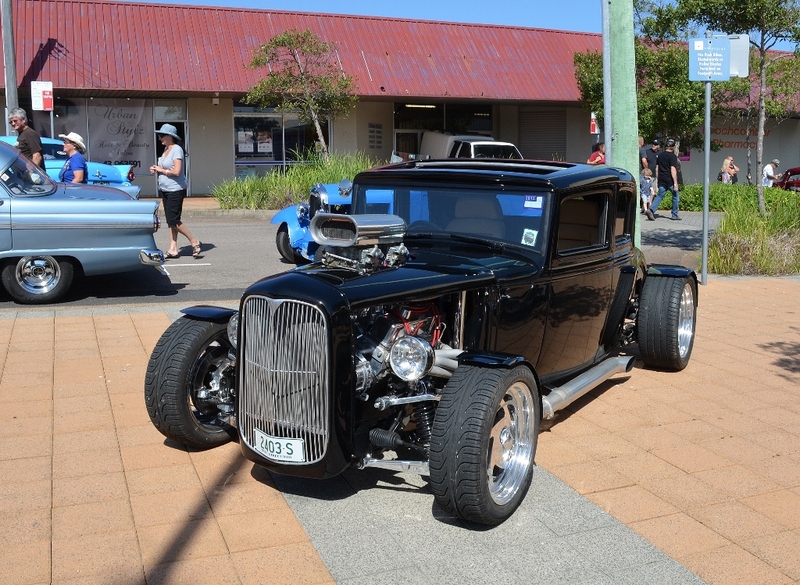 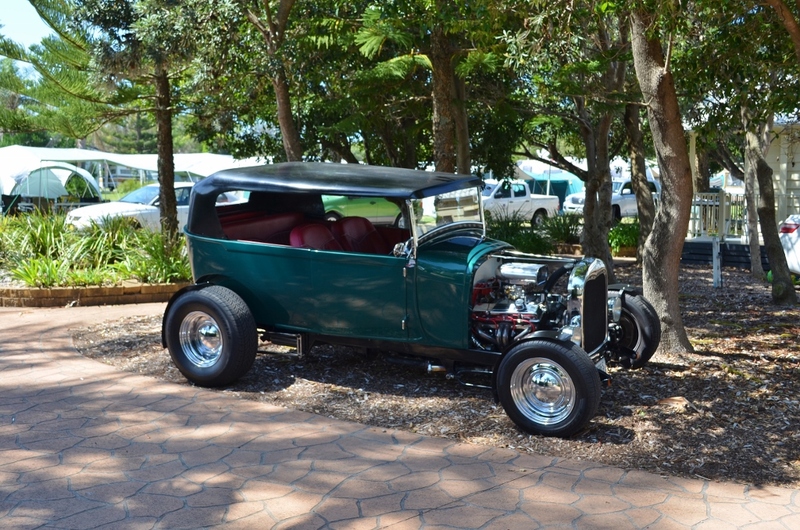 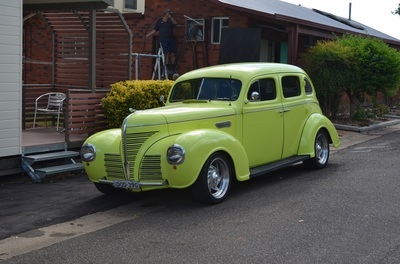 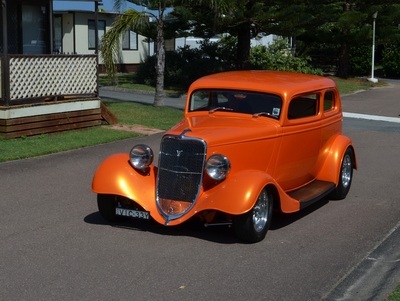 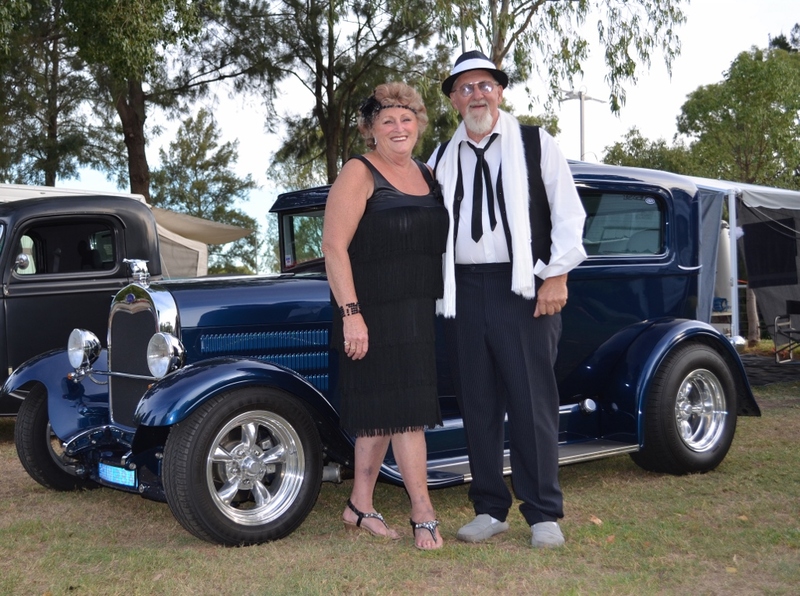 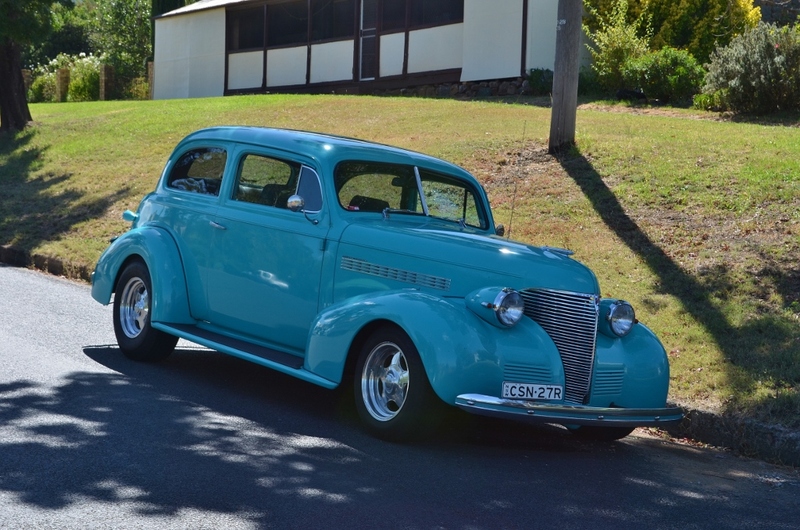 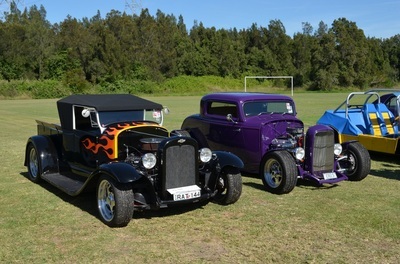 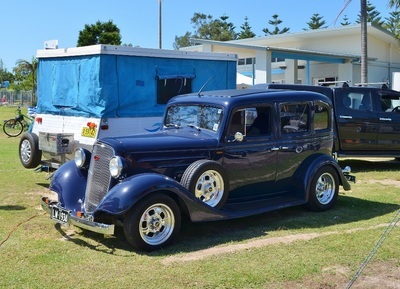 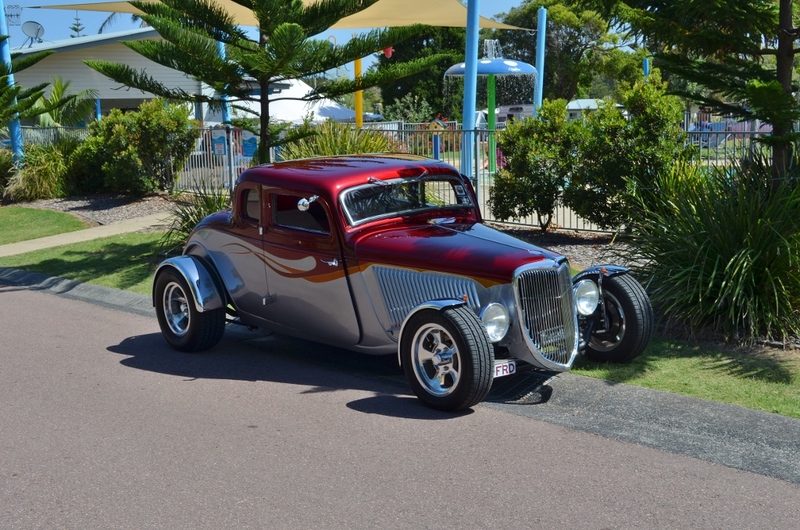 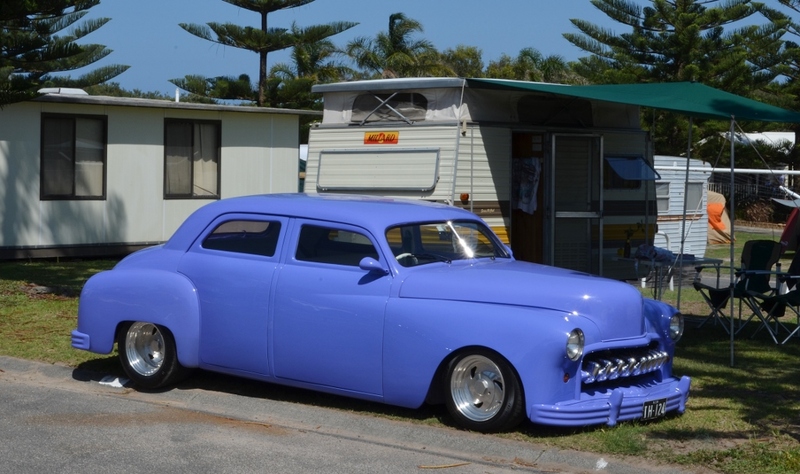 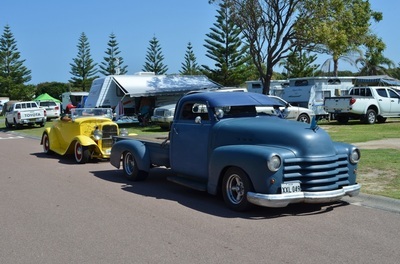 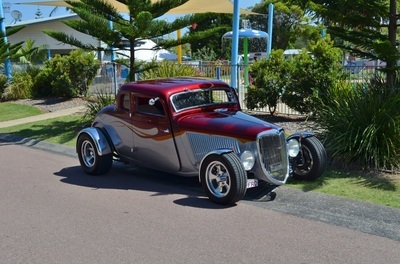 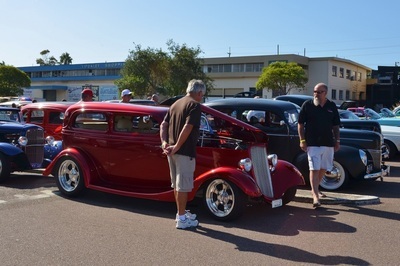 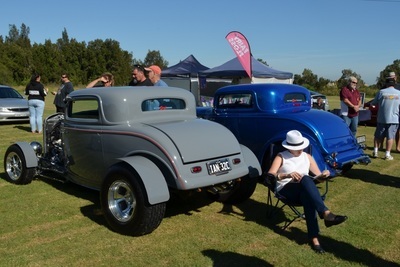 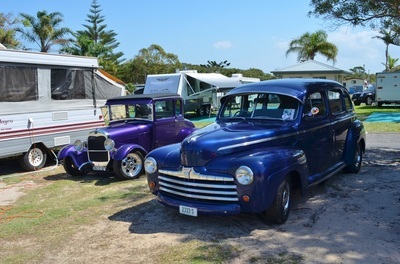 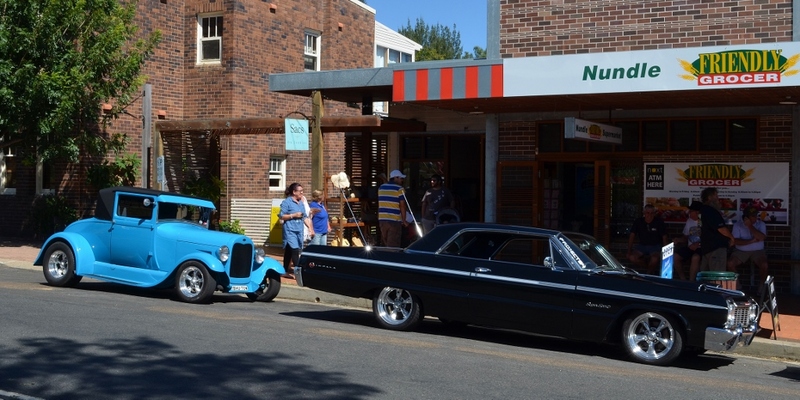 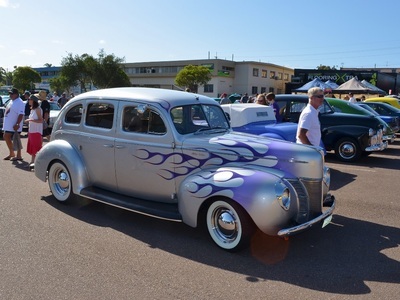 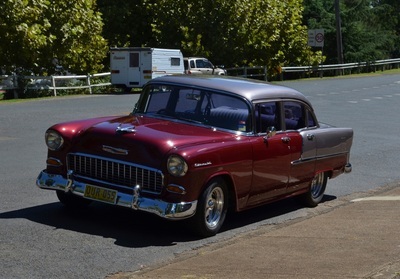 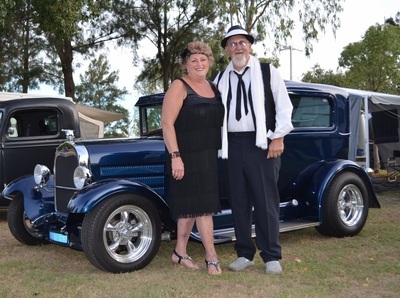 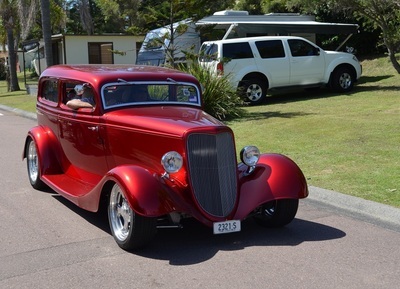 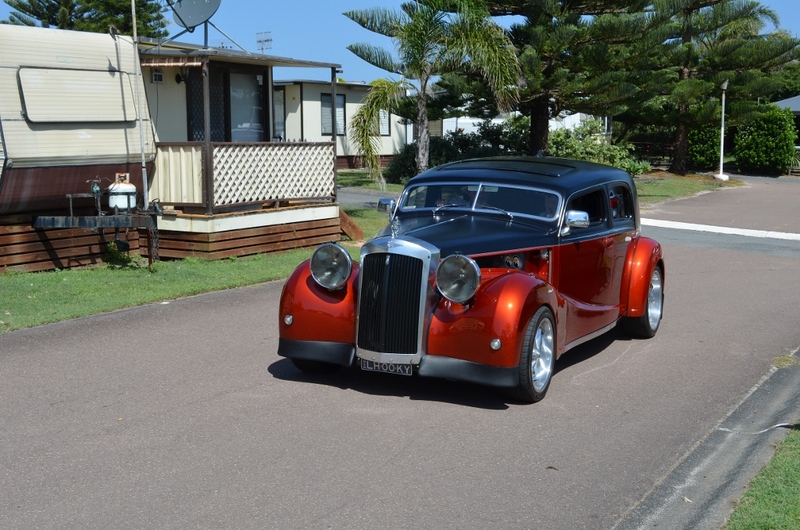 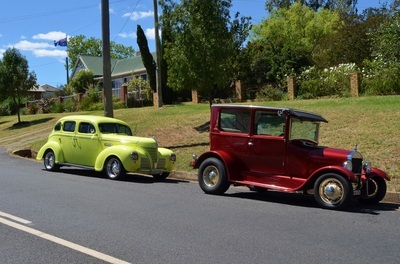 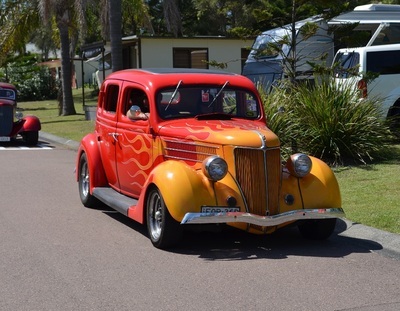 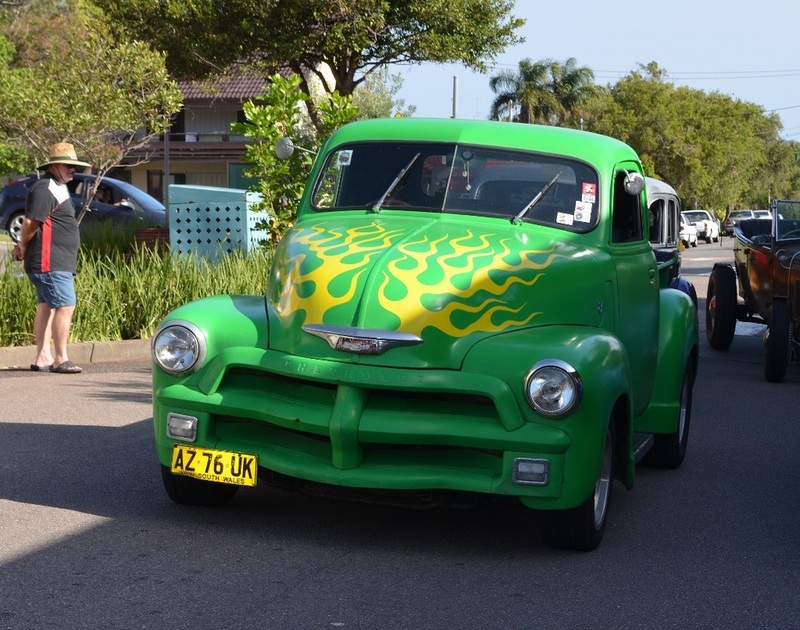 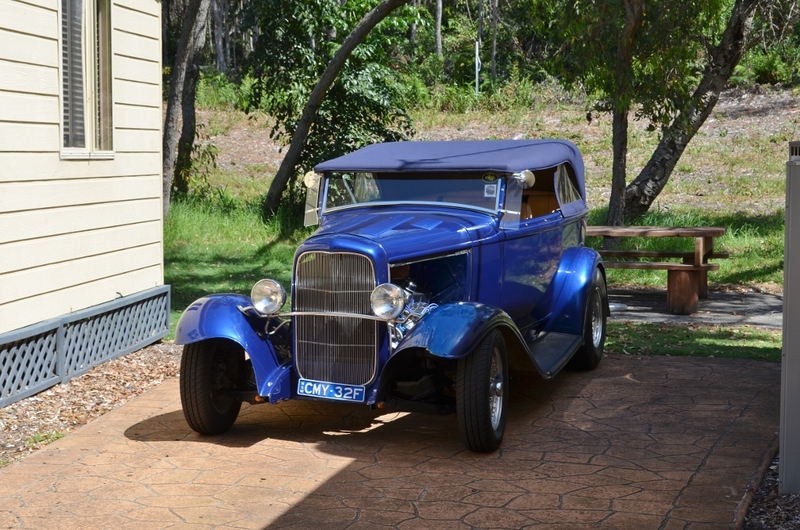 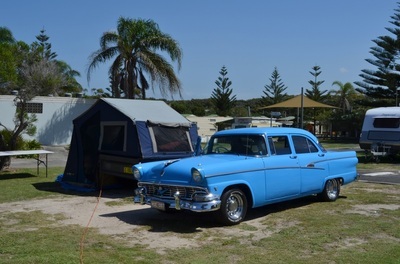 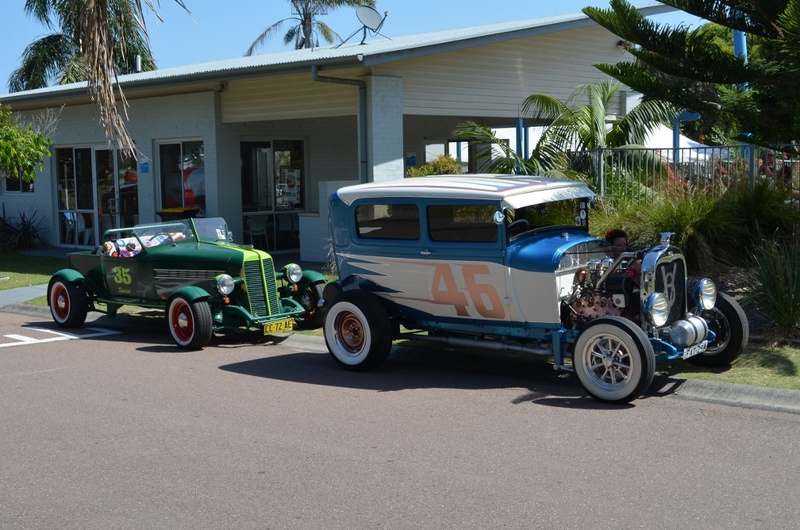 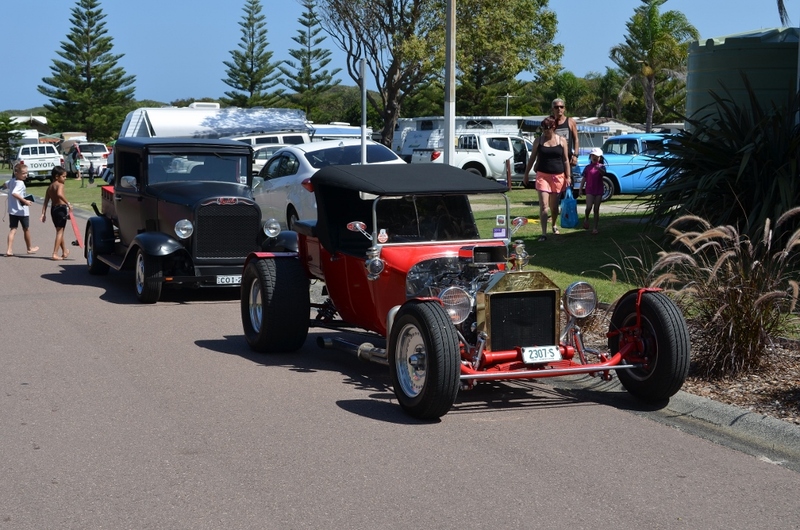 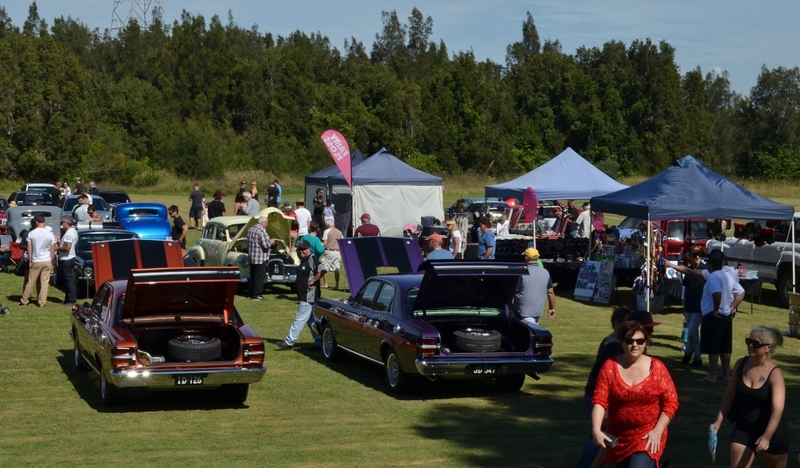 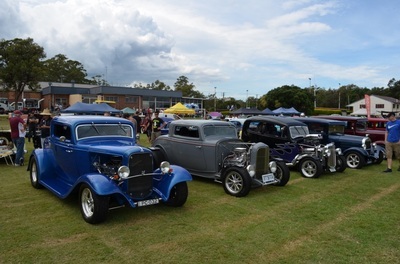 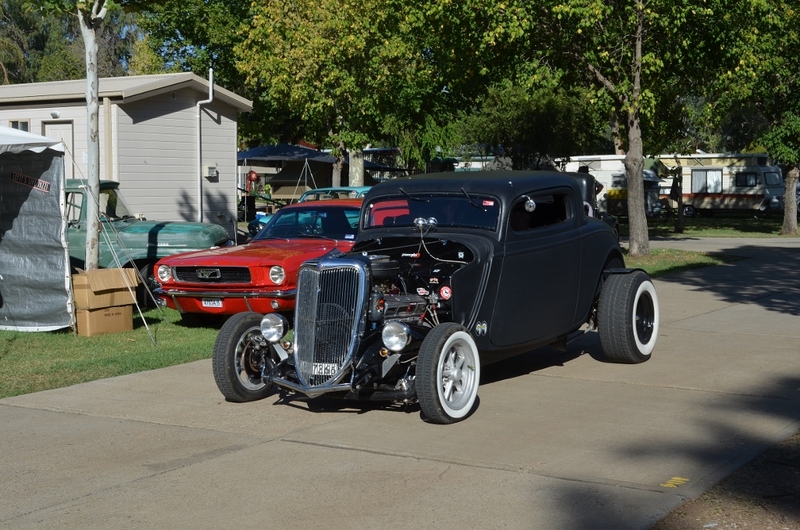 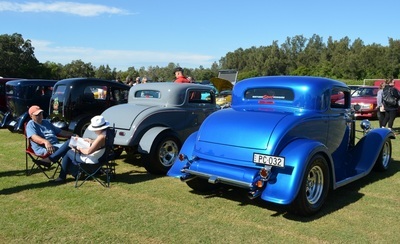 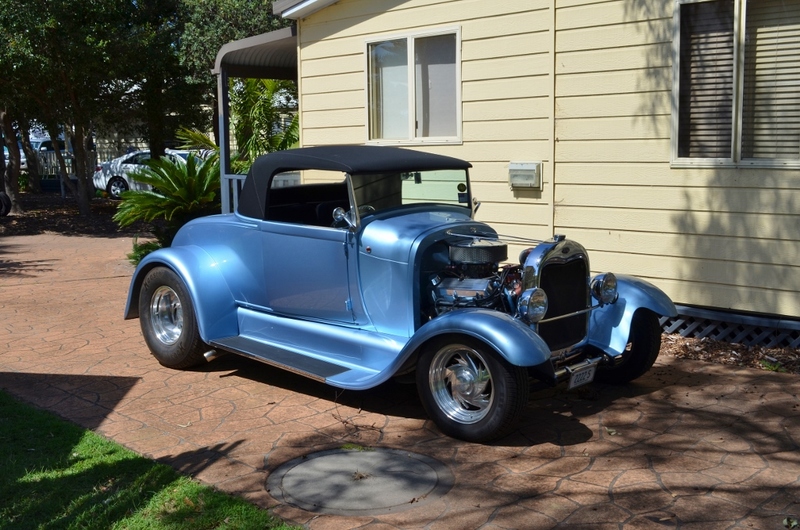 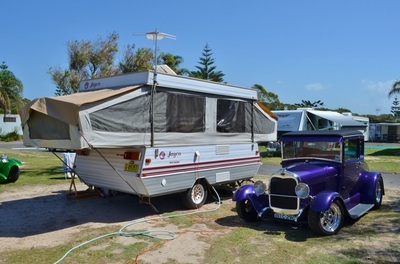 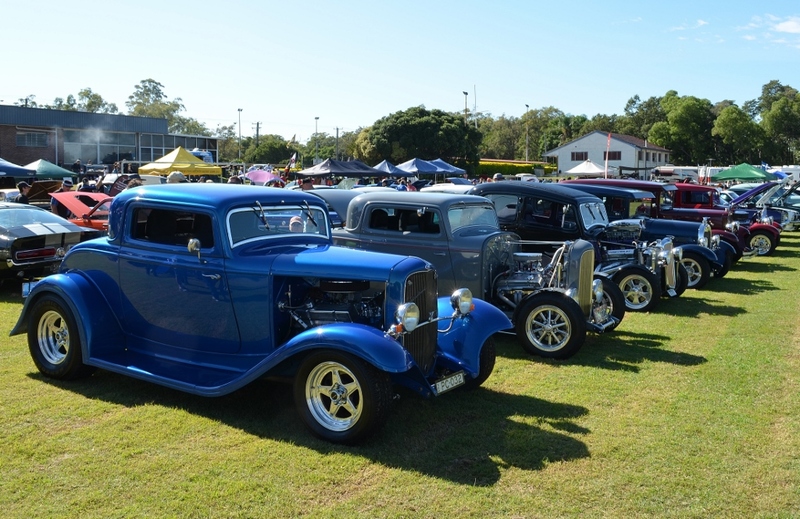 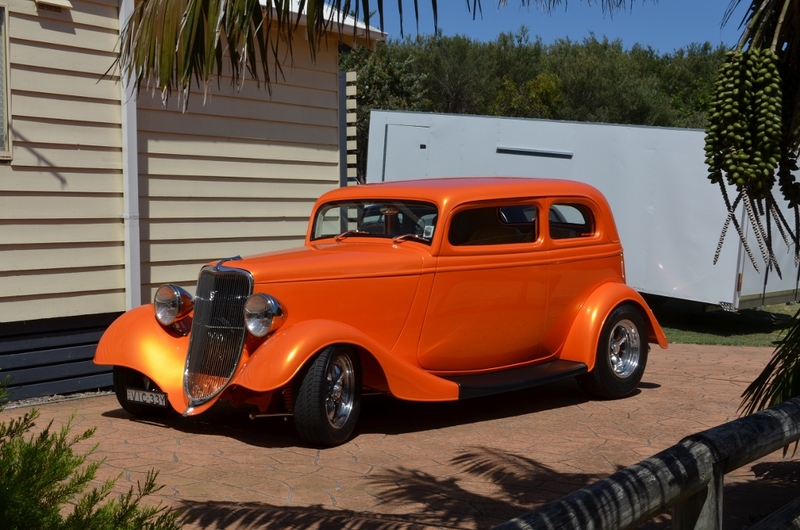 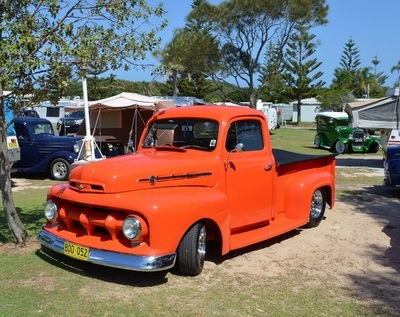 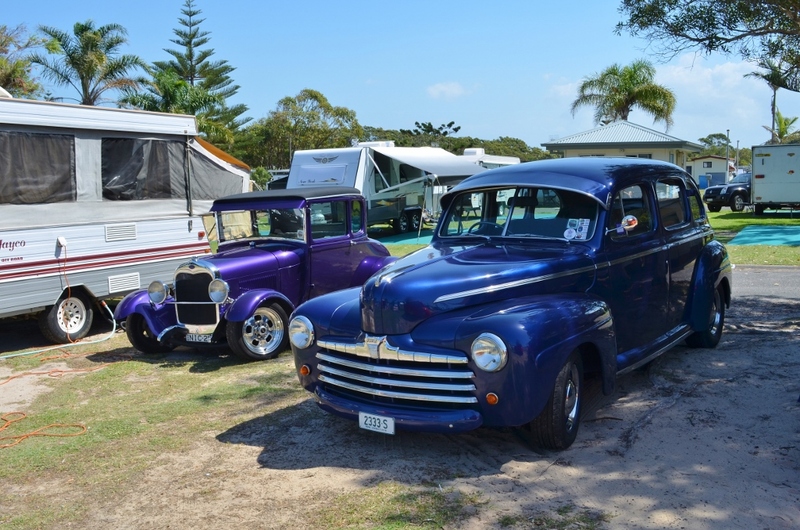 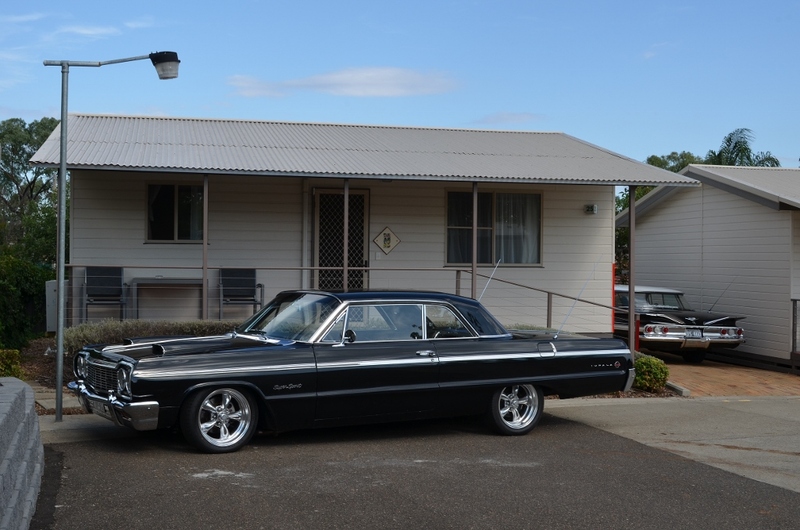 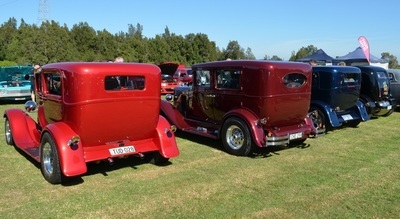 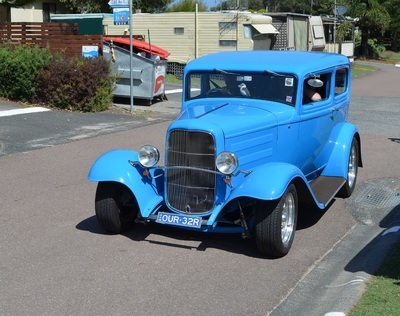 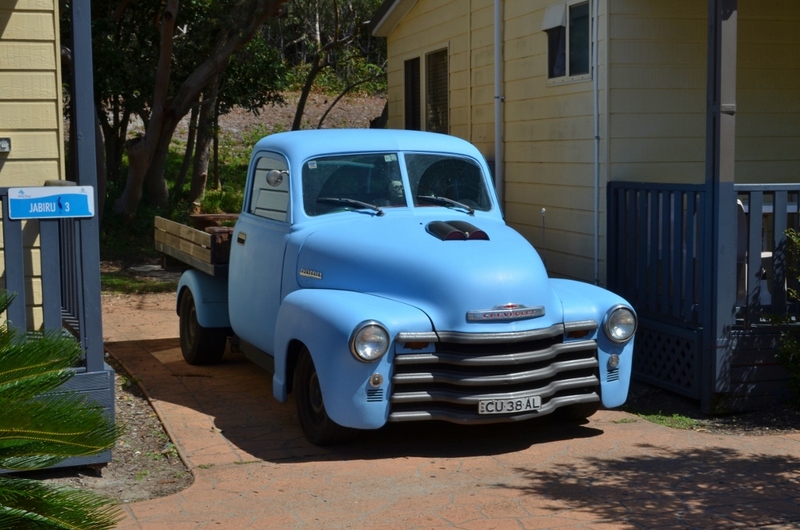 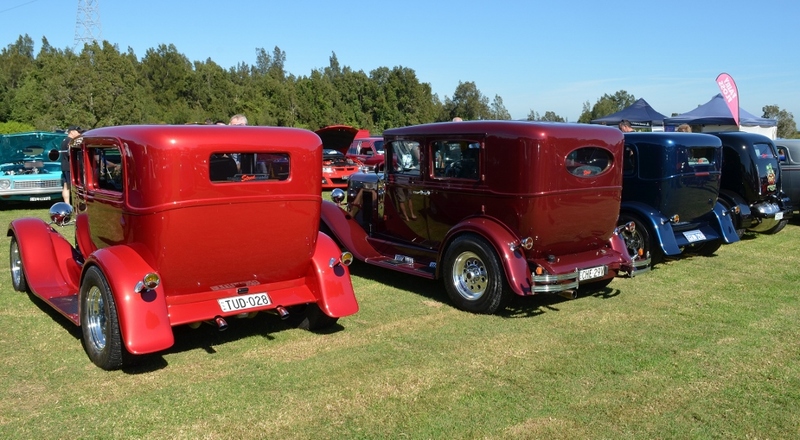 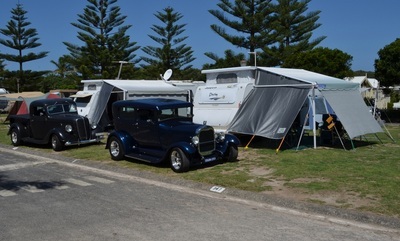 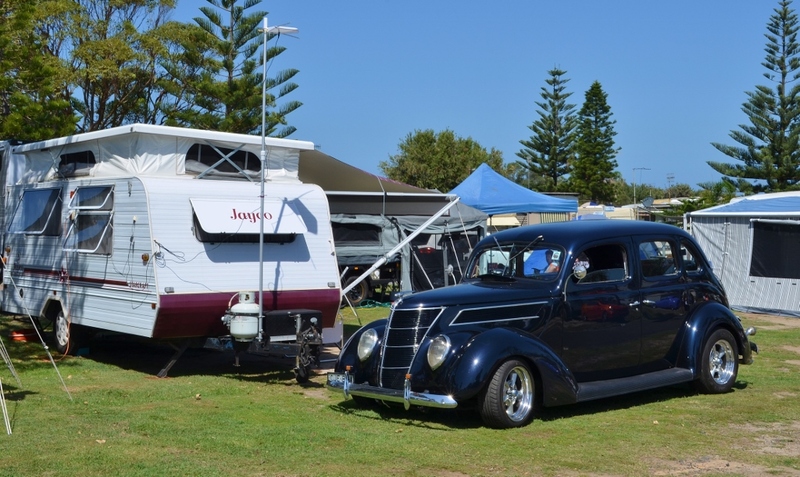 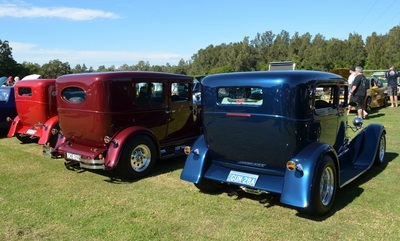 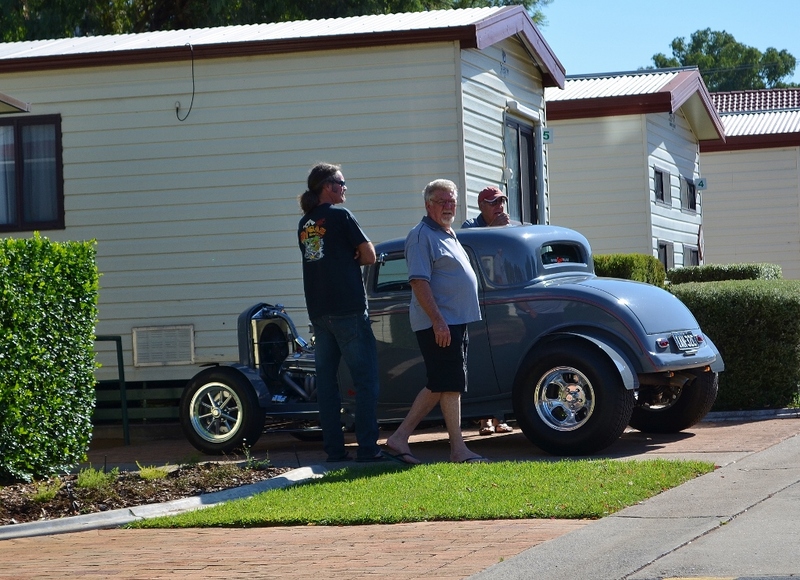 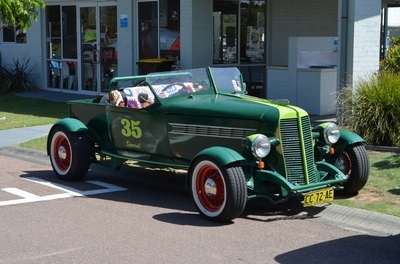 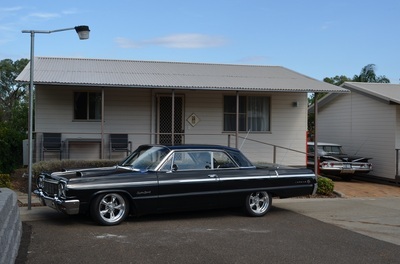 Easy Street Rod and Custom Club held its annual Rod Run at Norah Head again this year. 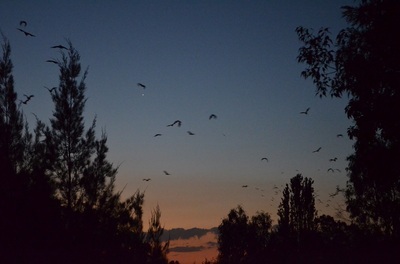 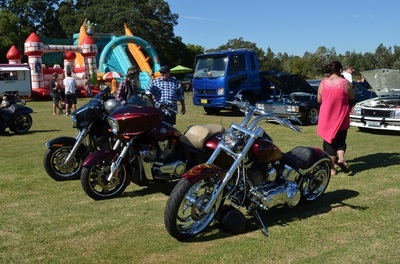 The weather was perfect and the format changed from previous years. Registration and the meet and greet were held on Friday night where we had a BBQ and drinks. 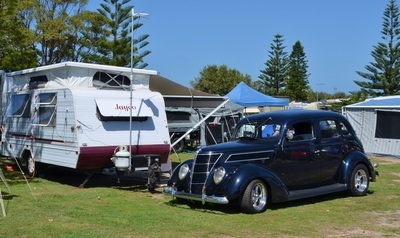 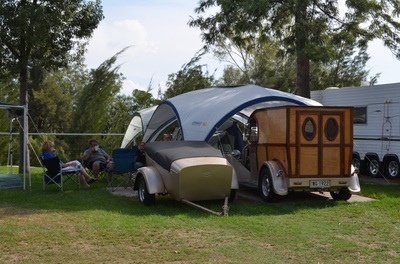 On the Saturday morning they had a cruise to Foresters Beach Bowling Alley where some bowled and some just watched while enjoying a coffee. 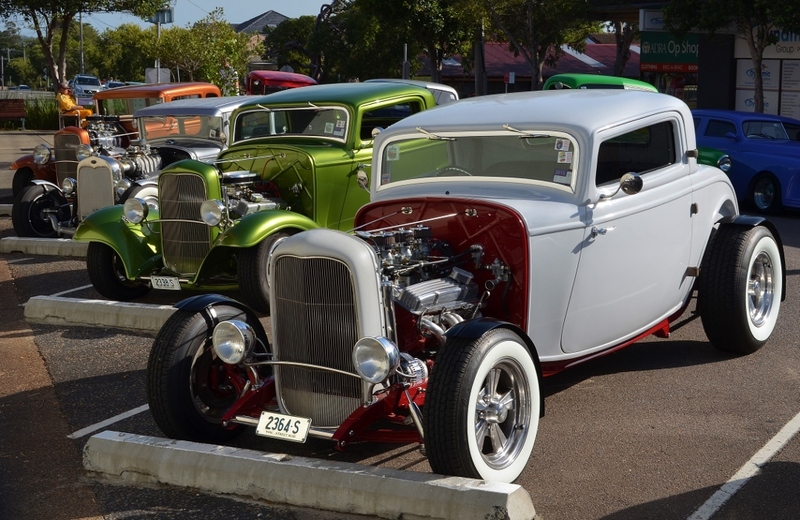 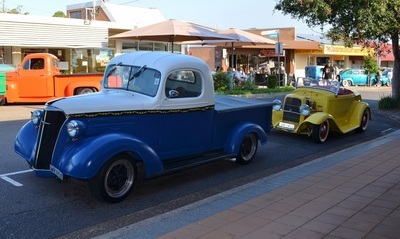 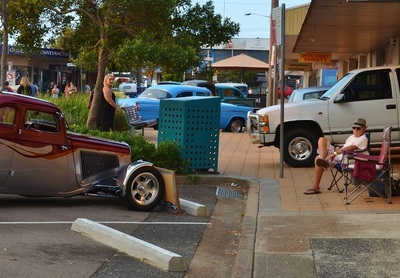 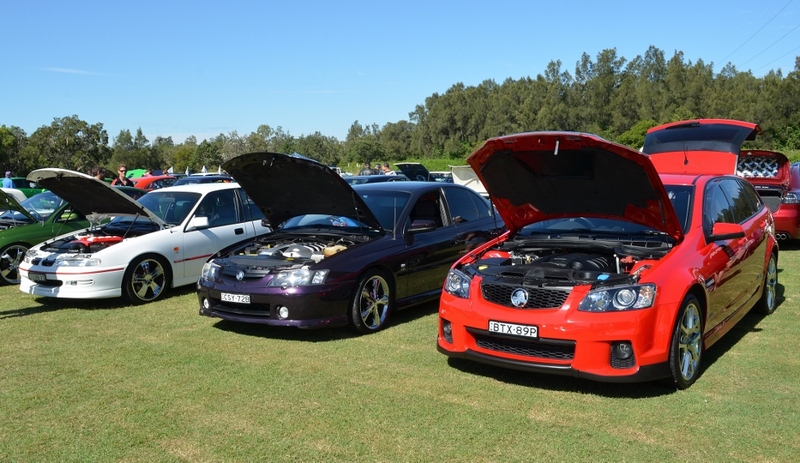 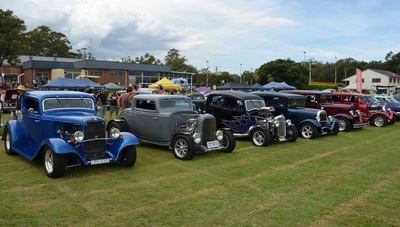 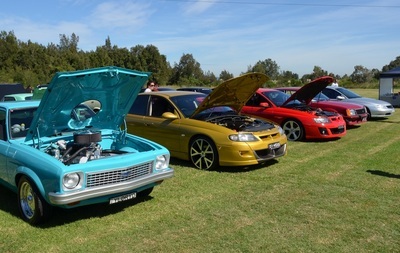 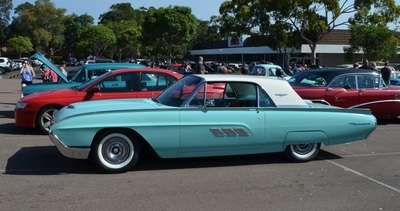 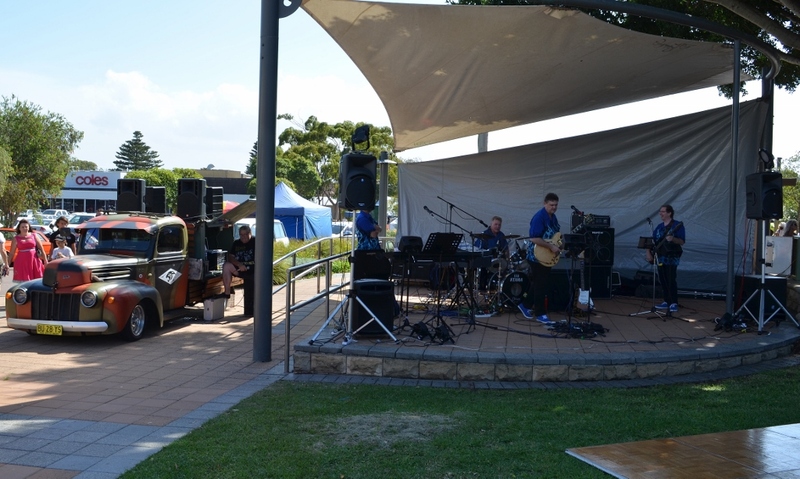 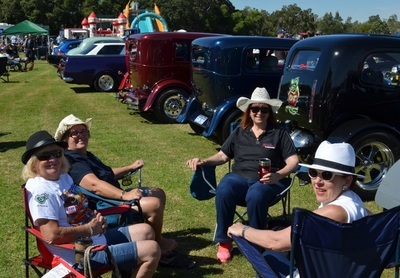 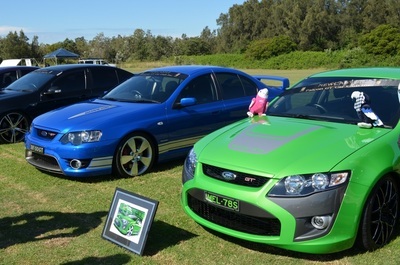 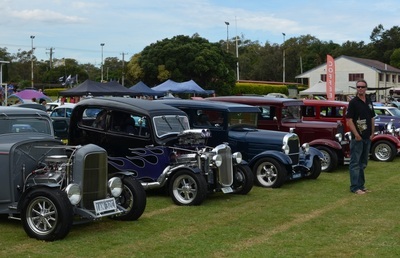 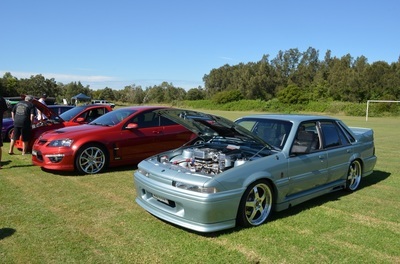 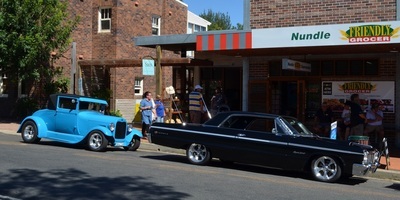 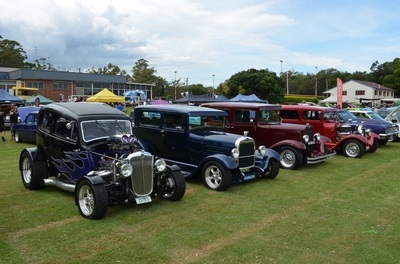 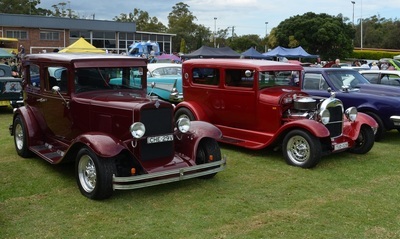 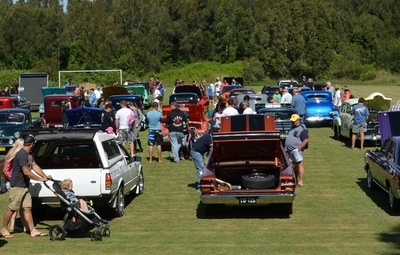 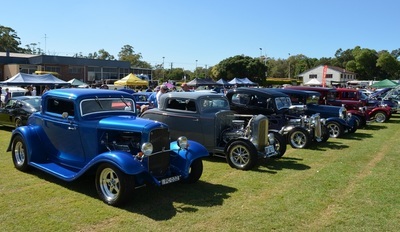 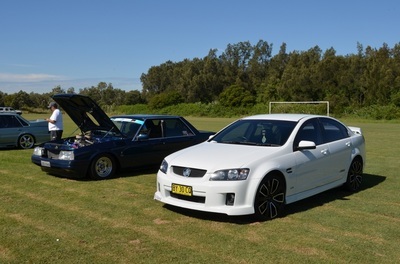 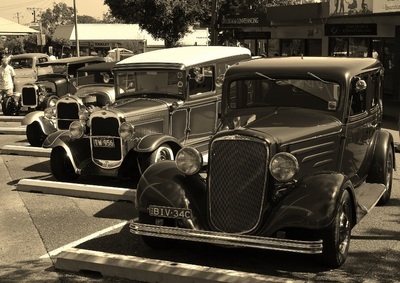 In the afternoon there was a show and shine in the main centre of Toukley which was held in conjunction with a day show. Easy Street also put on the day show and there would have been well over 200 vehicles on display. 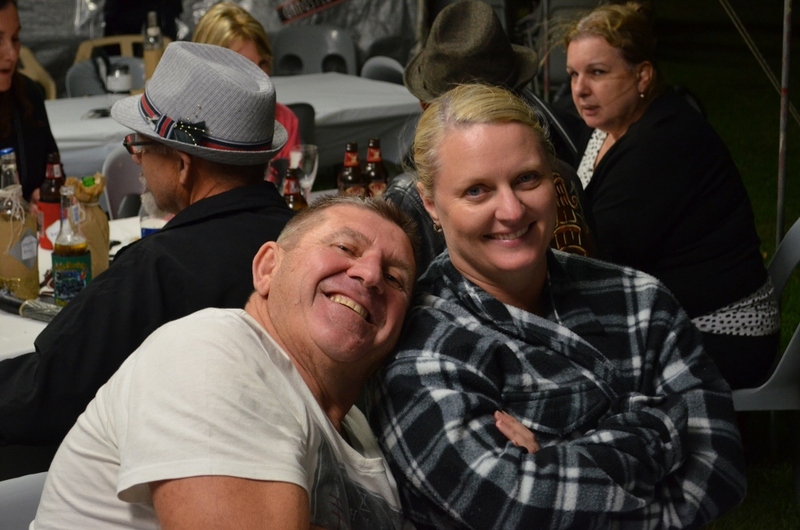 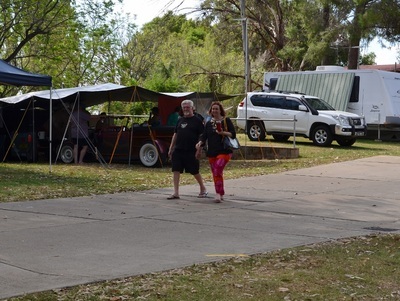 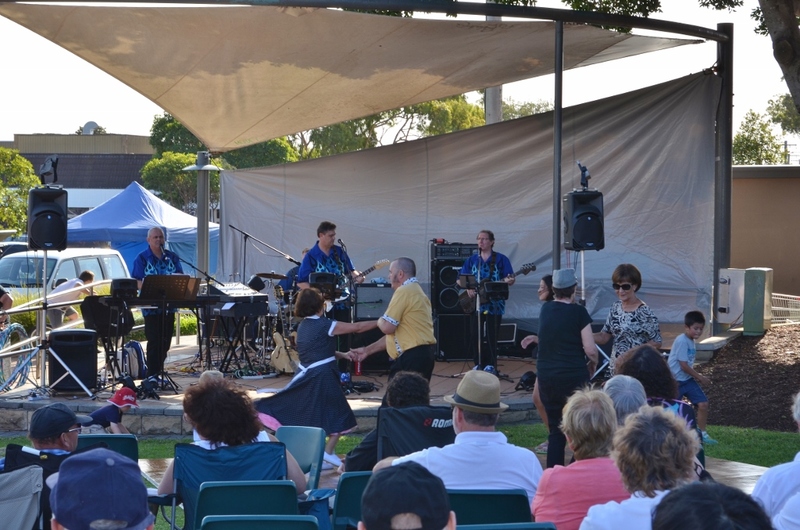 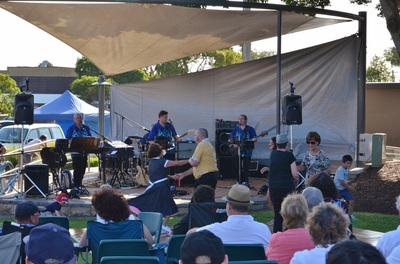 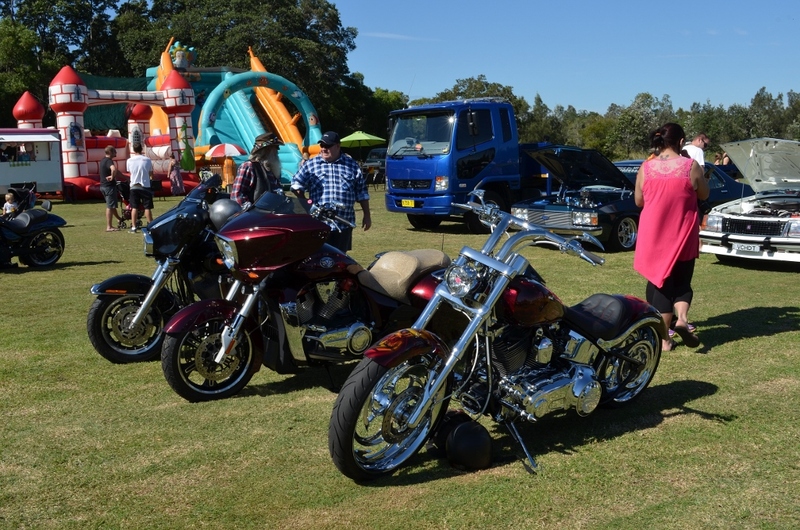 Sunday there were 3 activities to attend which included Morisset Swap meet after which there was lunch and the presentation. A great weekend as usual and we have booked in for next year already. 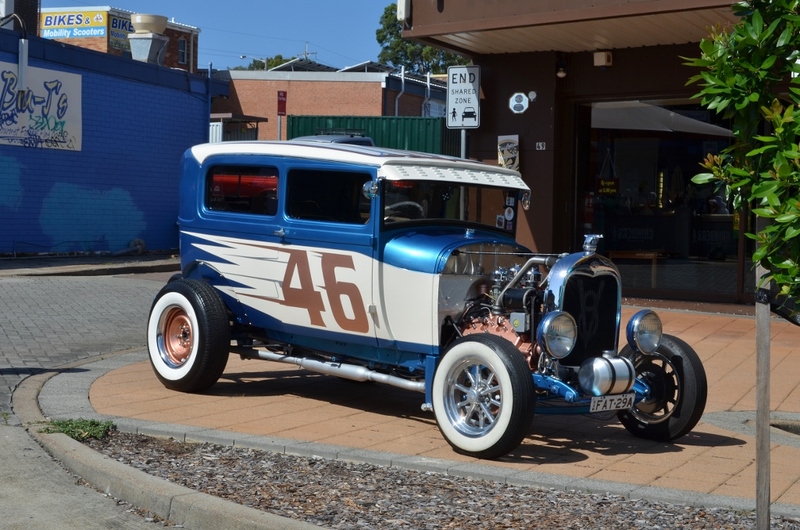 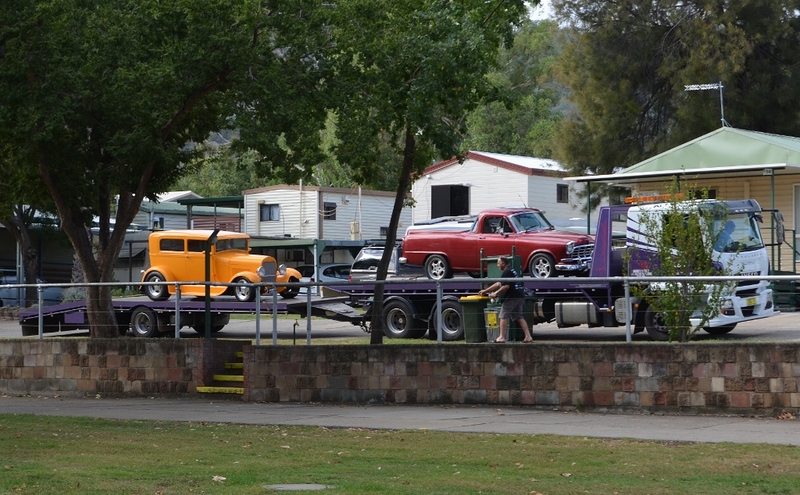 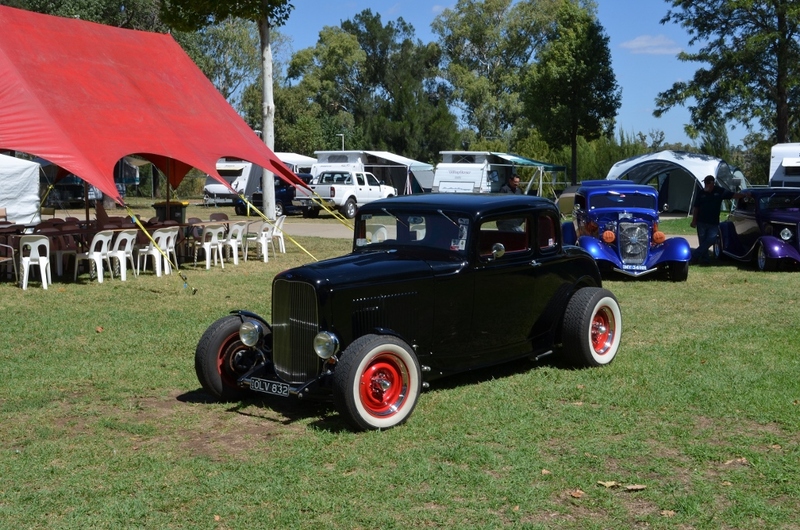 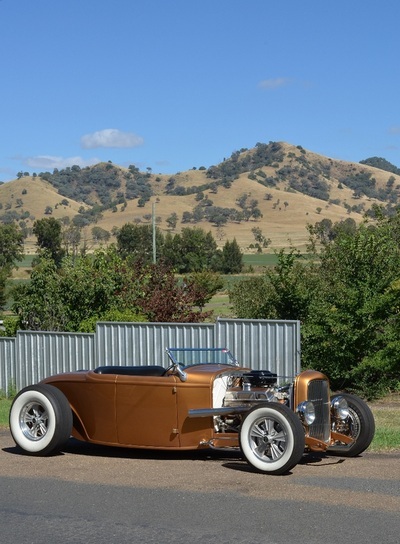 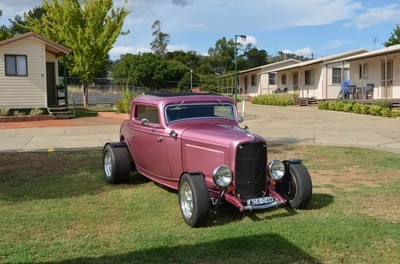 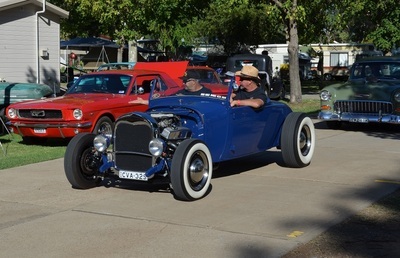 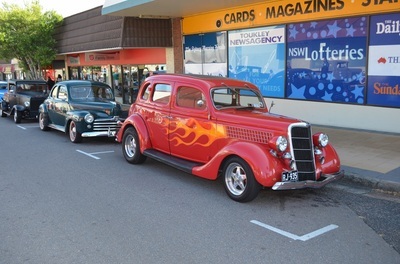 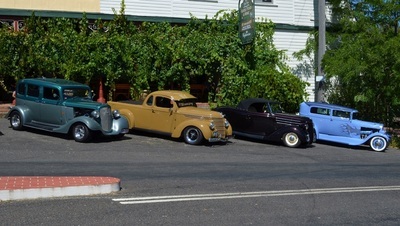 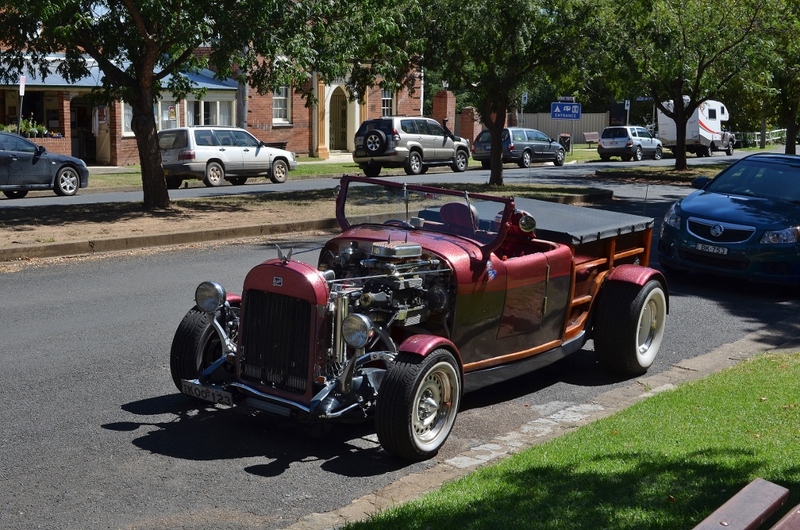 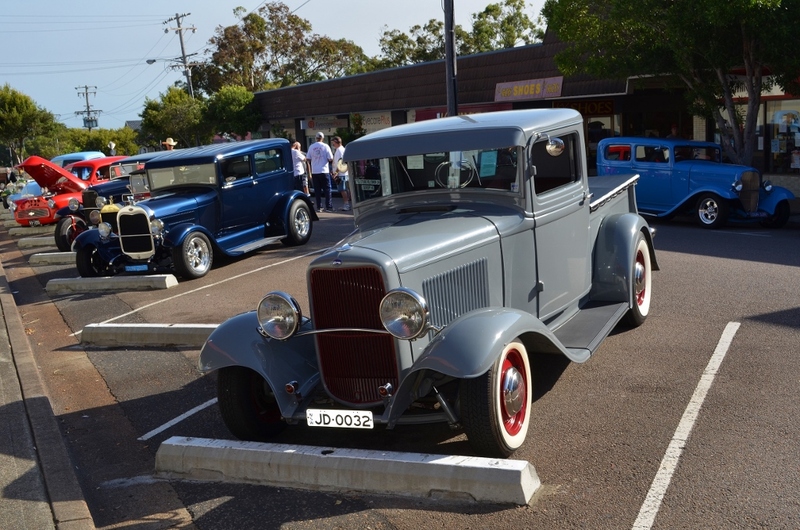 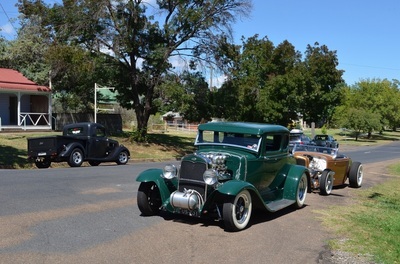 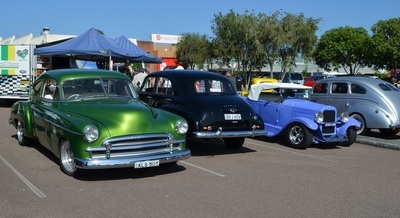 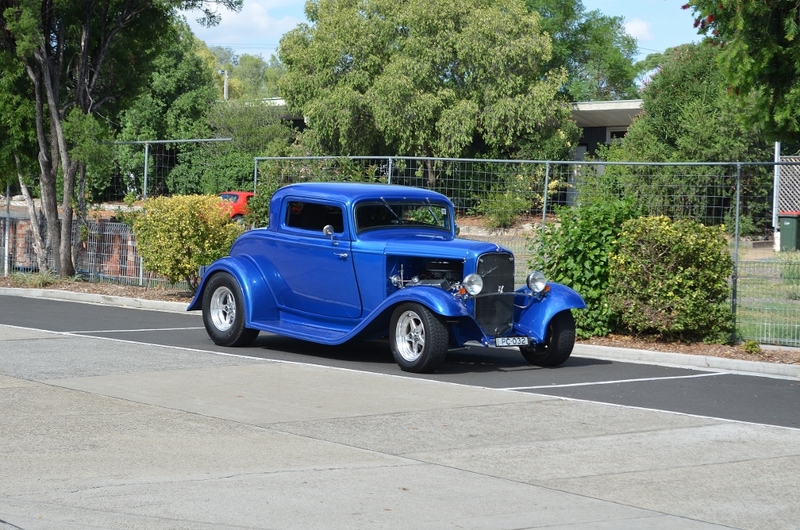 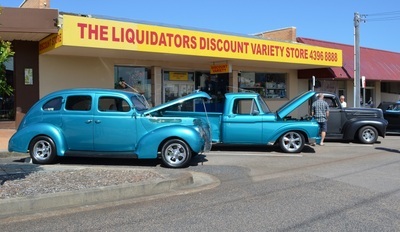 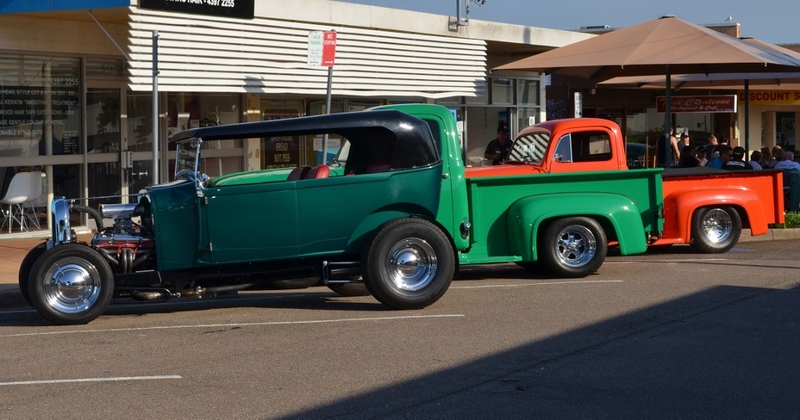 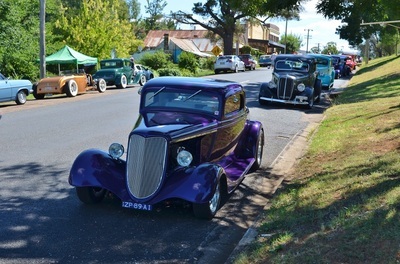 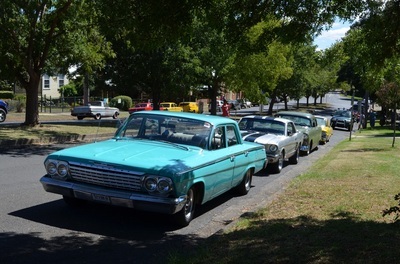 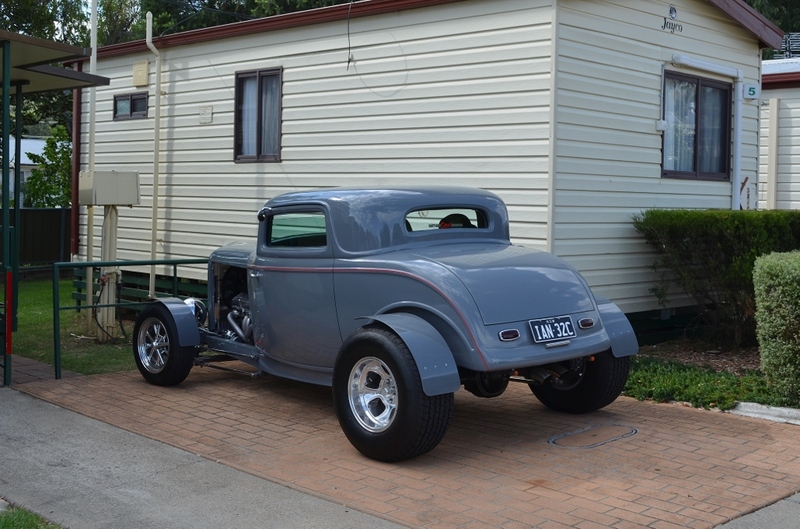 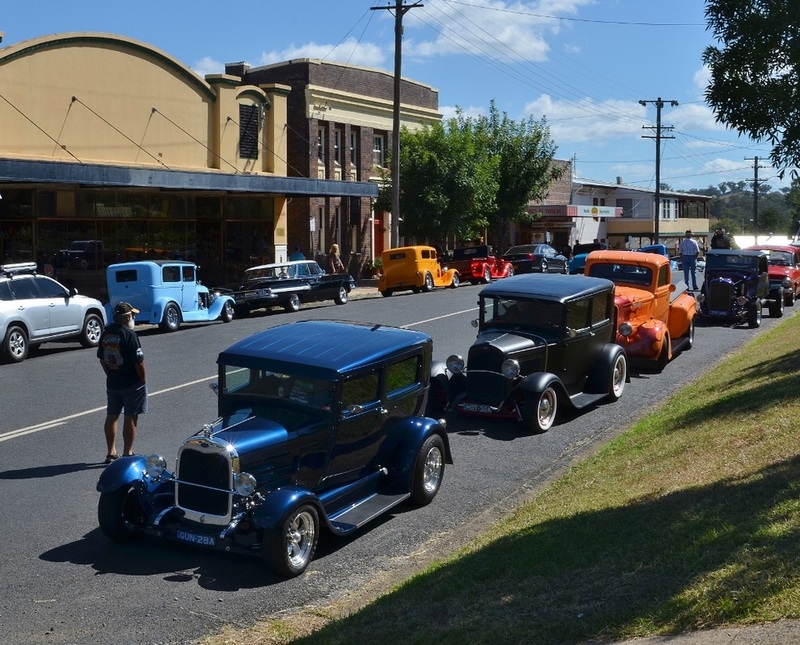 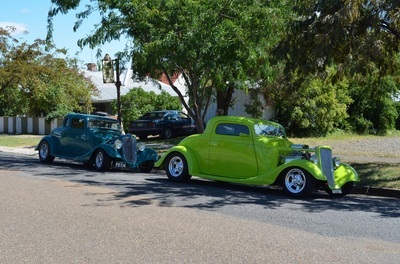 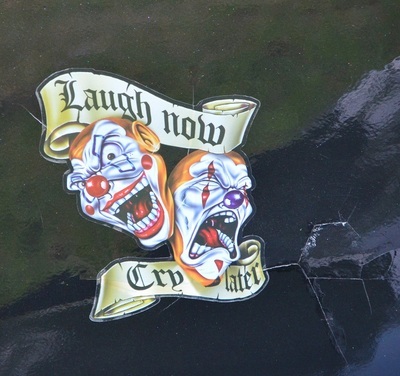 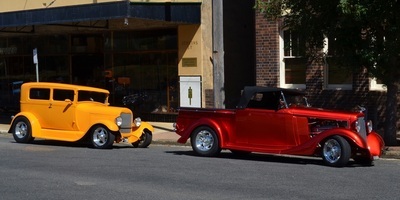 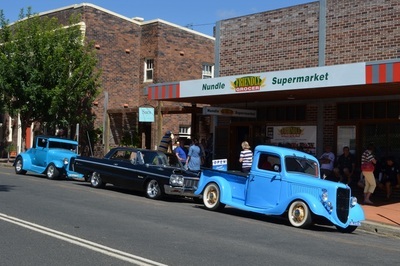 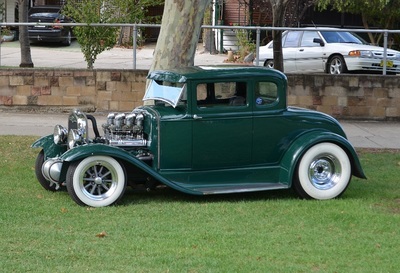 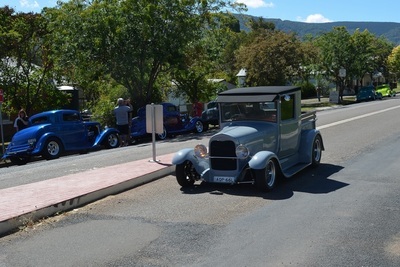 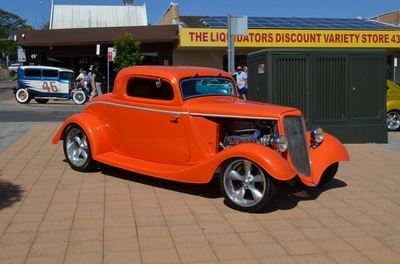 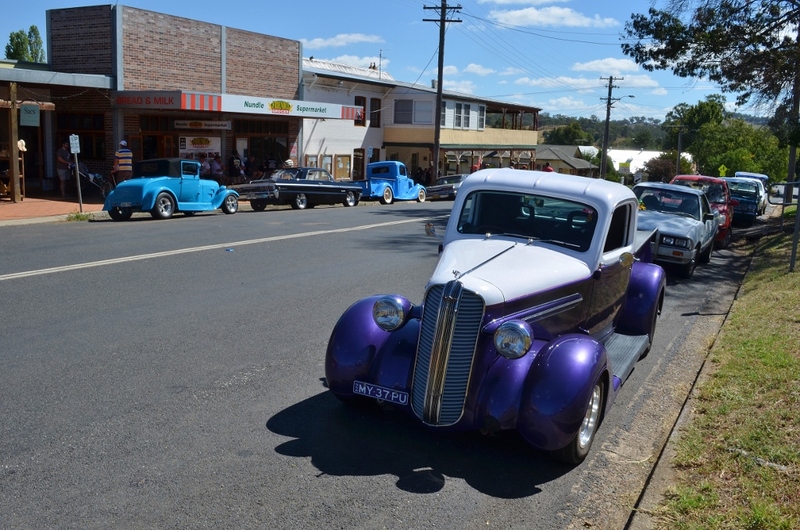 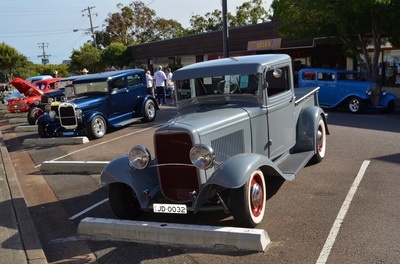 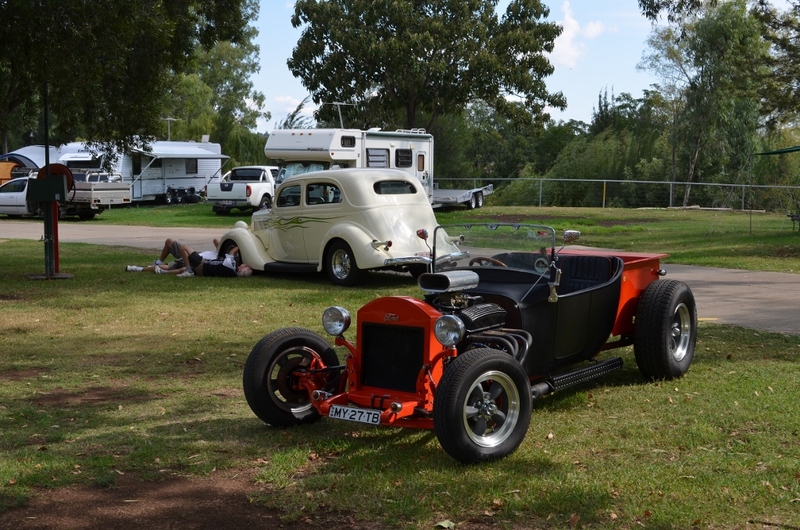 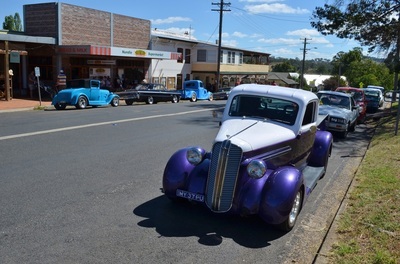 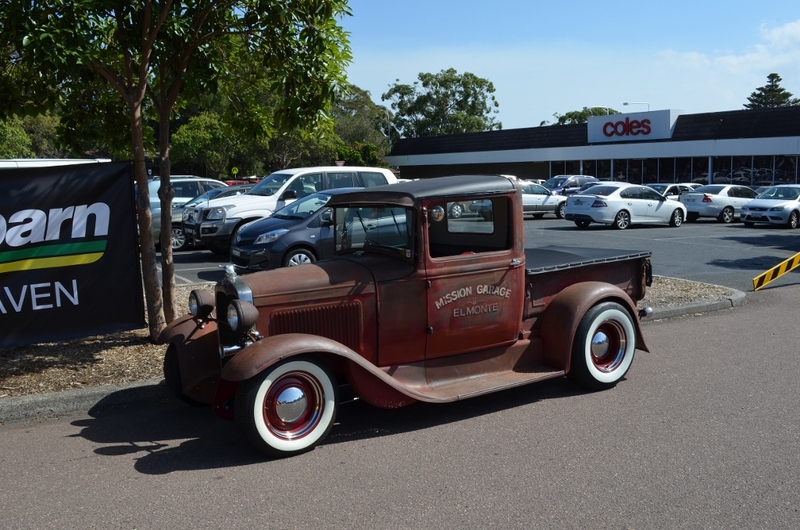 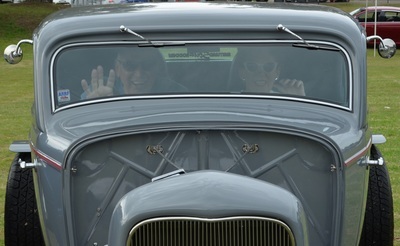 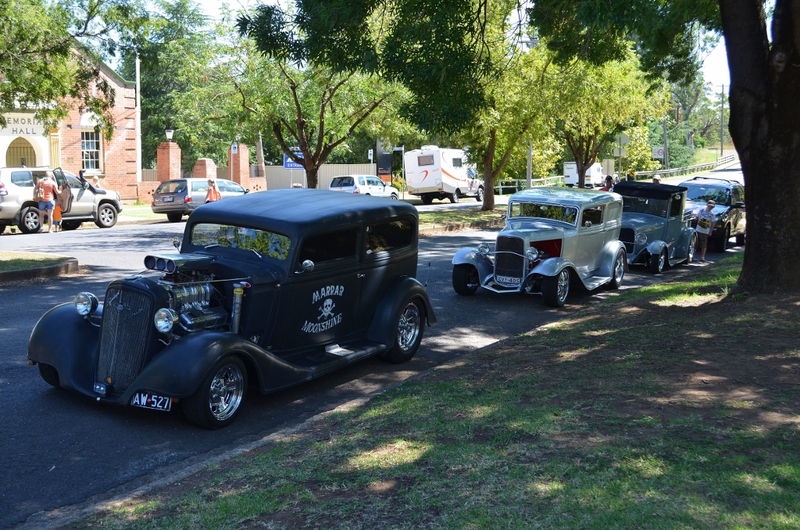 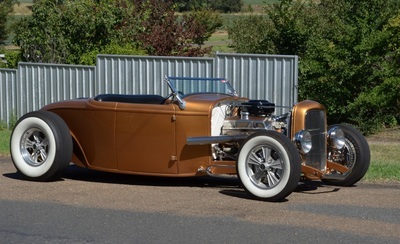 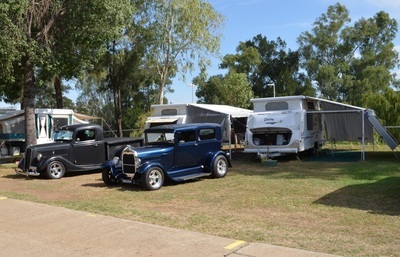 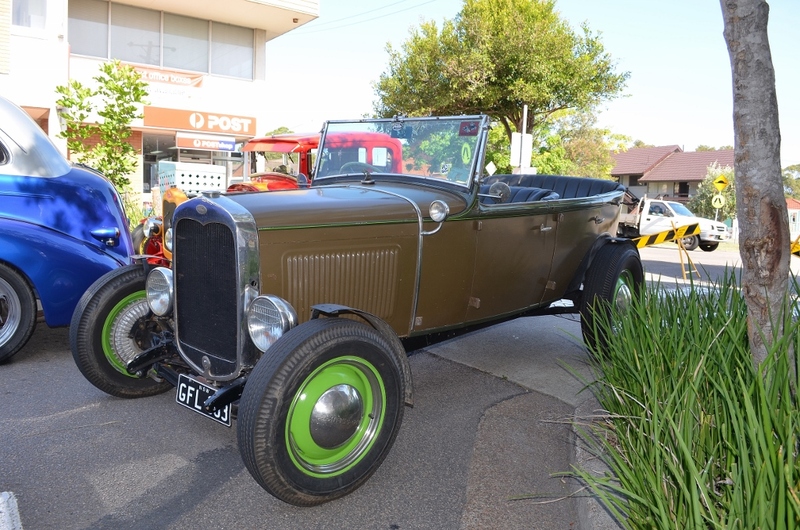 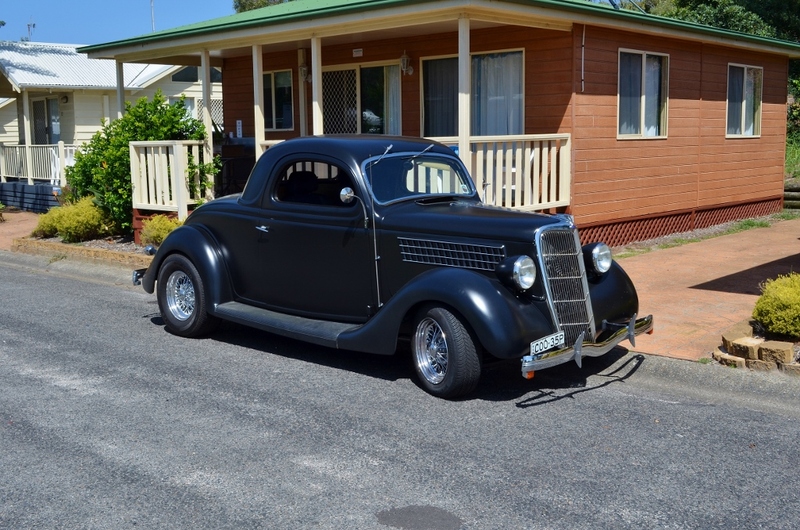 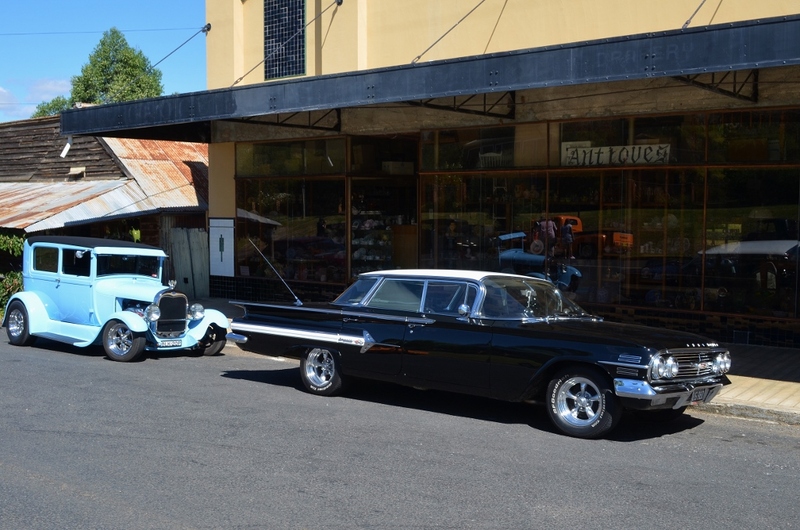 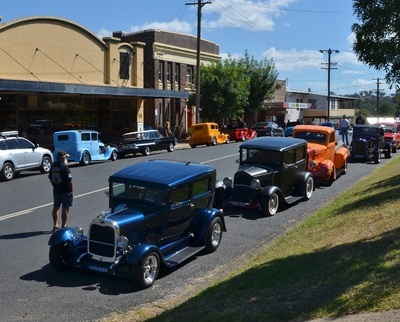 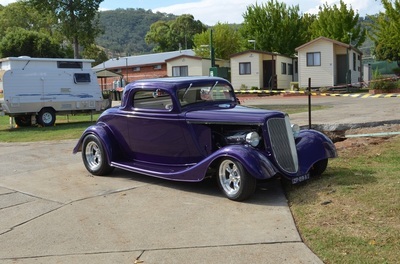 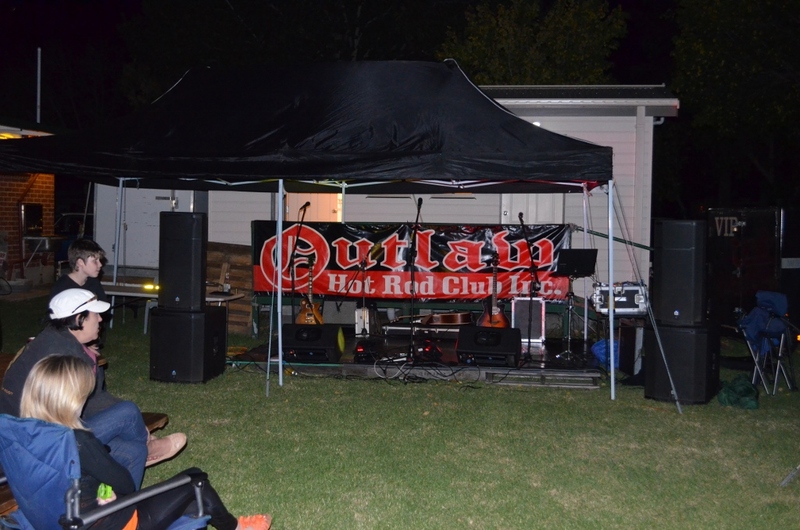 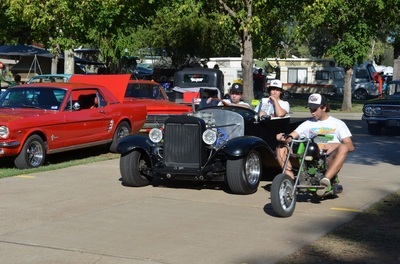 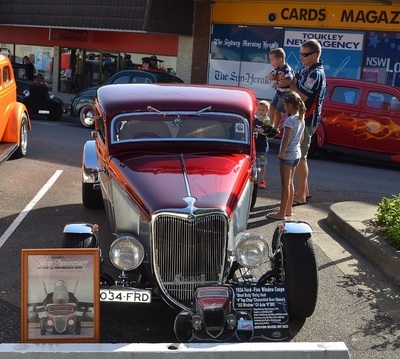 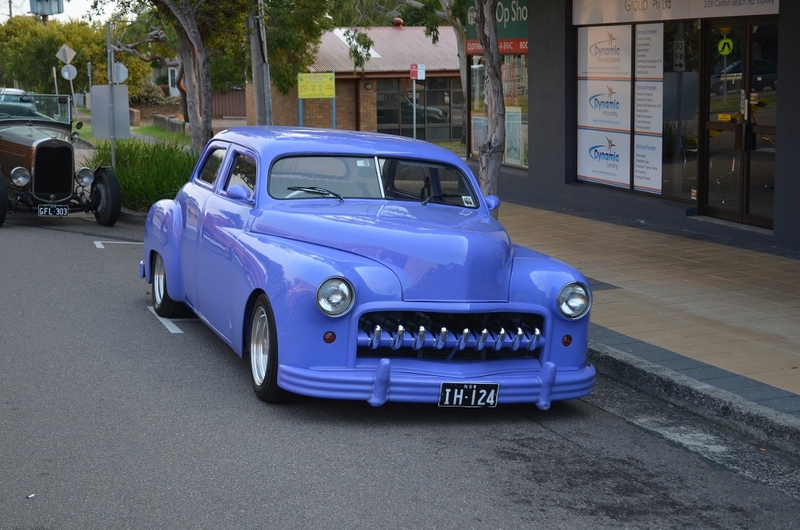 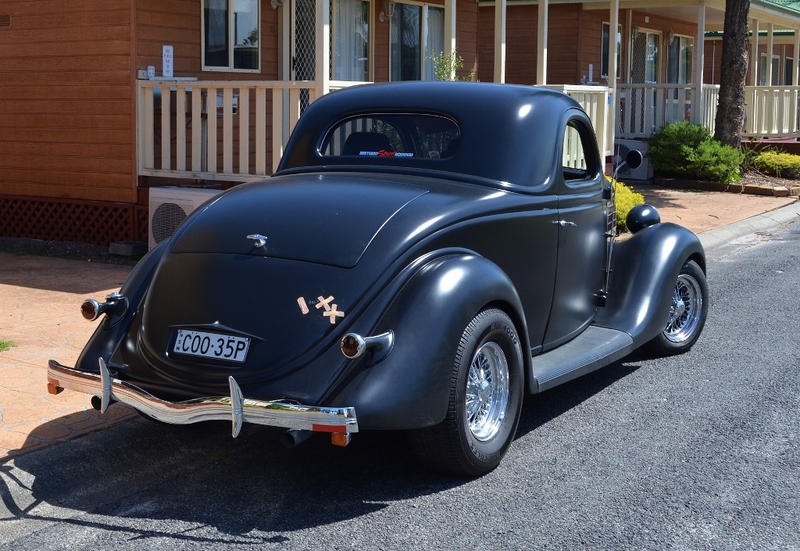 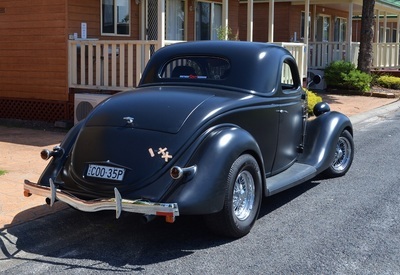 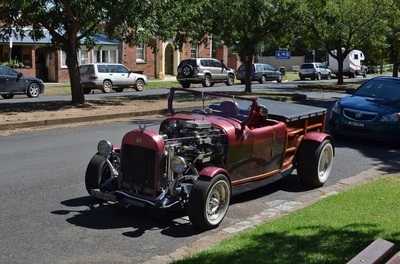 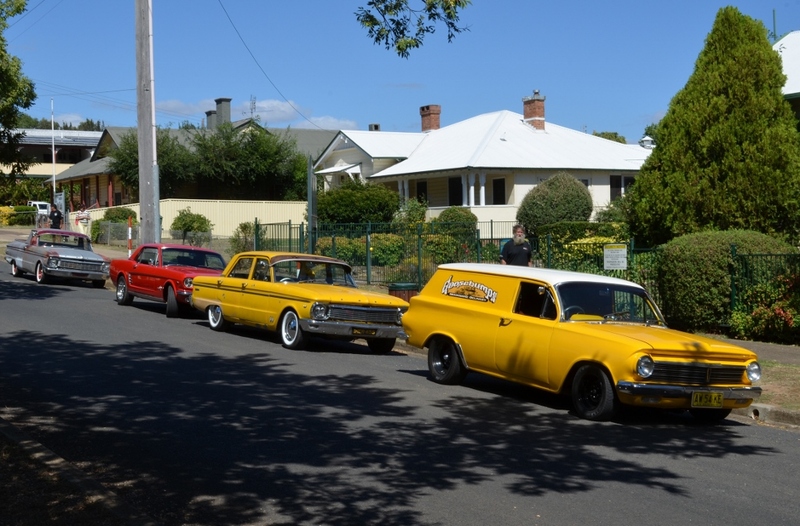 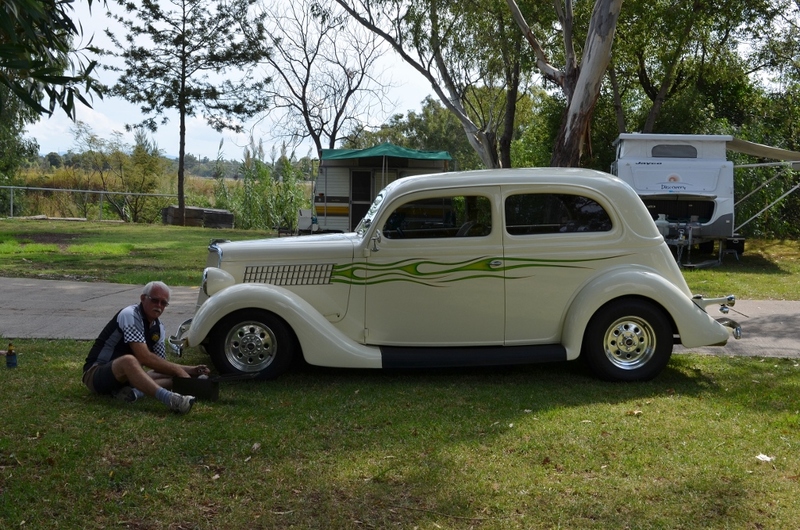 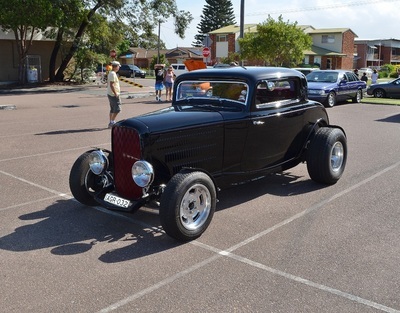 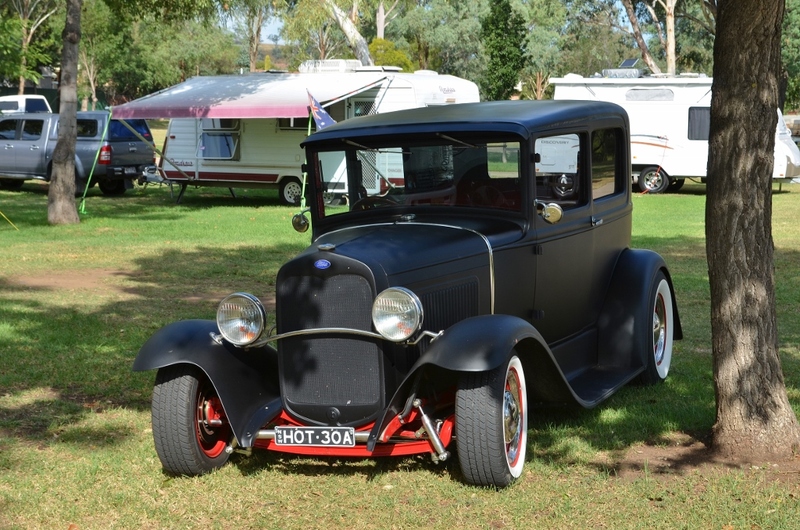 The Outlaw Hot Rod Club held their 20th Anniversary Rods on the Peel run at Tamworth in March this year. It was the first time our club had attended the run in numbers and what a great time we had with everyone saying they would be back again next year. 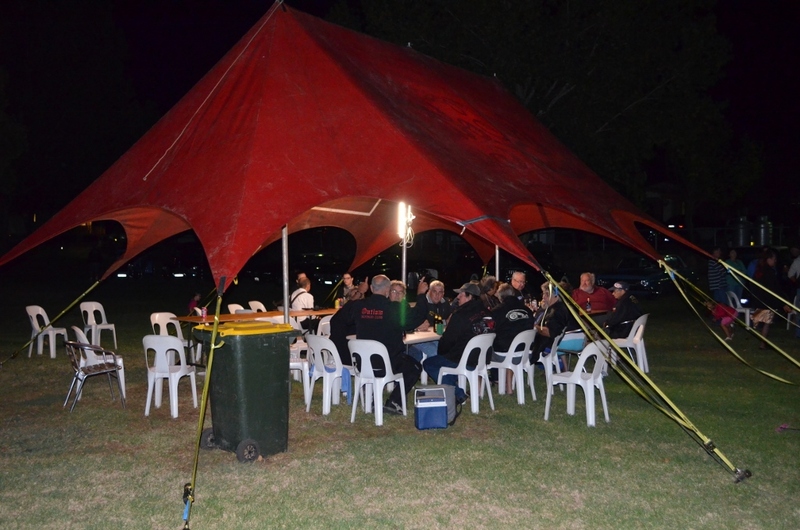 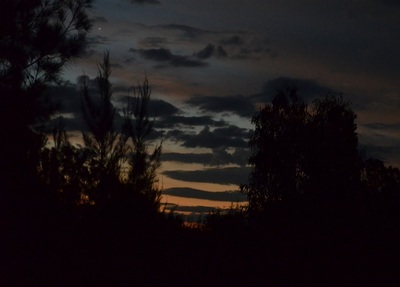 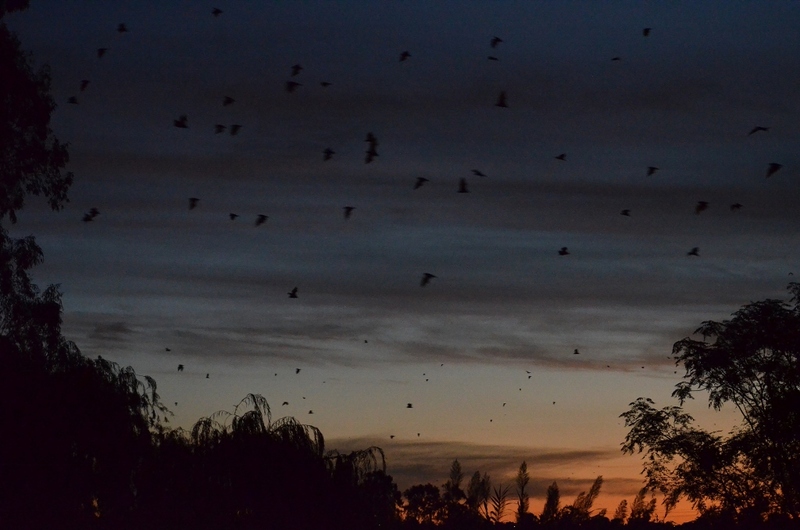 The run is held at a local caravan park where we had the registration on Friday and a sausage sizzle that evening. 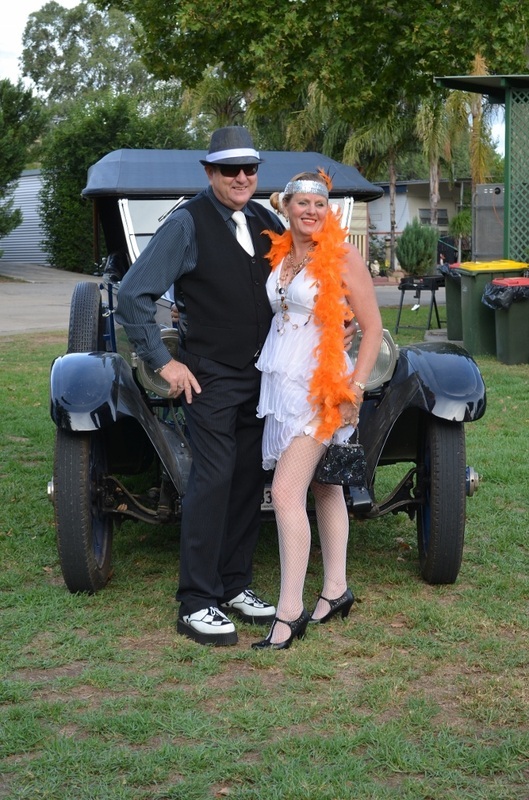 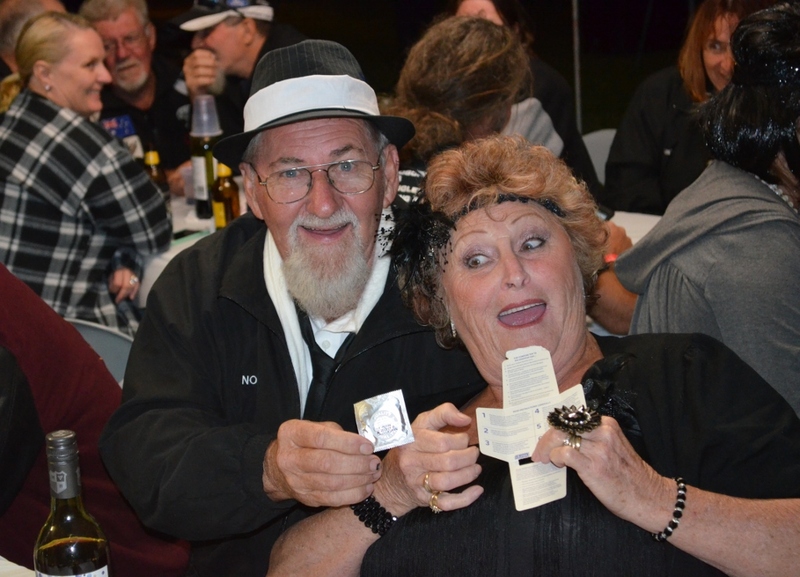 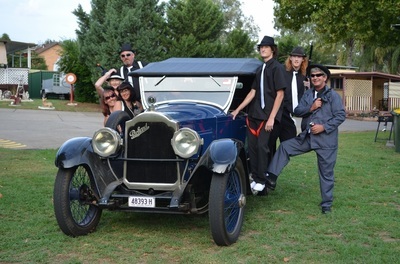 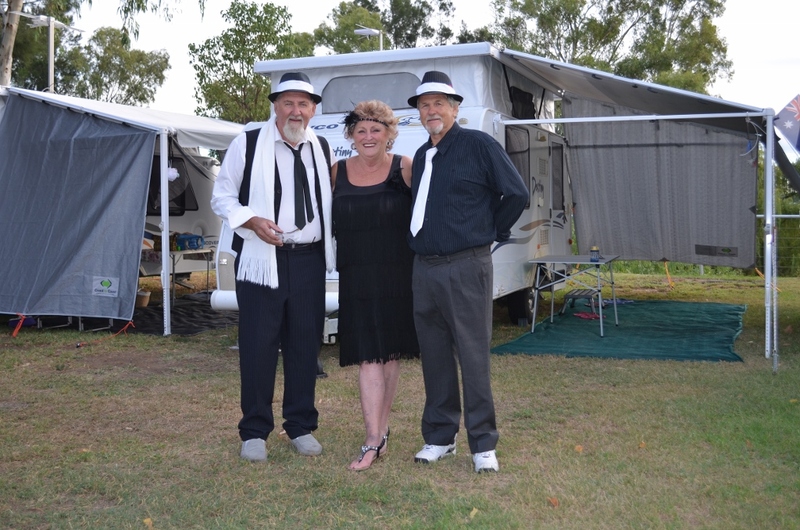 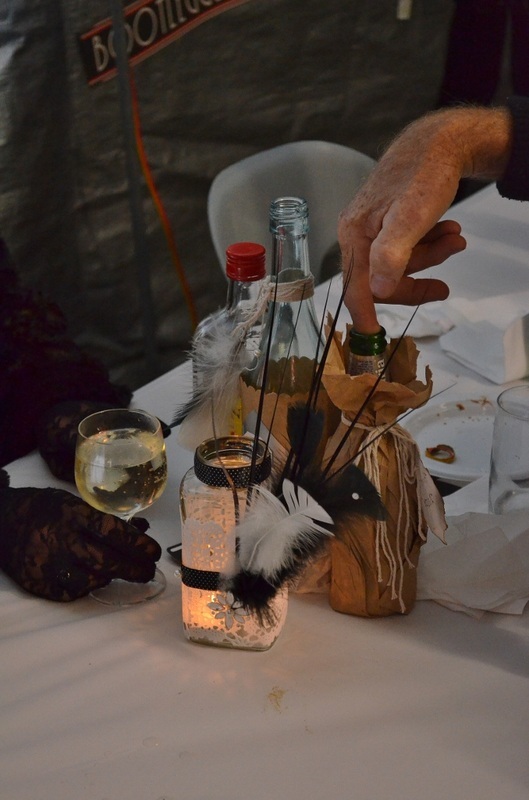 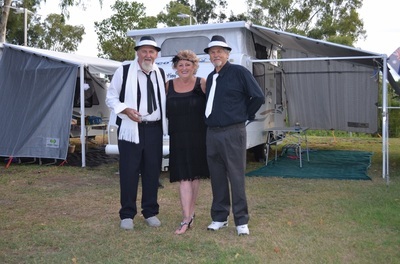 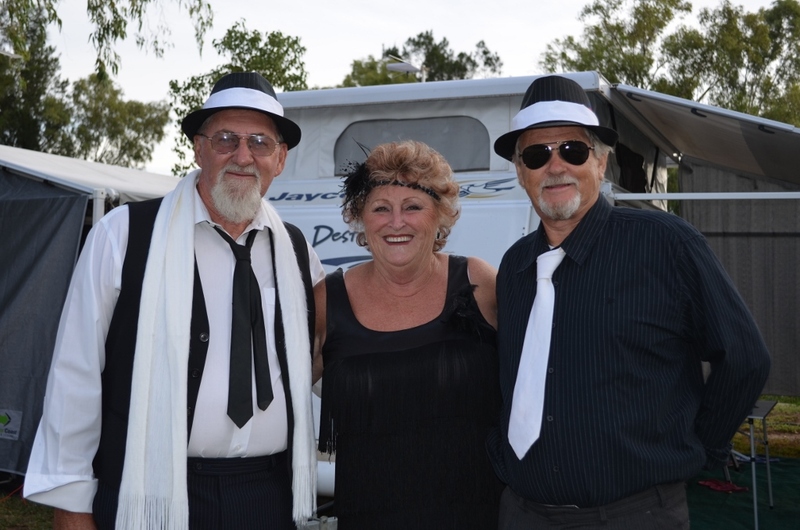 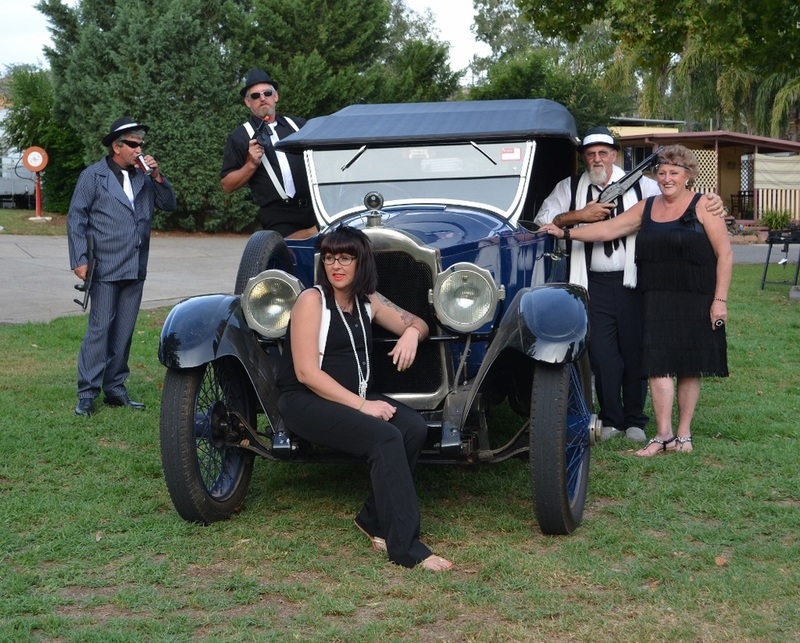 They had a 20's theme for the weekend and we were encouraged to dress up on the Friday night which was fun. They had a 3 piece band playing great music until about 11pm and everyone had a fantastic night. 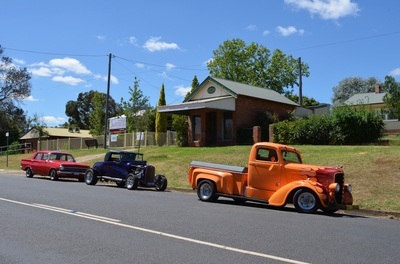 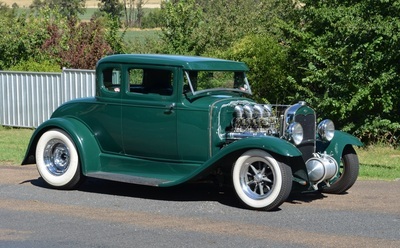 On Saturday, after being given a bacon & egg breakfast, they had a poker run to Nundle where we had lunch with some going to the pub while others went to the mine museum. 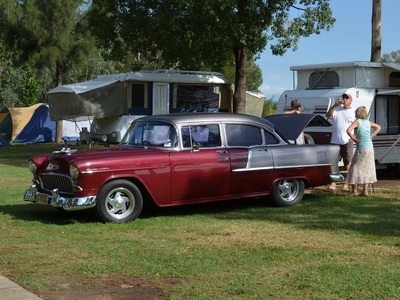 From here it was back to cruise the park for a couple of hours before tea which was a very nice roast dinner. They had a movie night which featured the Great Gatsby. 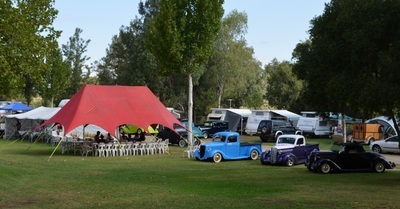 On Sunday it was breakfast then presentation before most left to go home. Glenda was lucky enough to be placed in the top 5 and a fibreglass 28 grill was the trophy, she was over the moon to have won. 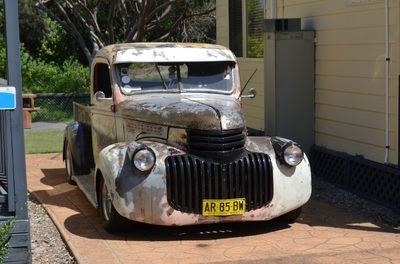 A fantastic weekend with the only complaint being the condition of our country roads. 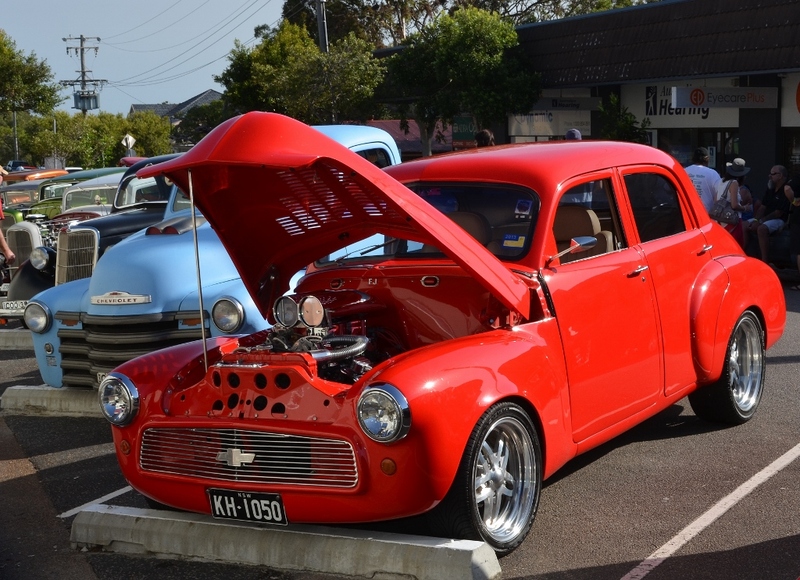 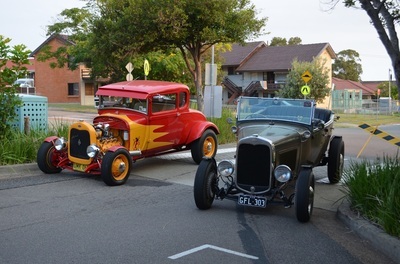 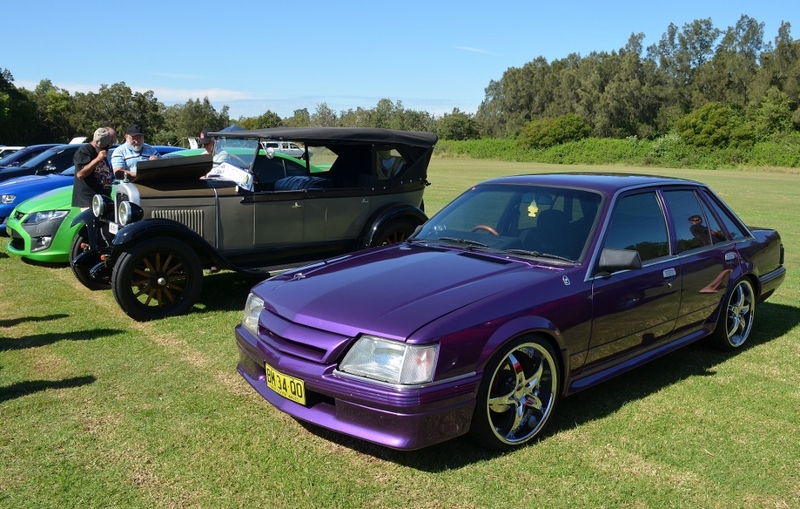 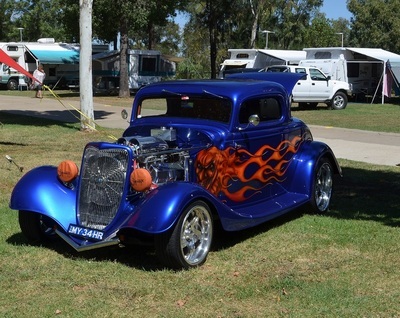 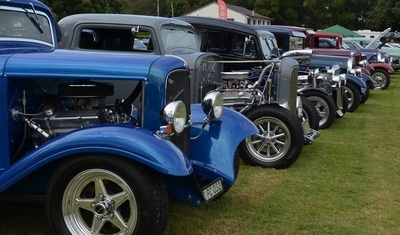 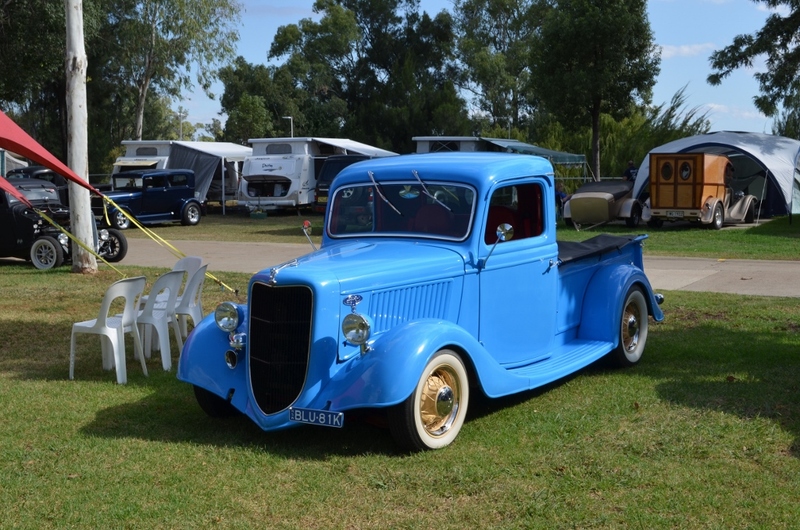 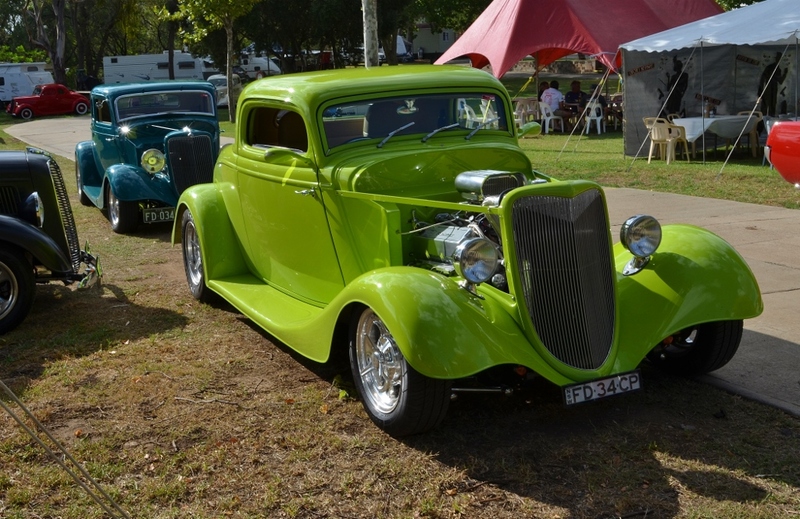 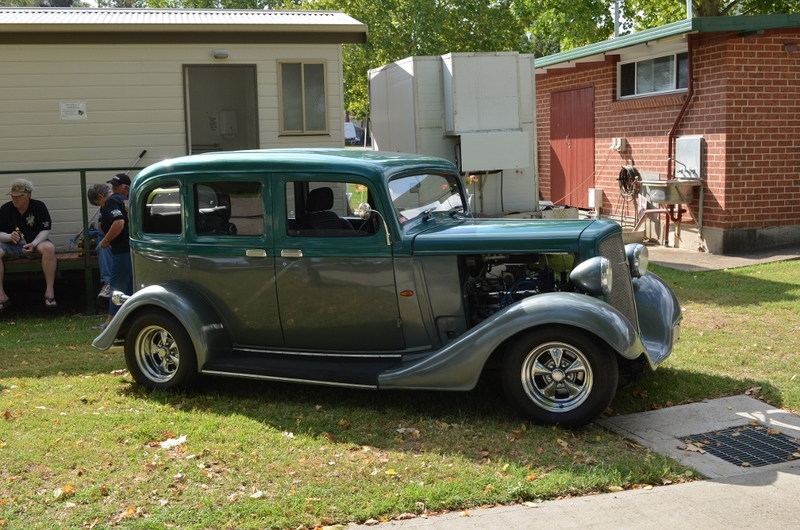 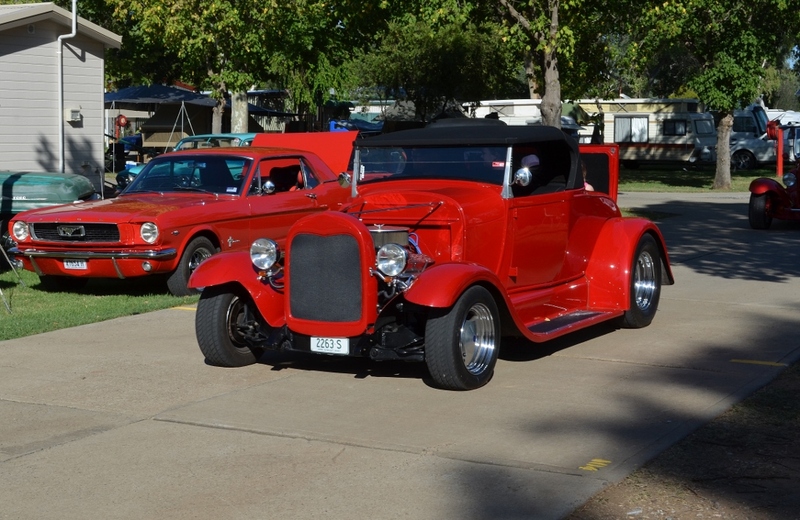 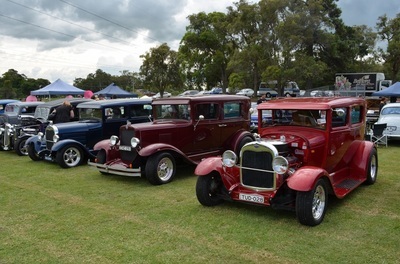 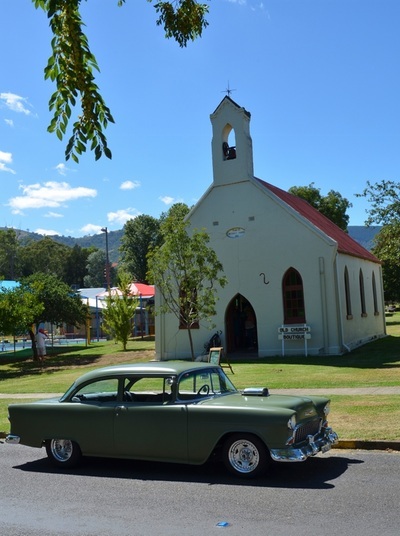 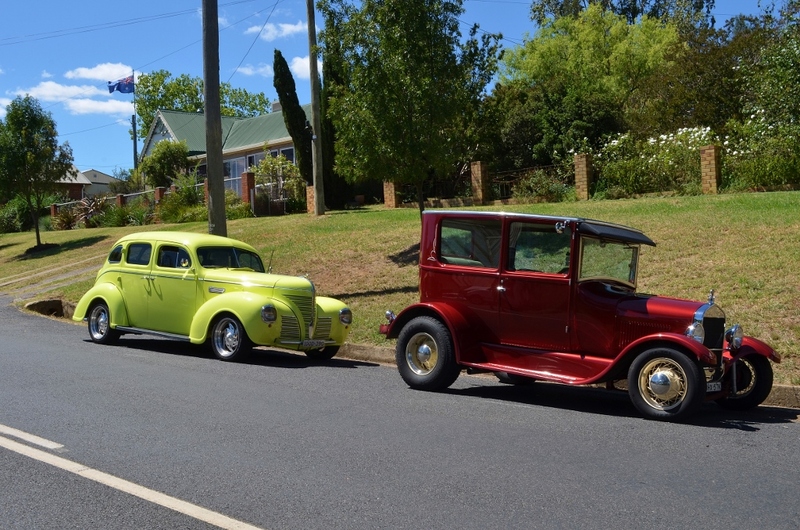 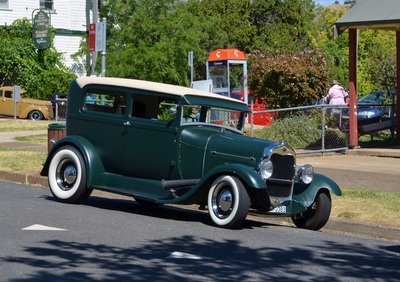 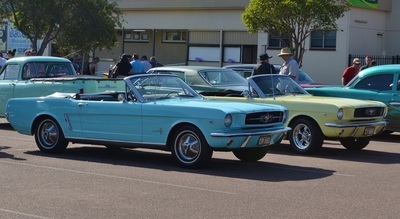 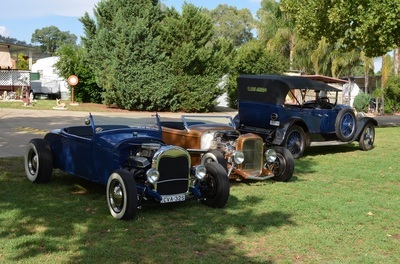 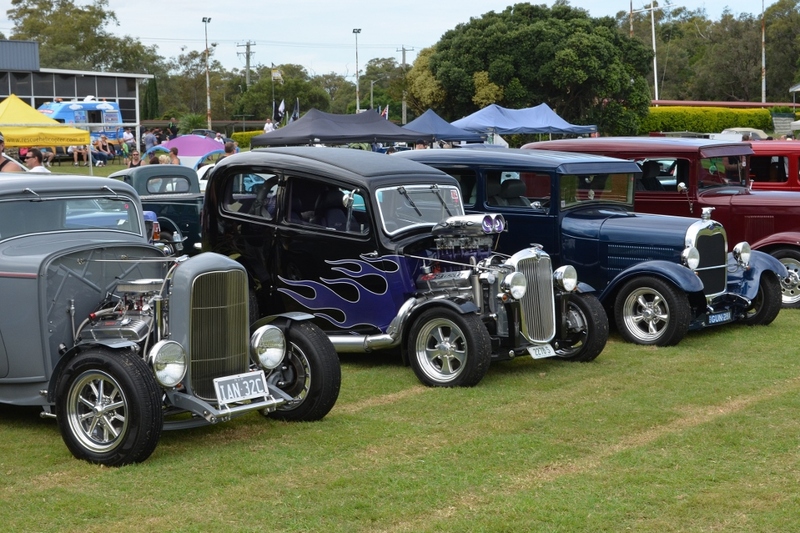 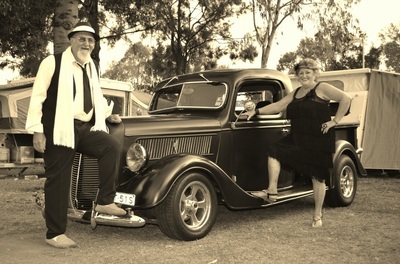 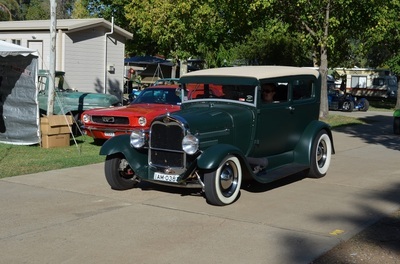 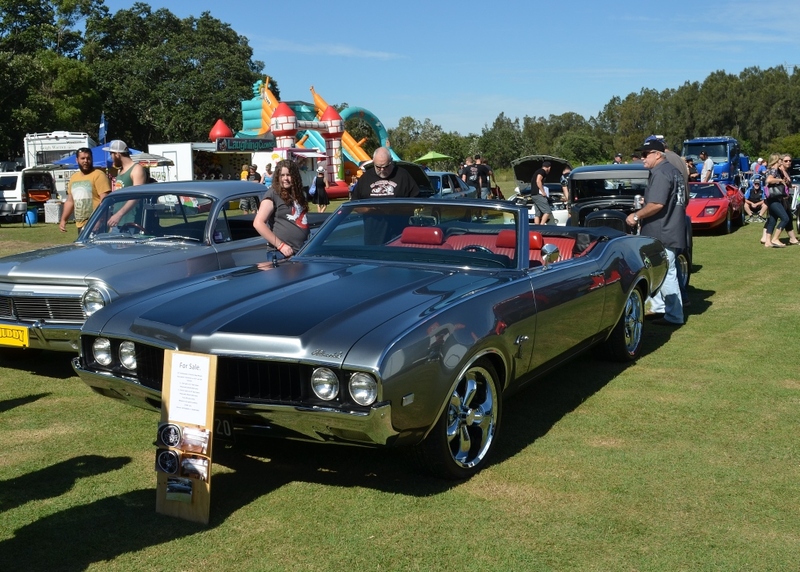 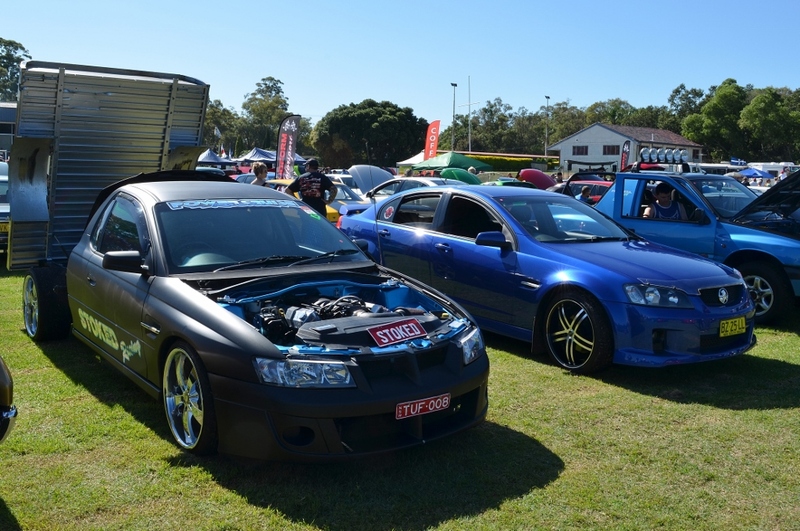 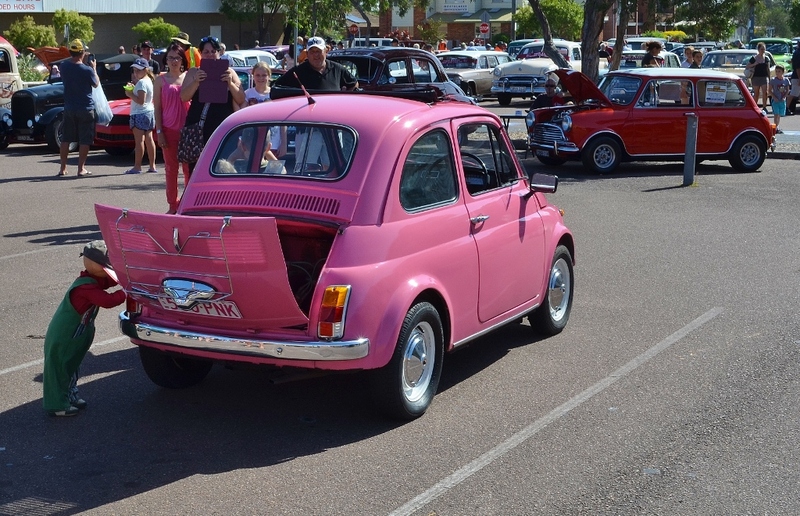 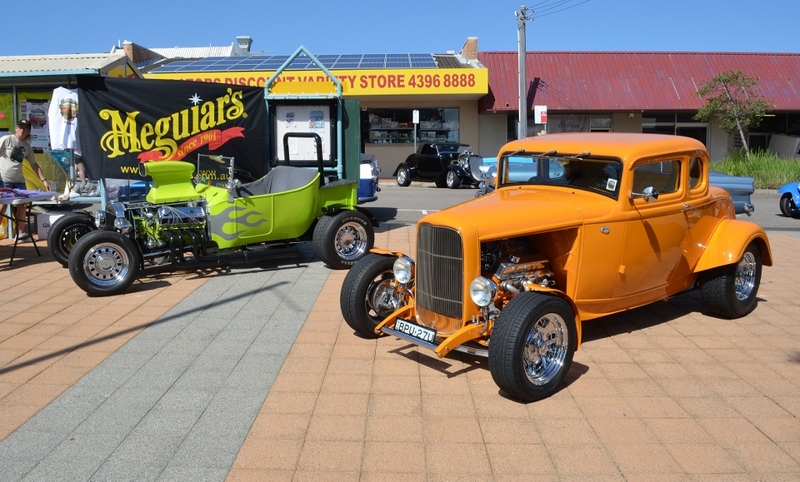 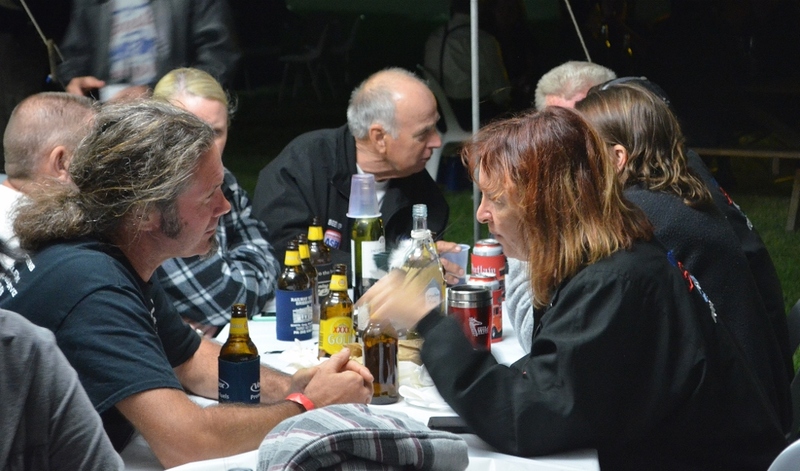 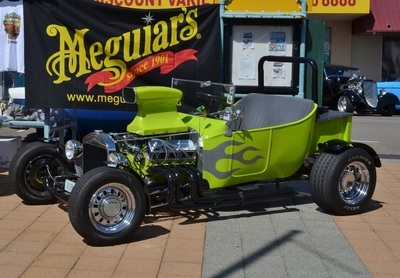 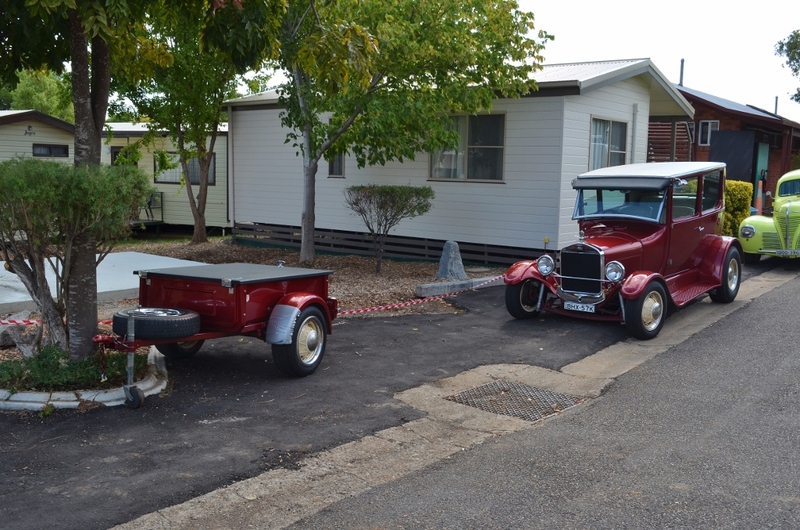 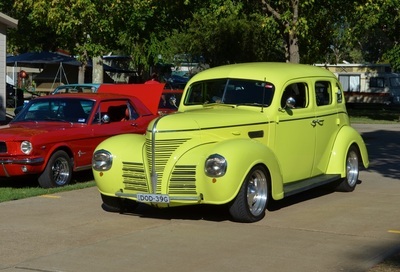 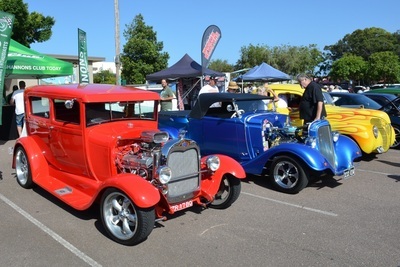 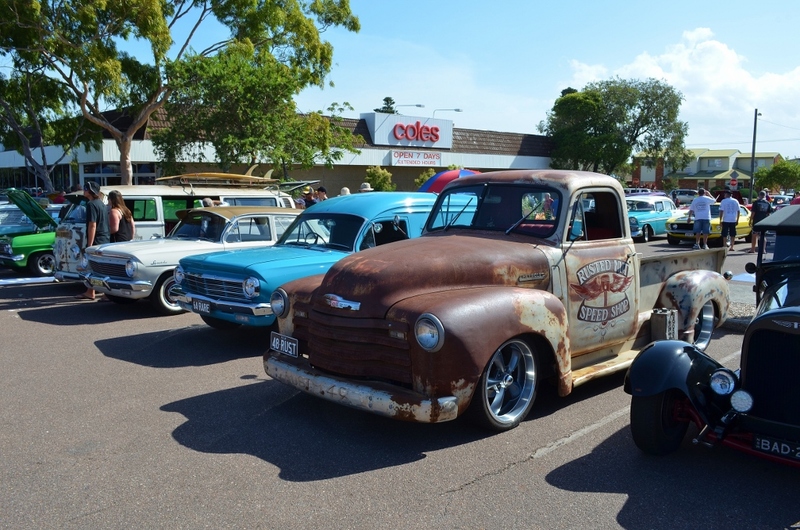 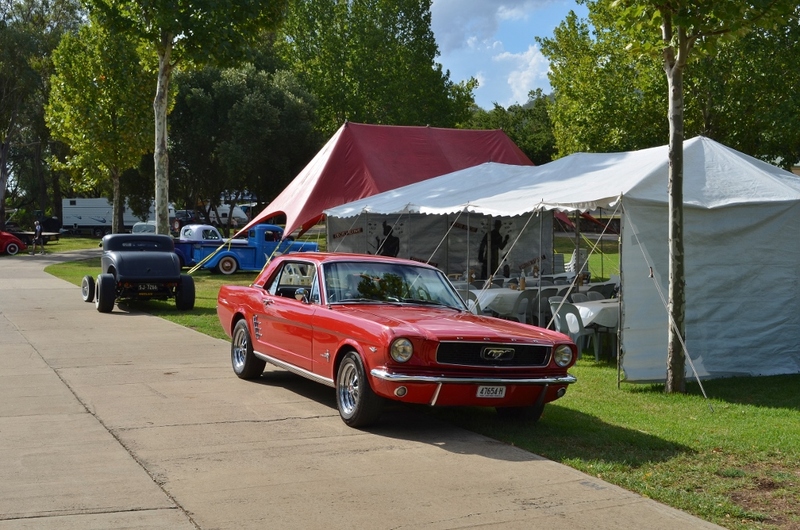 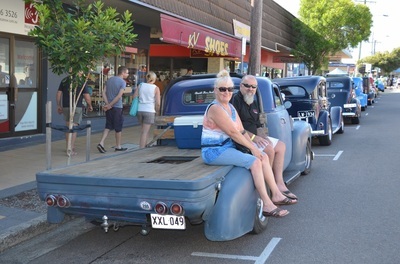 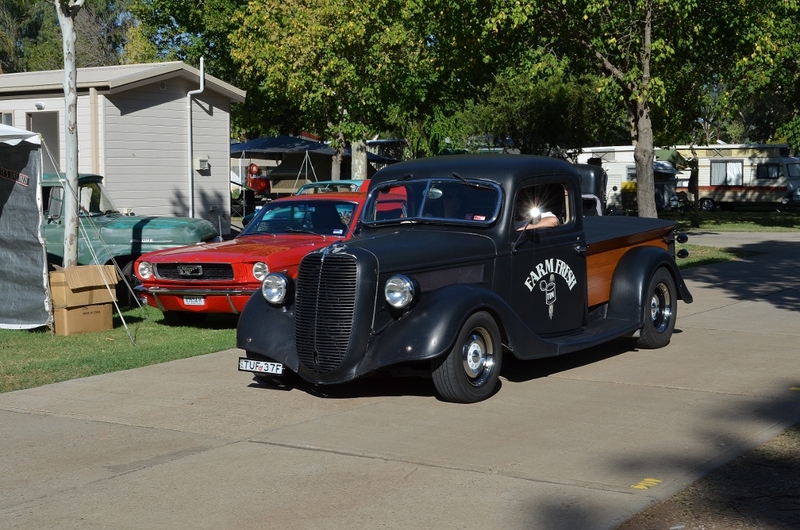 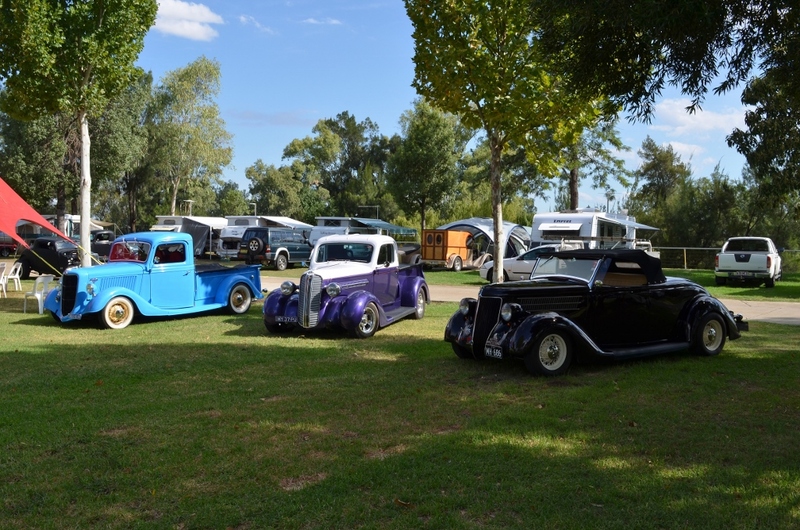 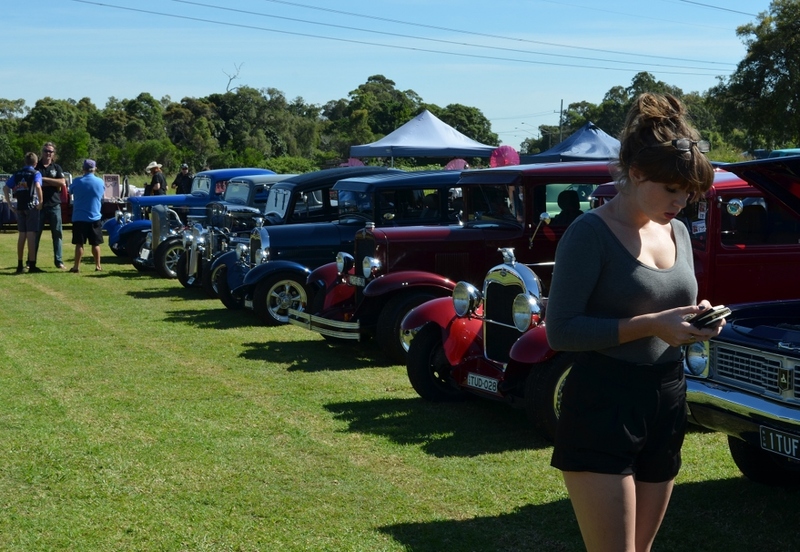 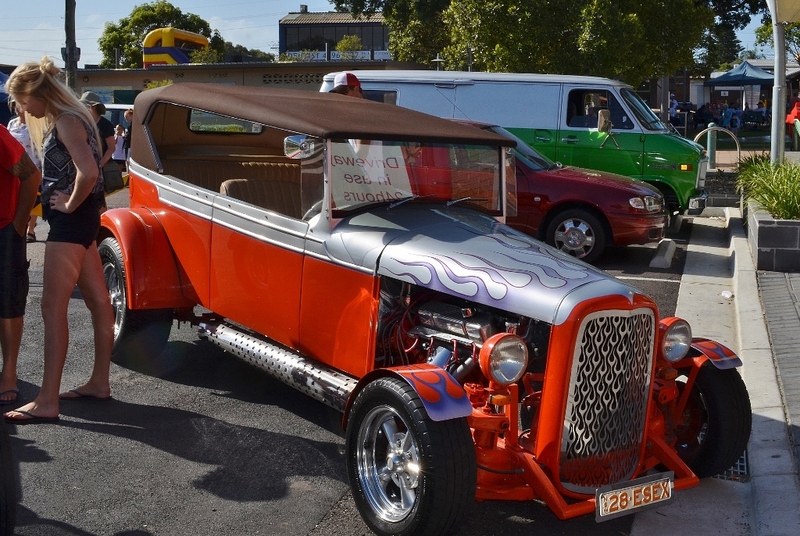 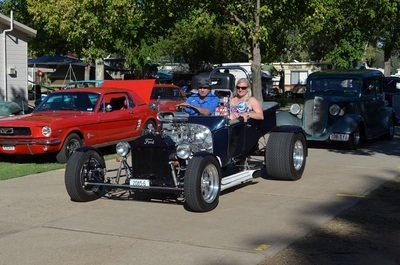 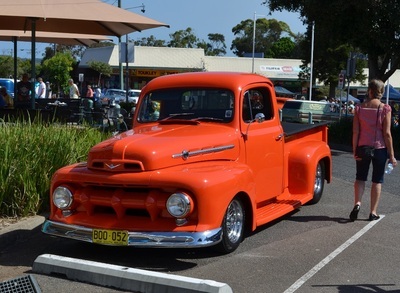 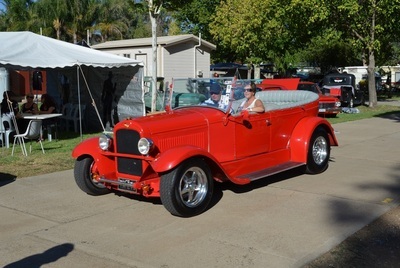 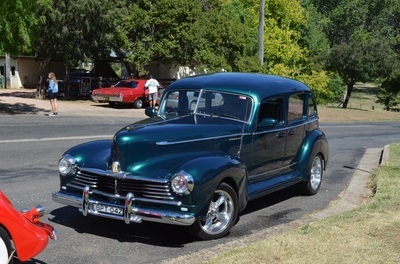 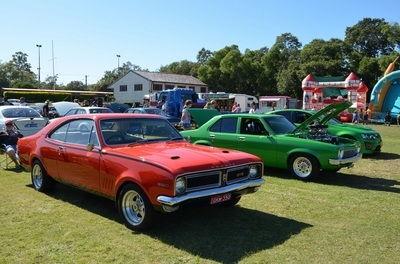 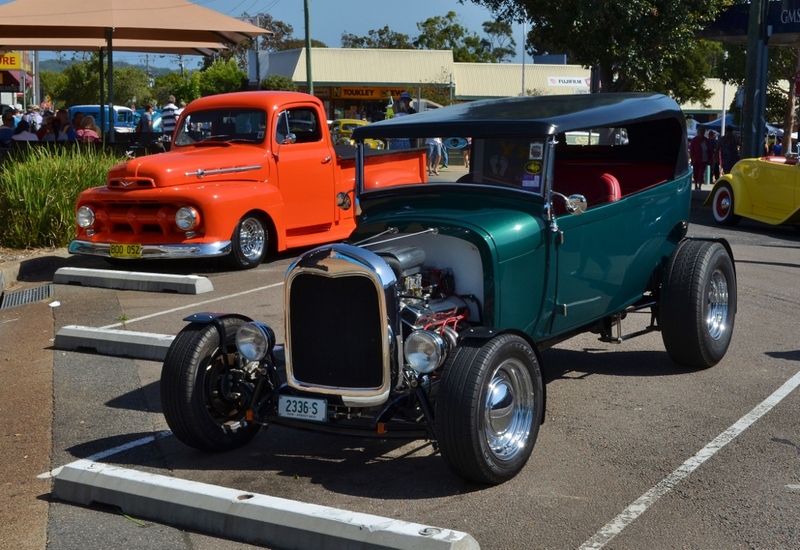 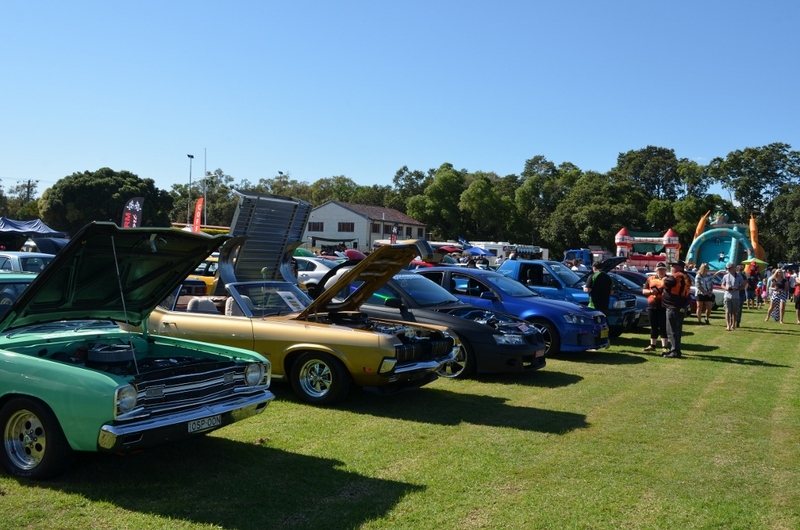 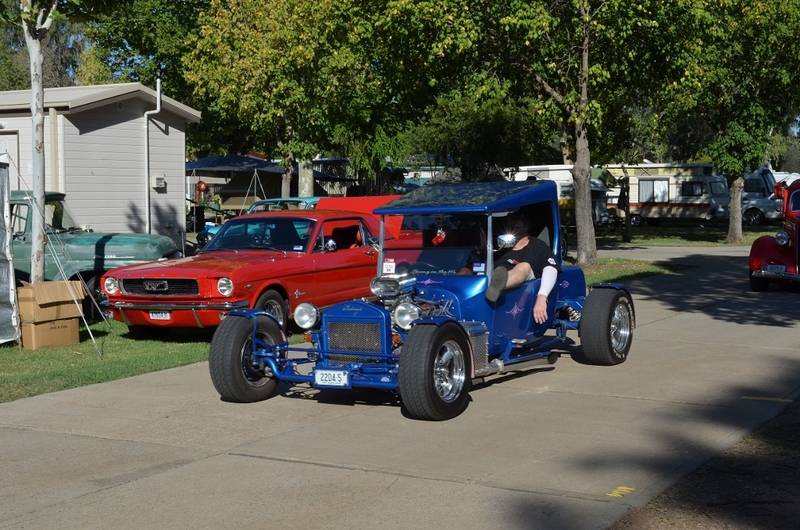 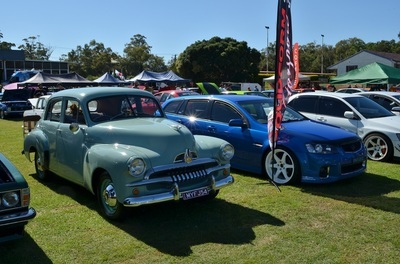 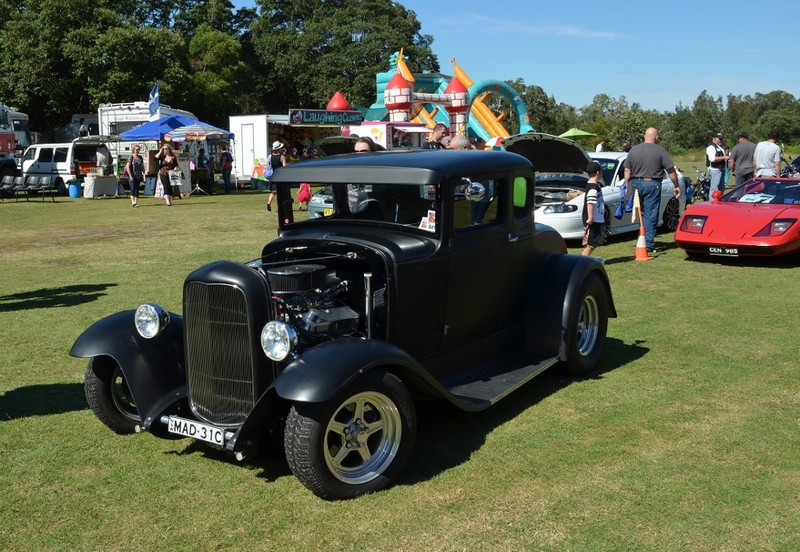 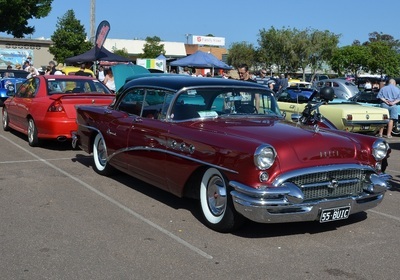 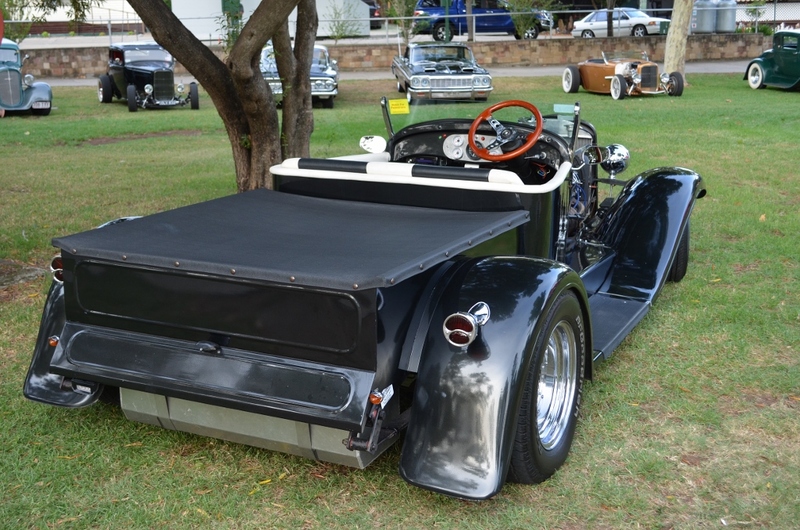 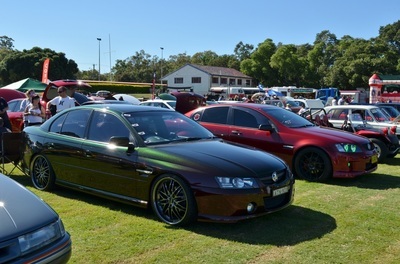 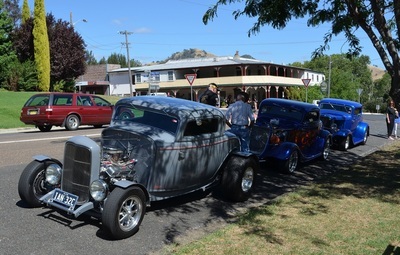 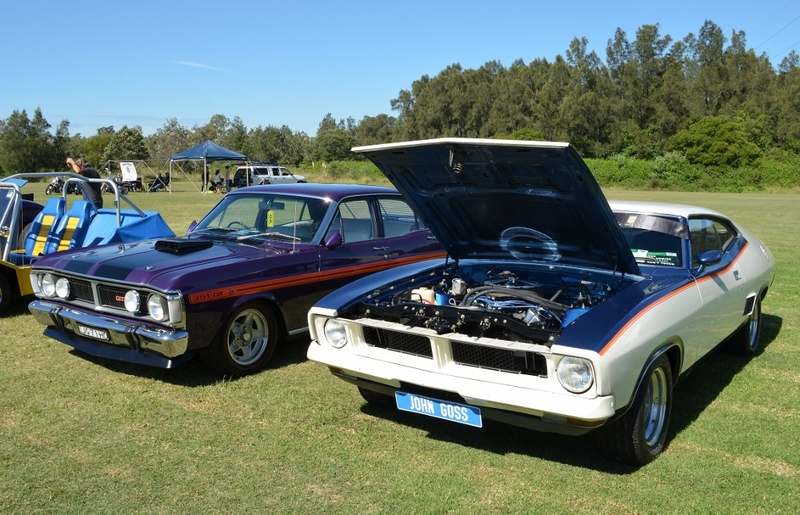 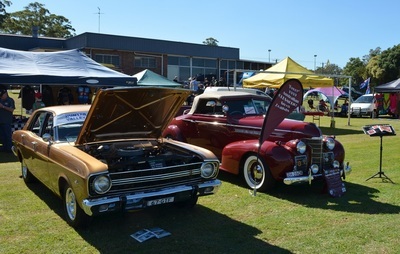 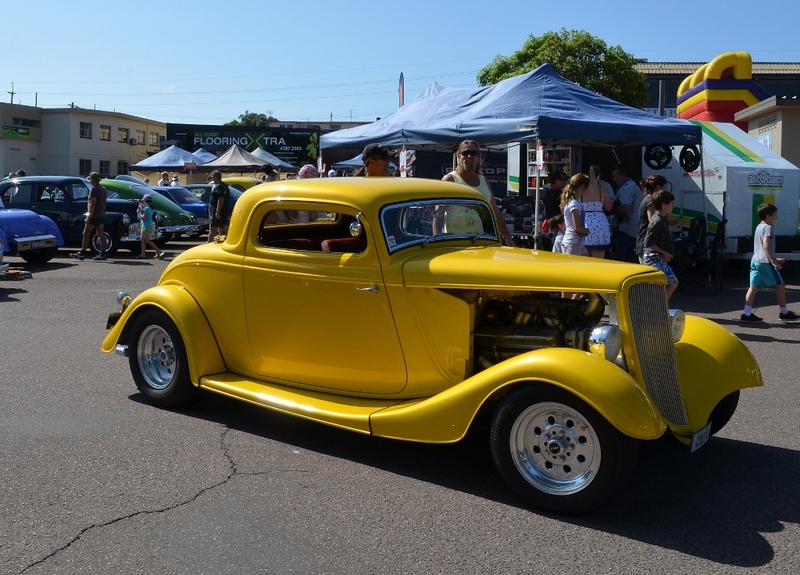 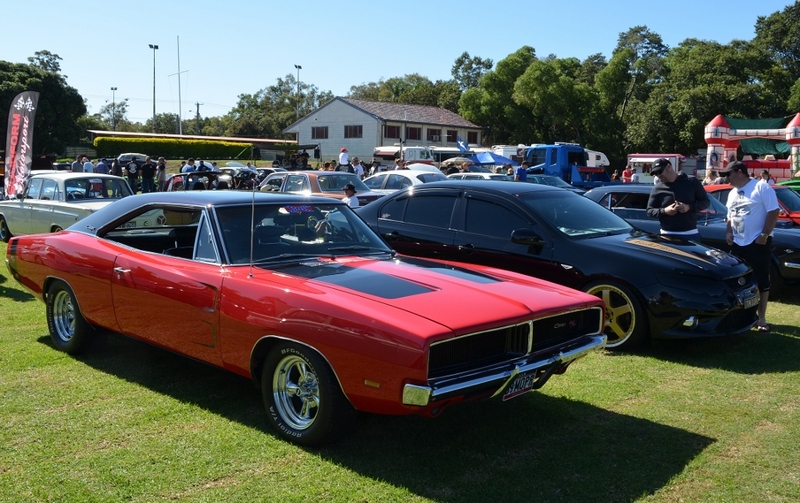 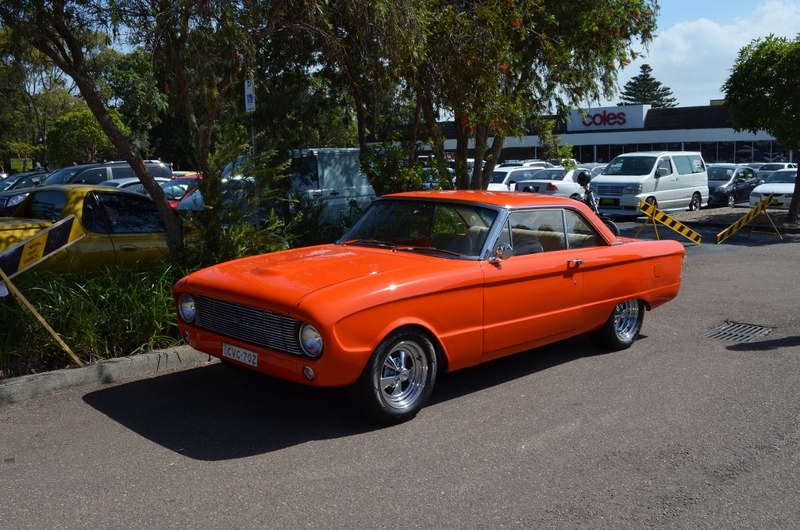 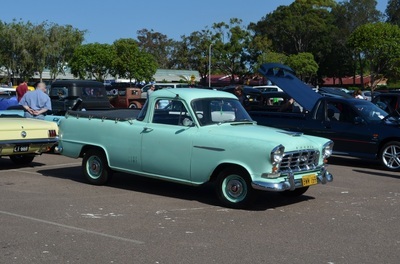 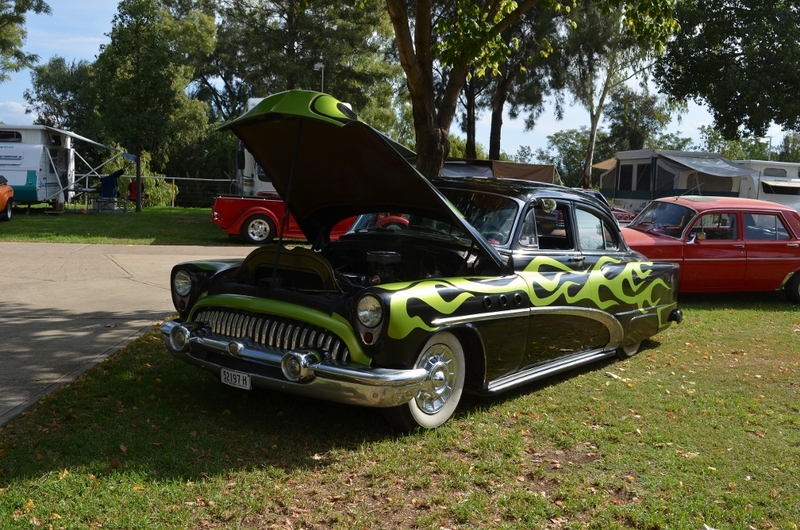 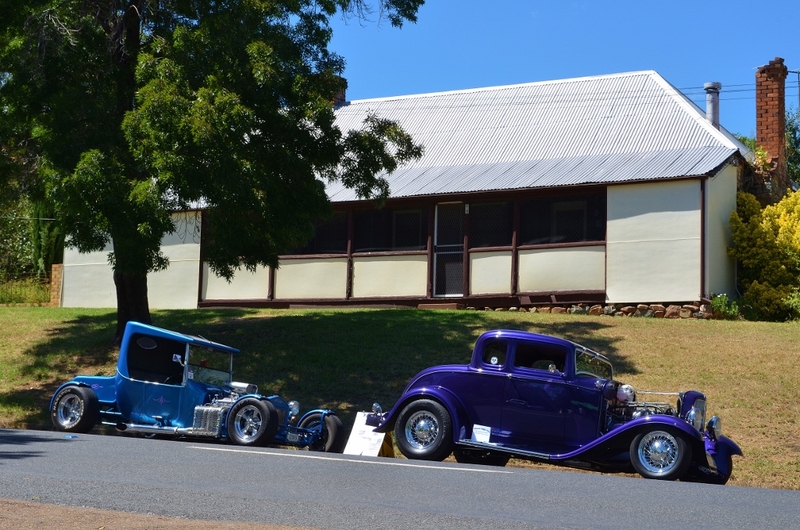 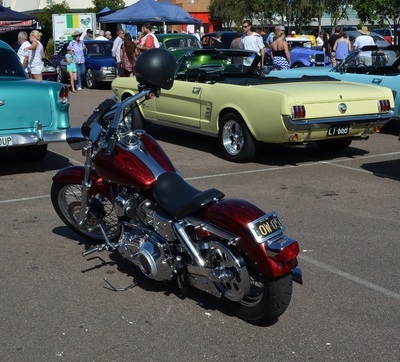 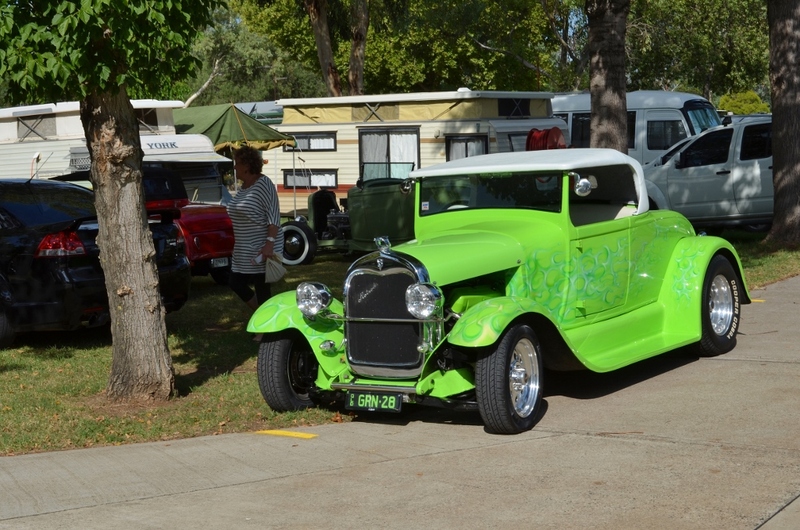 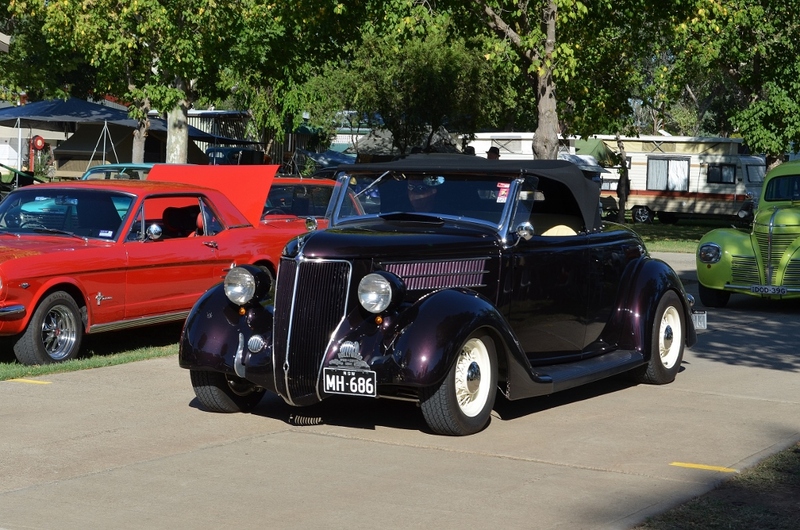 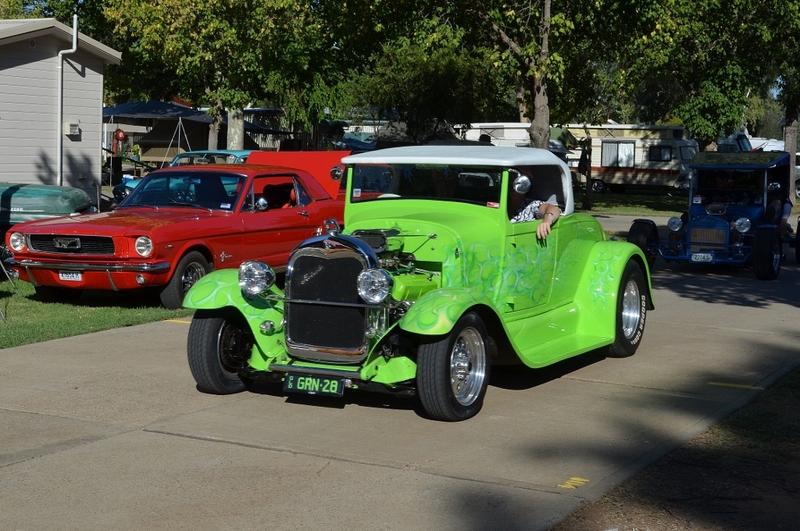 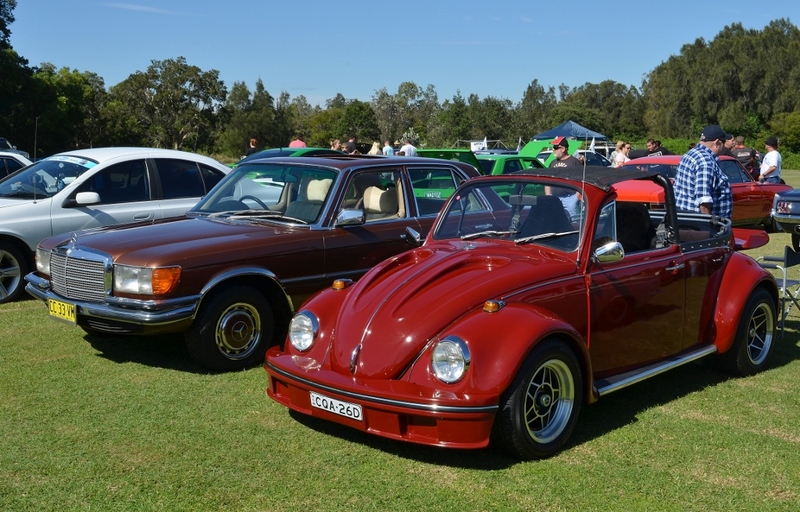 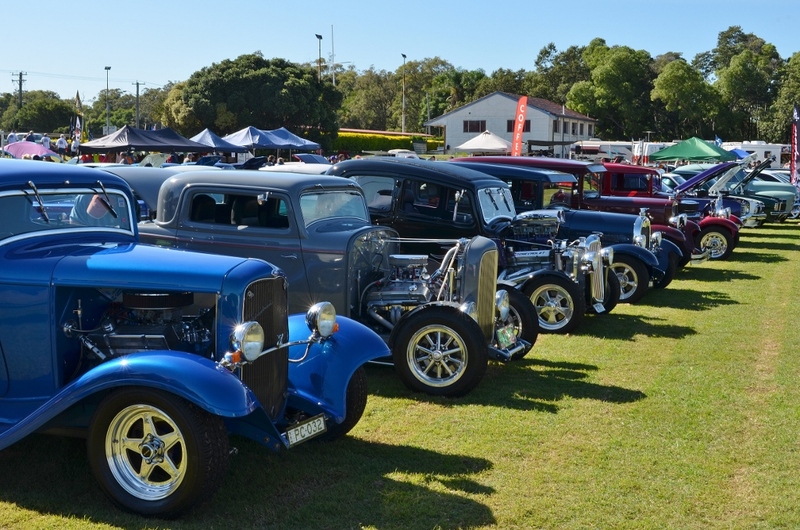 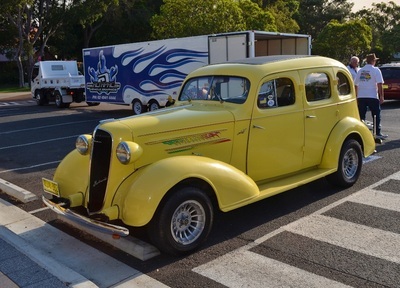 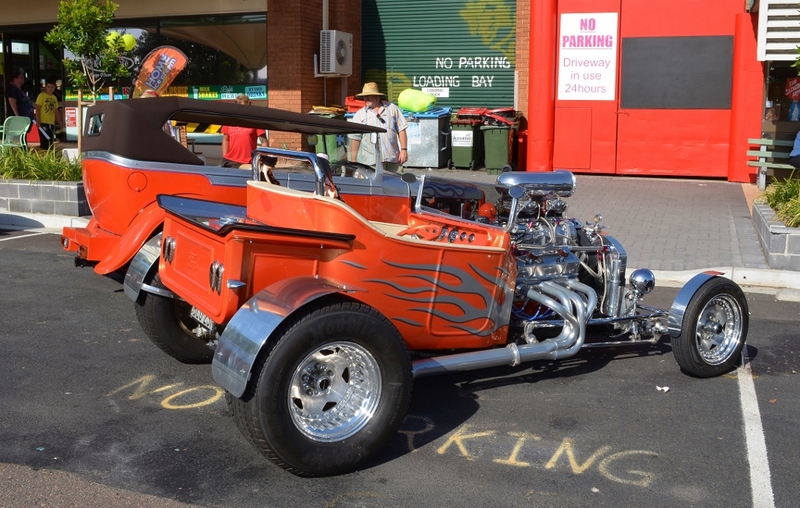 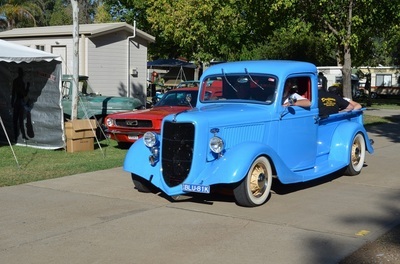 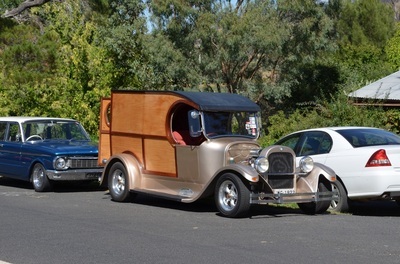 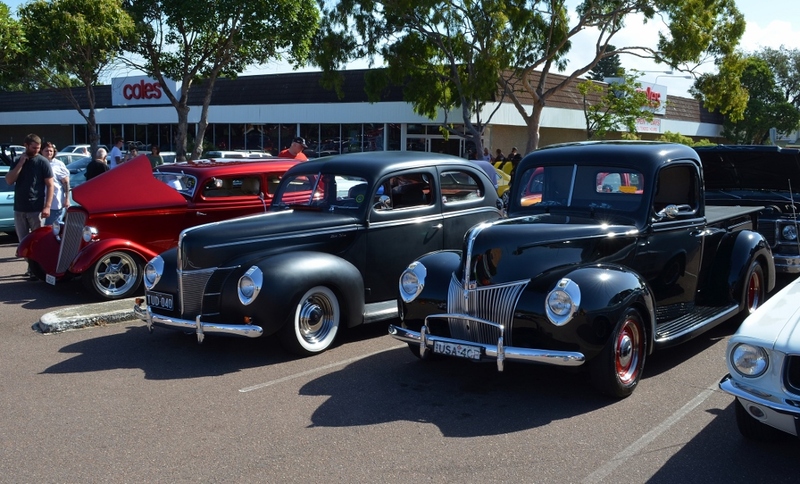 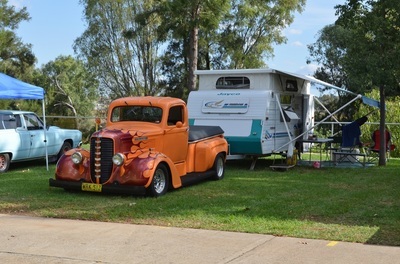 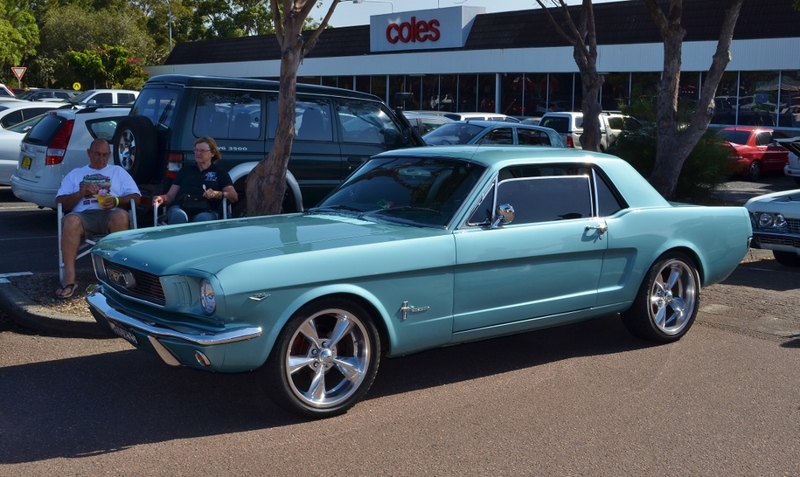 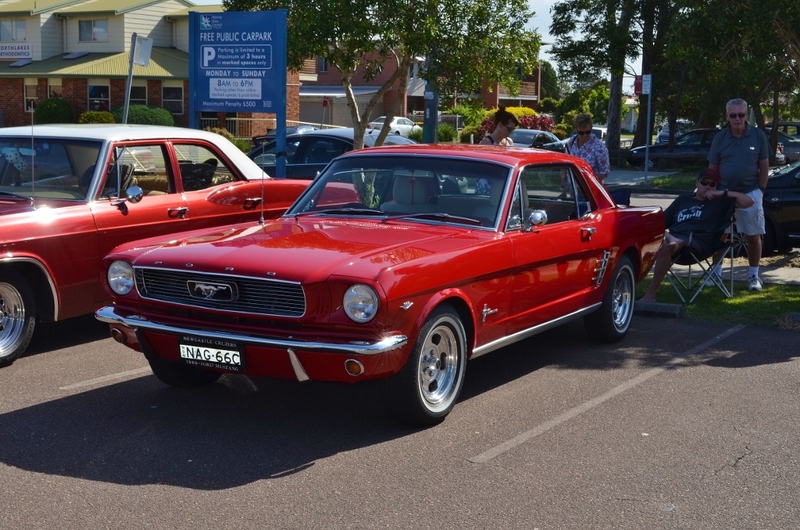 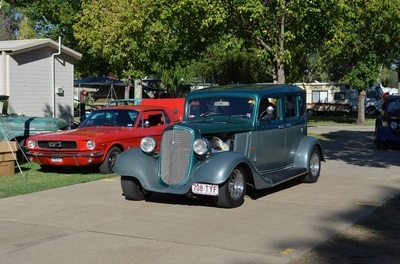 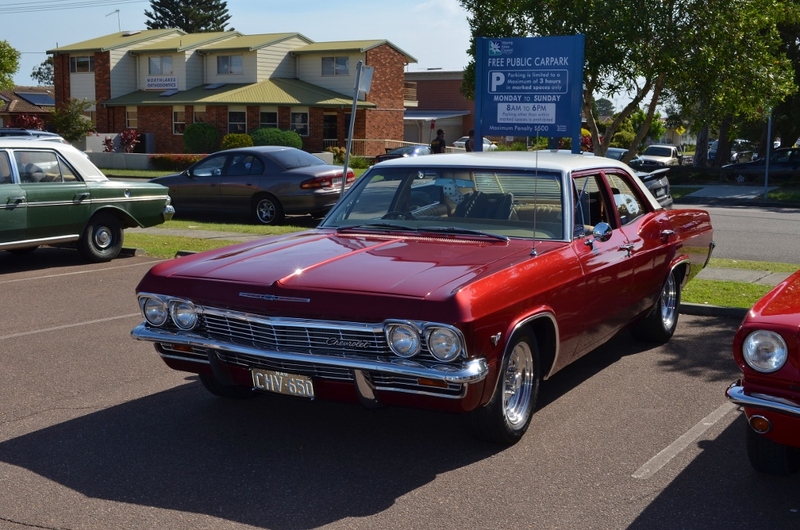 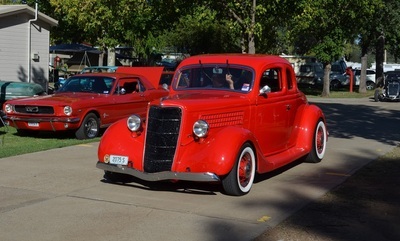 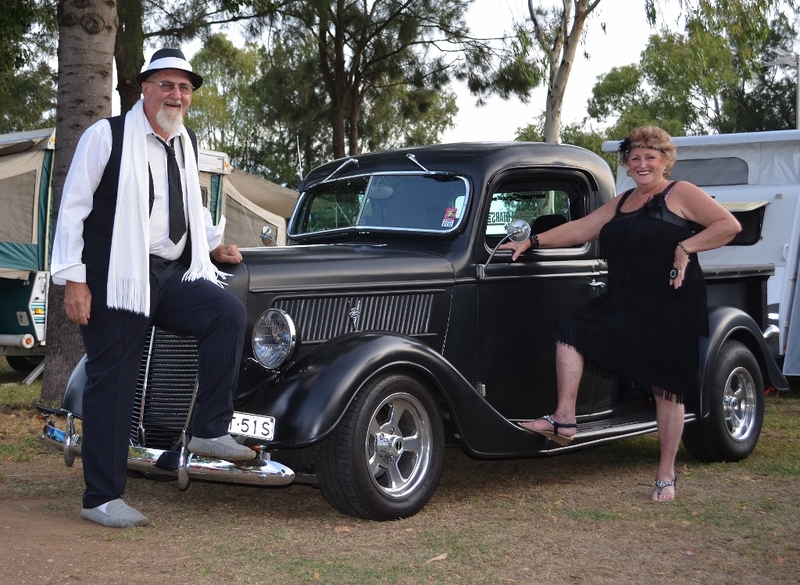 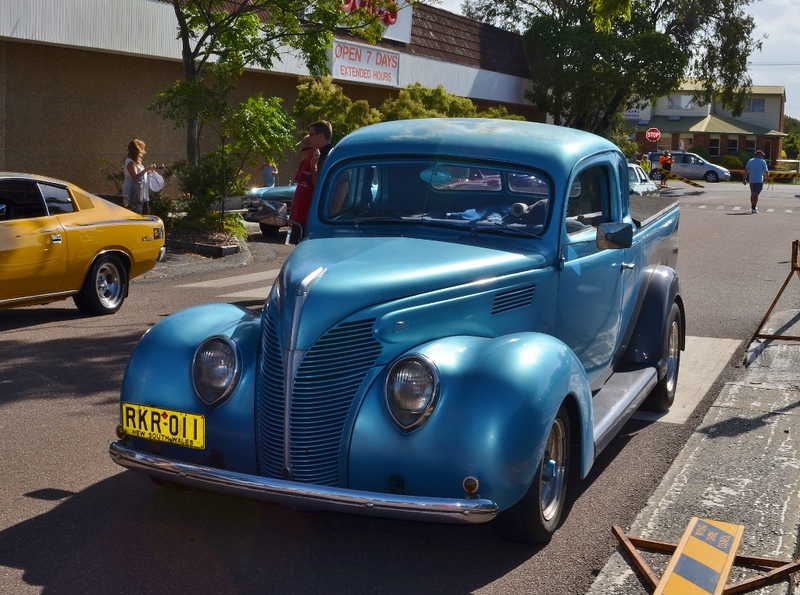 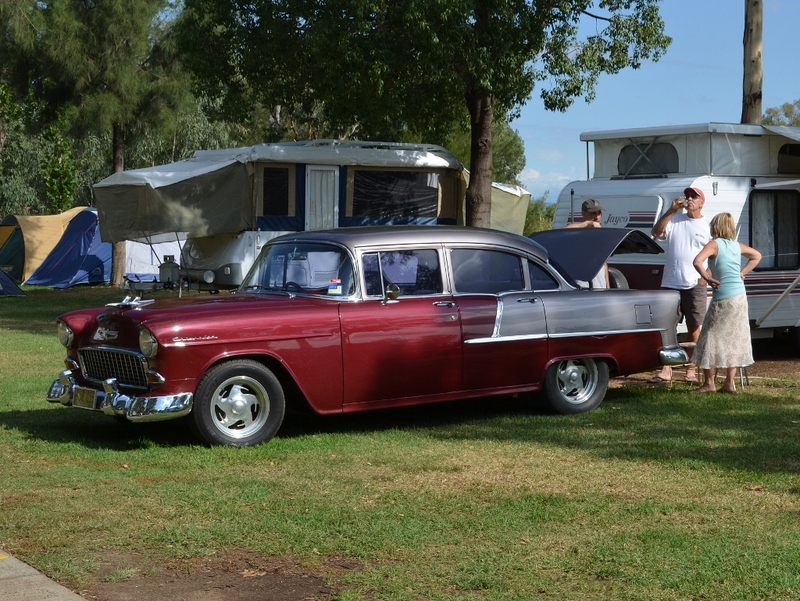 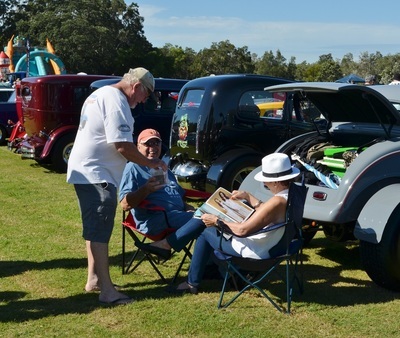 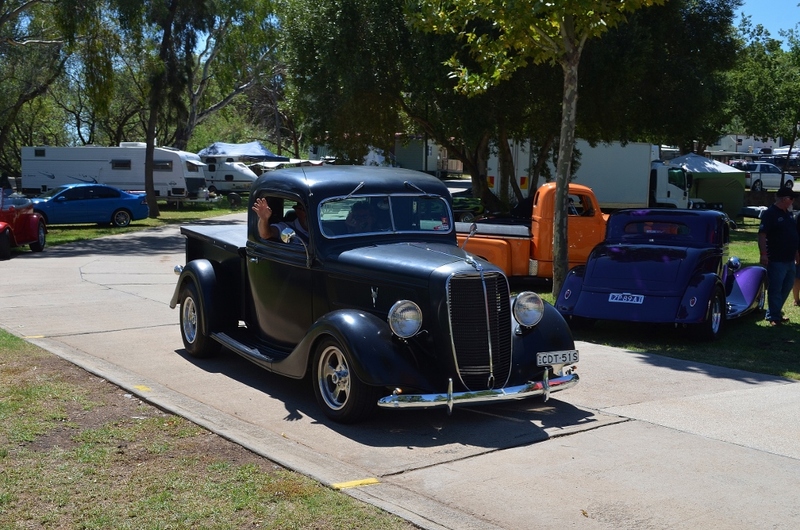 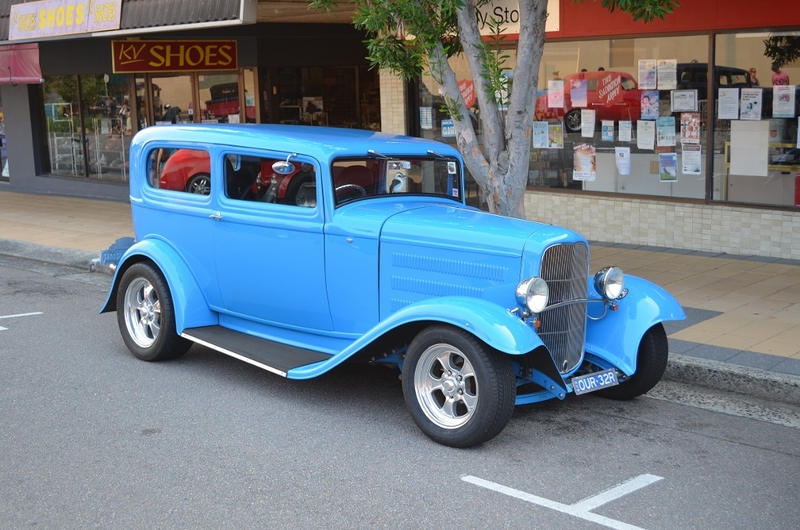 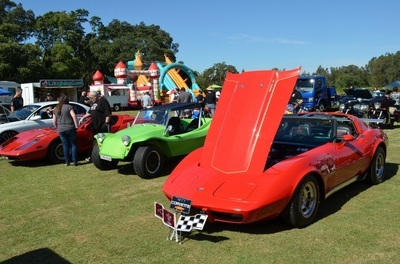 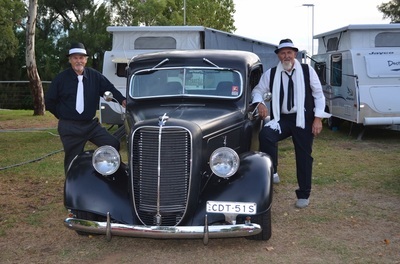 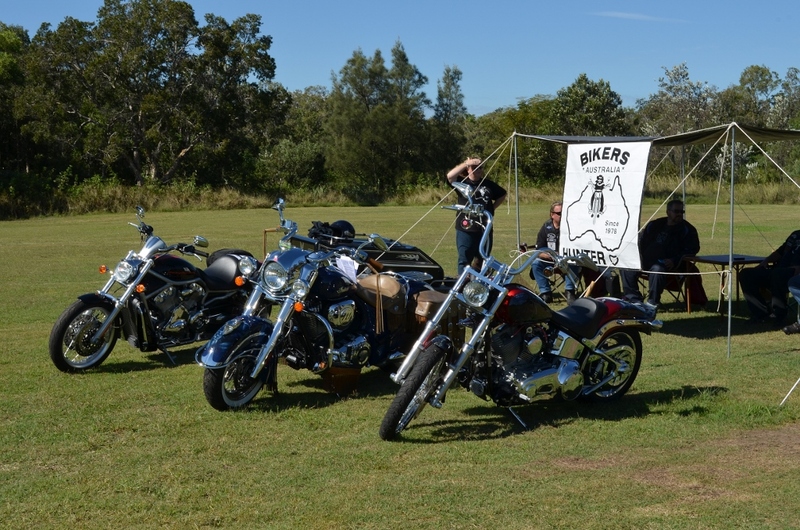 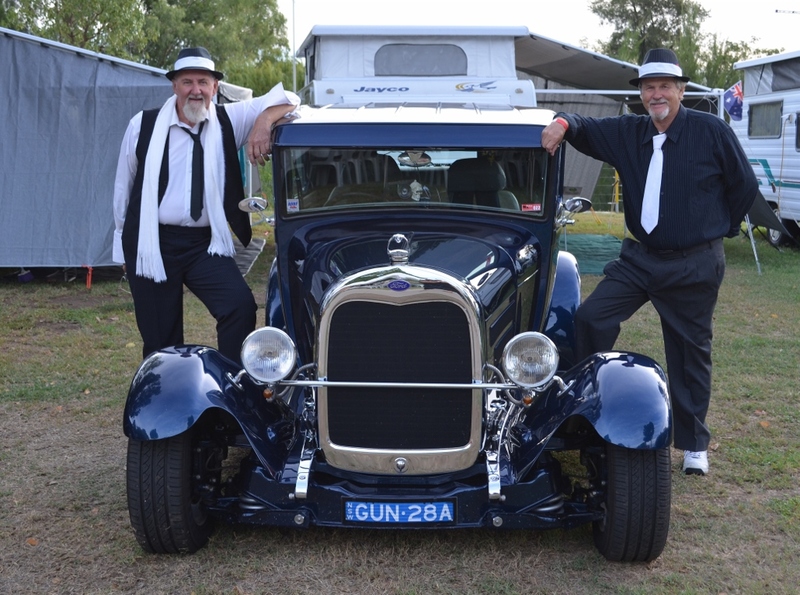 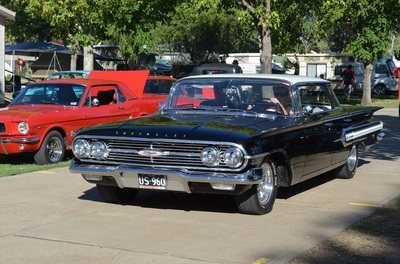 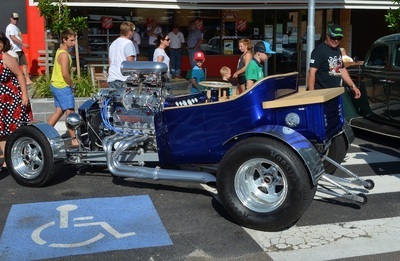 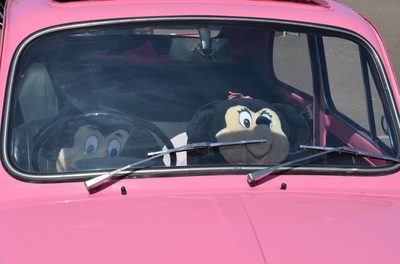 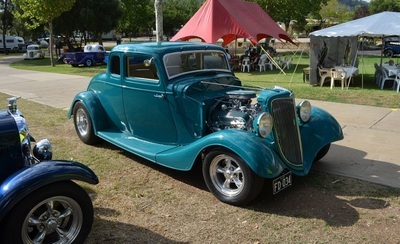 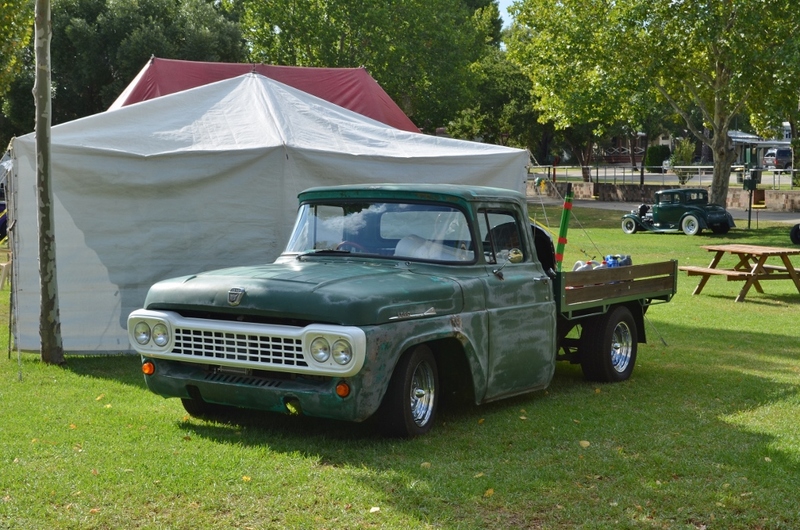 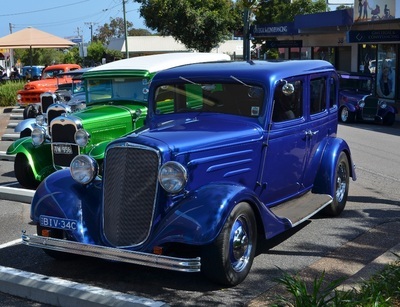 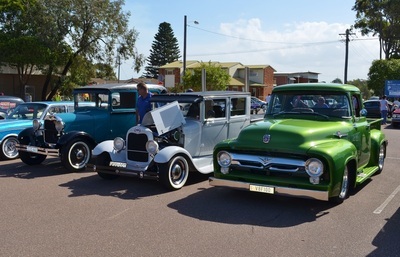 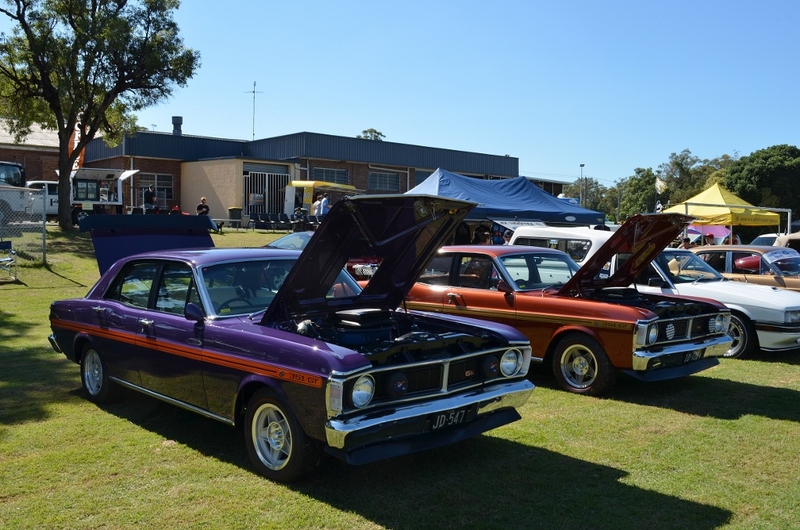 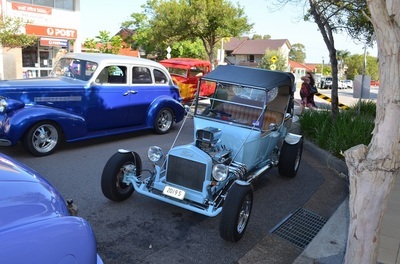 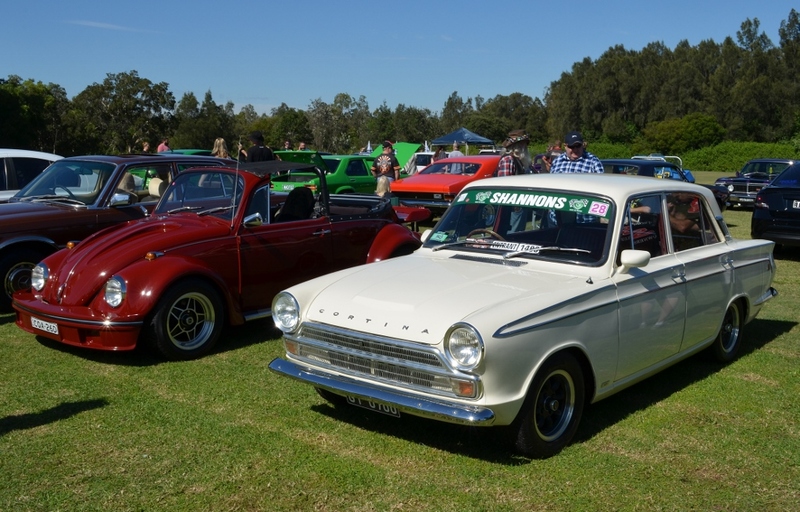 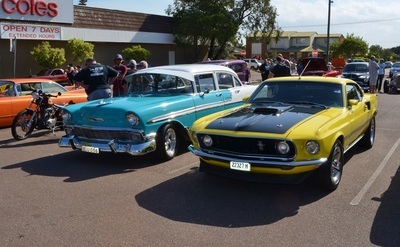 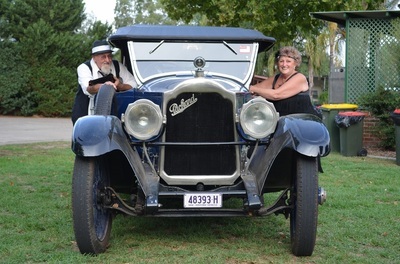 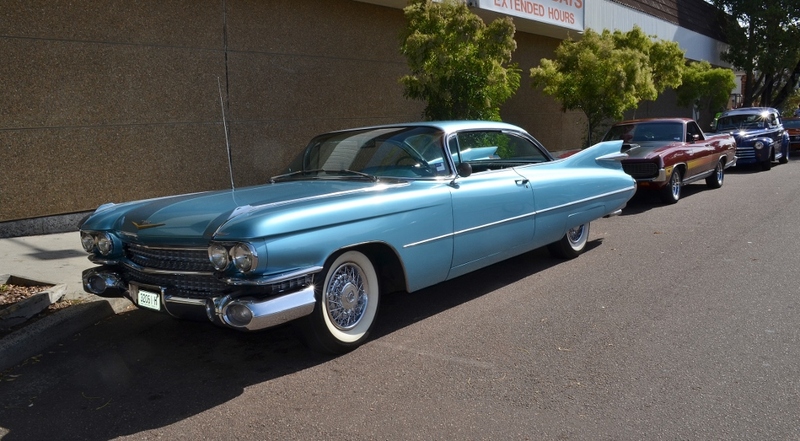 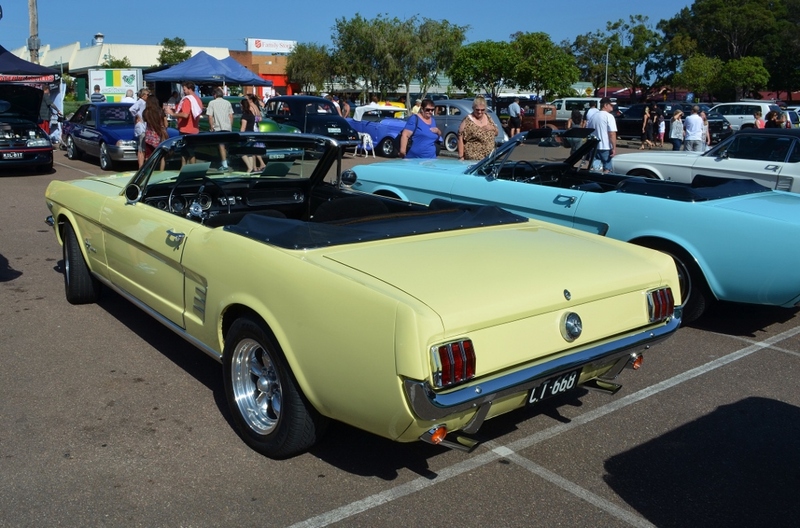 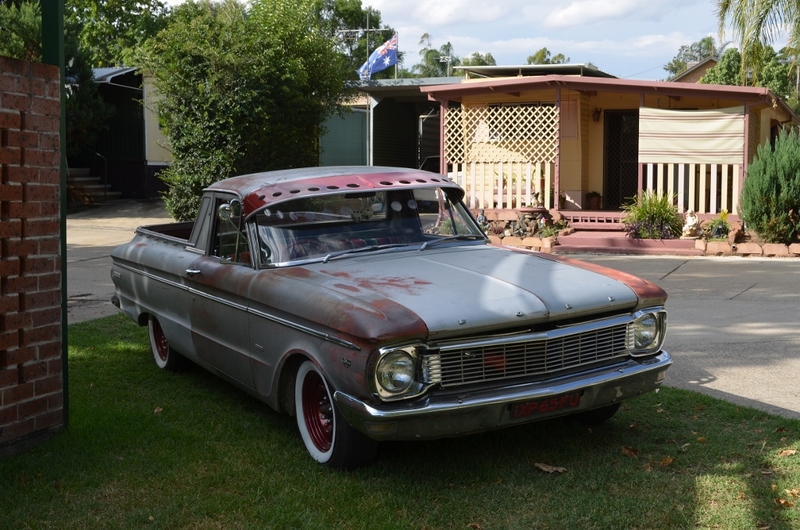 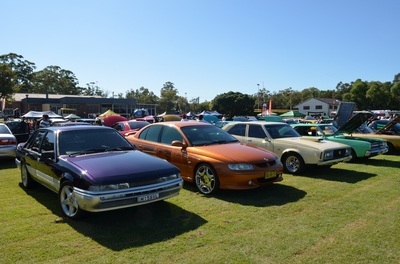 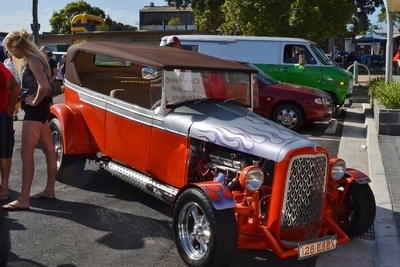 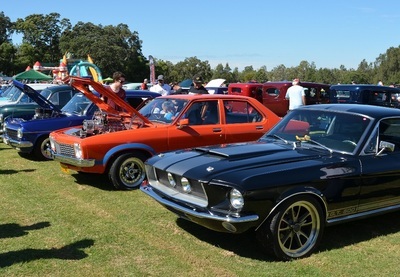 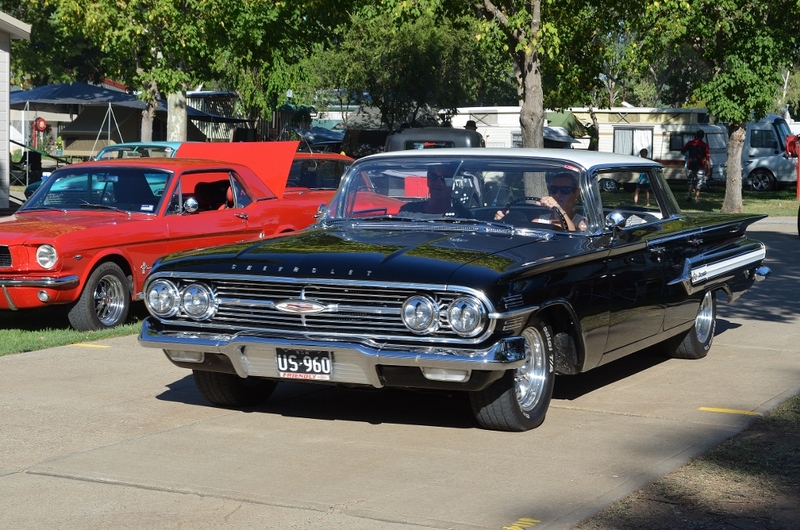 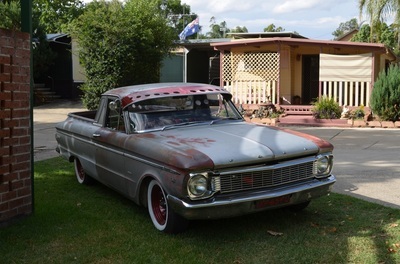 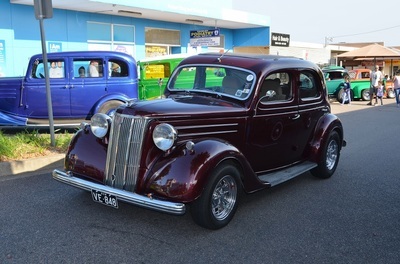 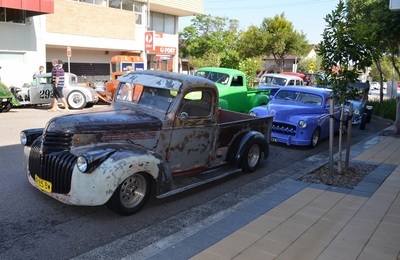 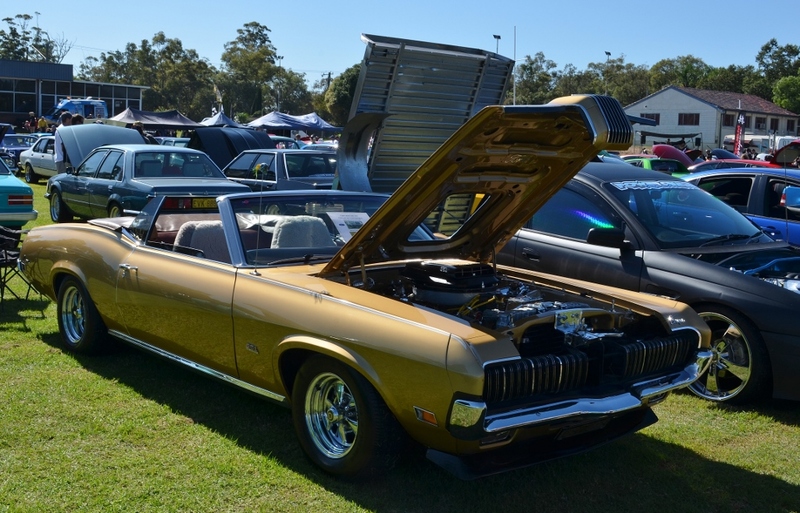 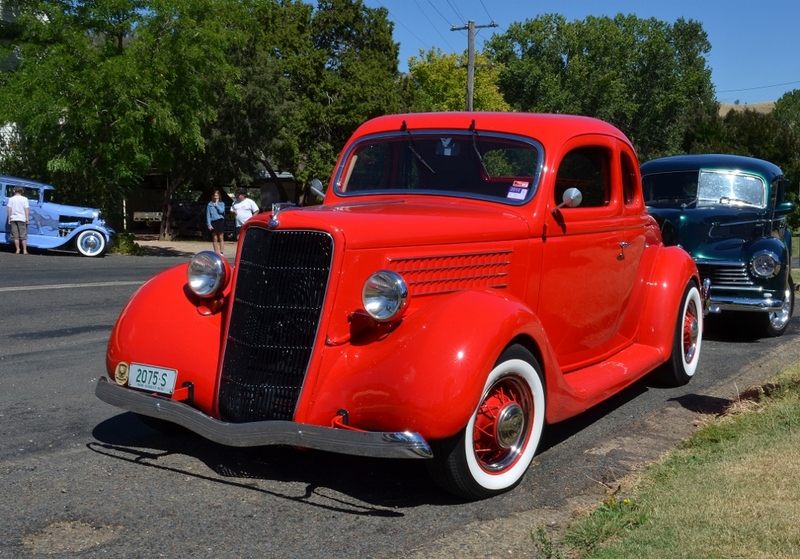 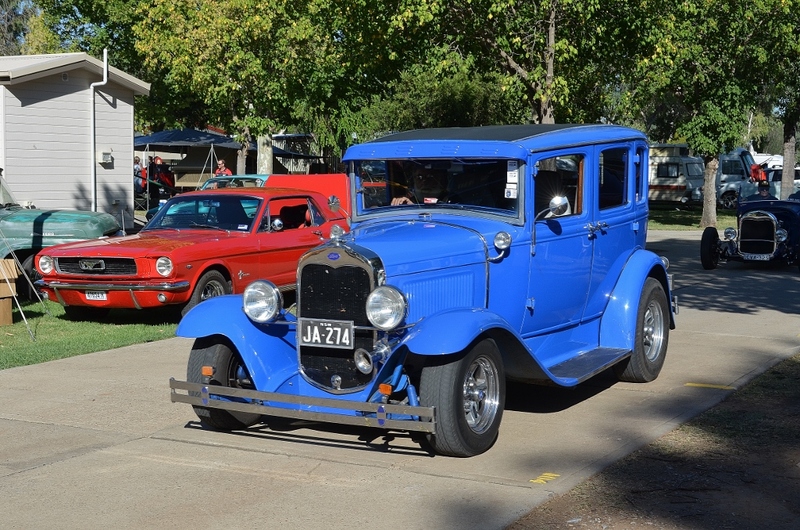 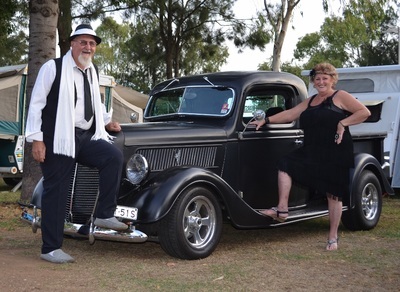 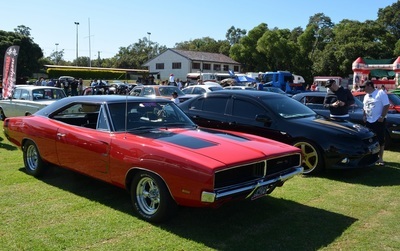 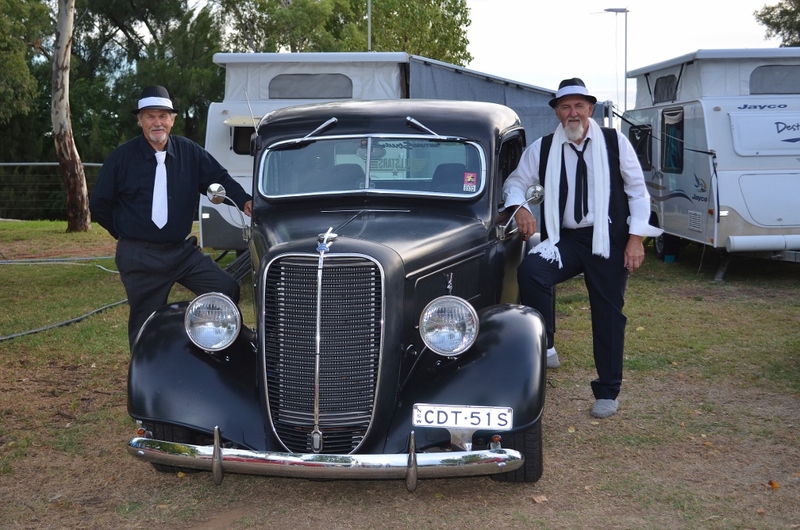 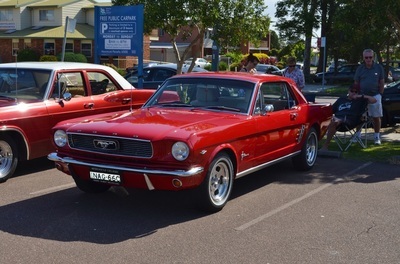 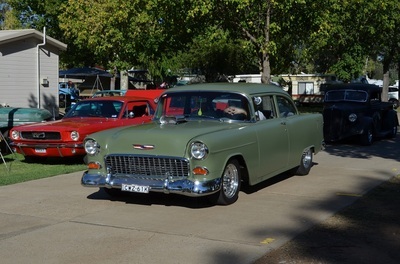 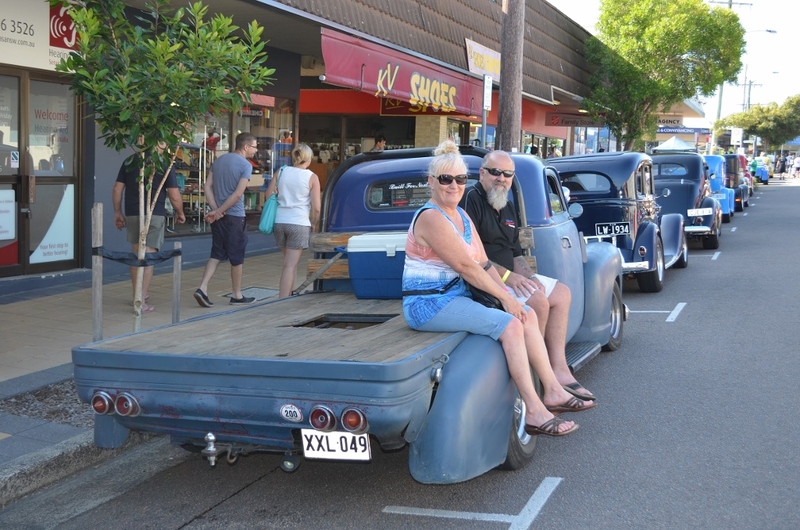 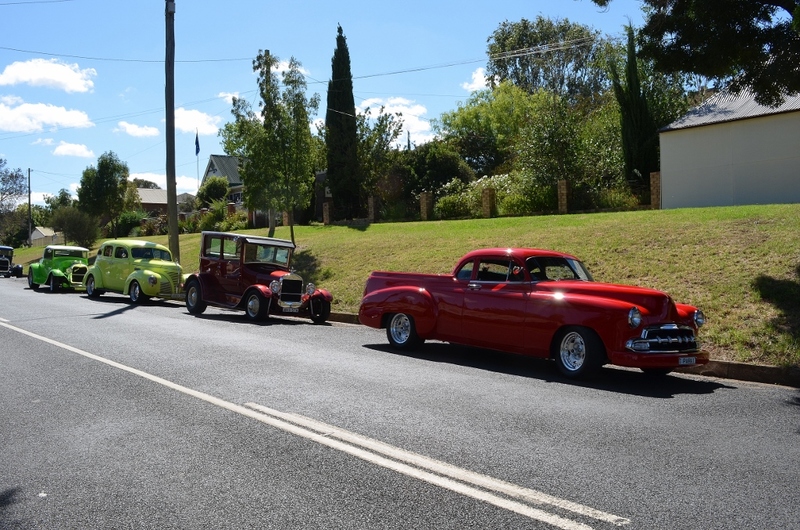 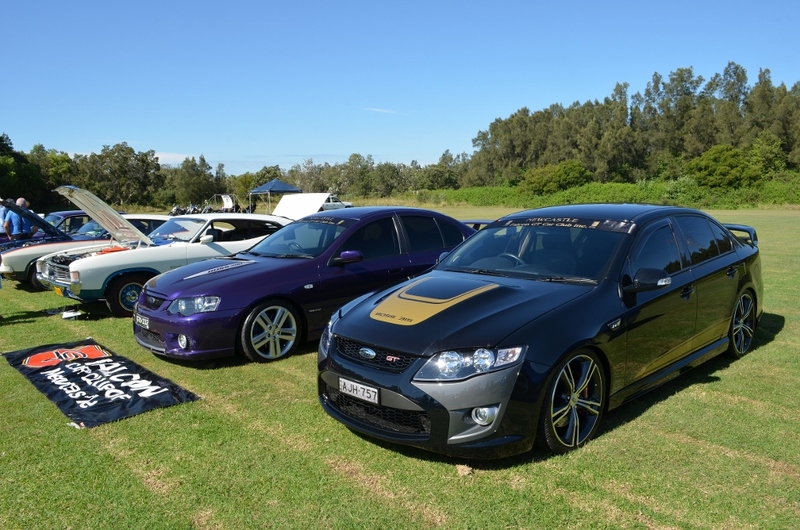 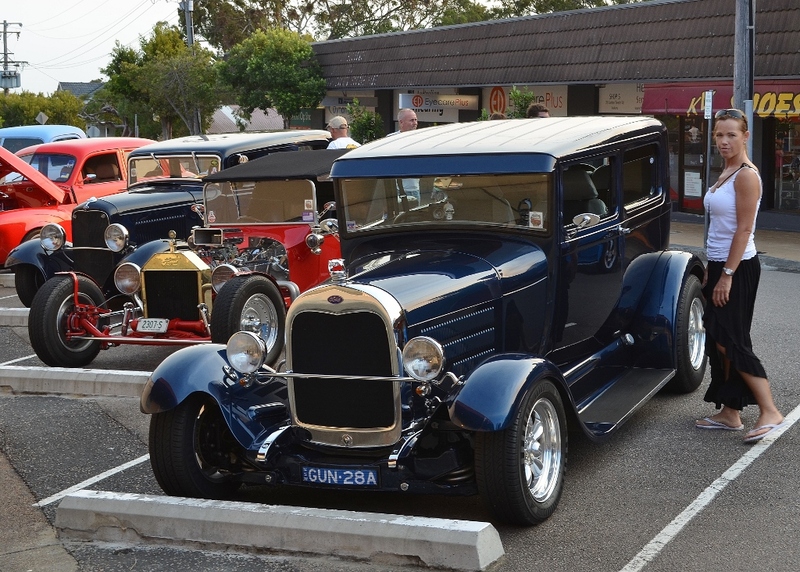 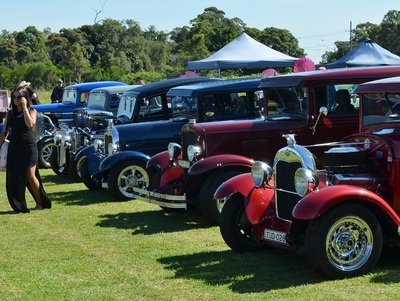 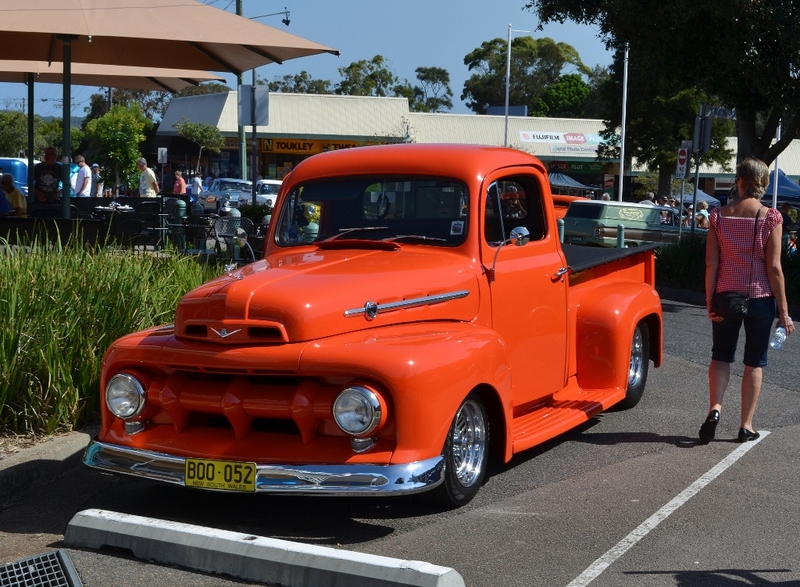 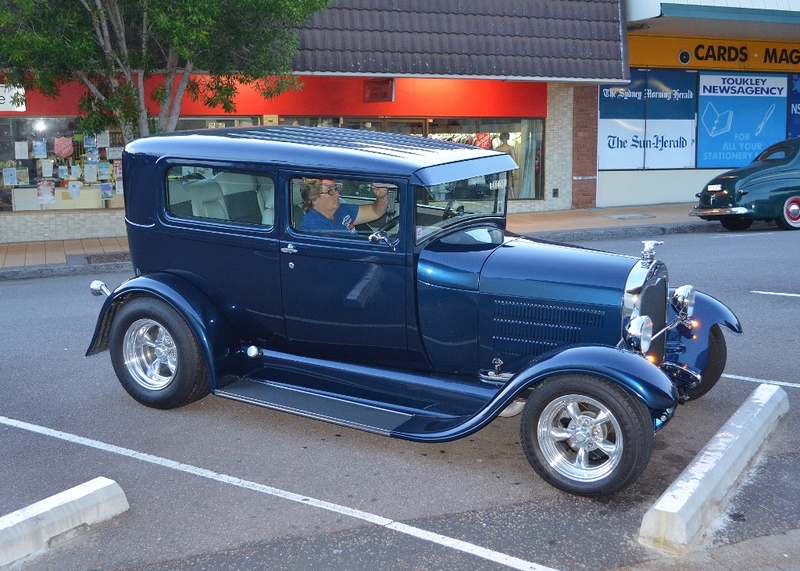 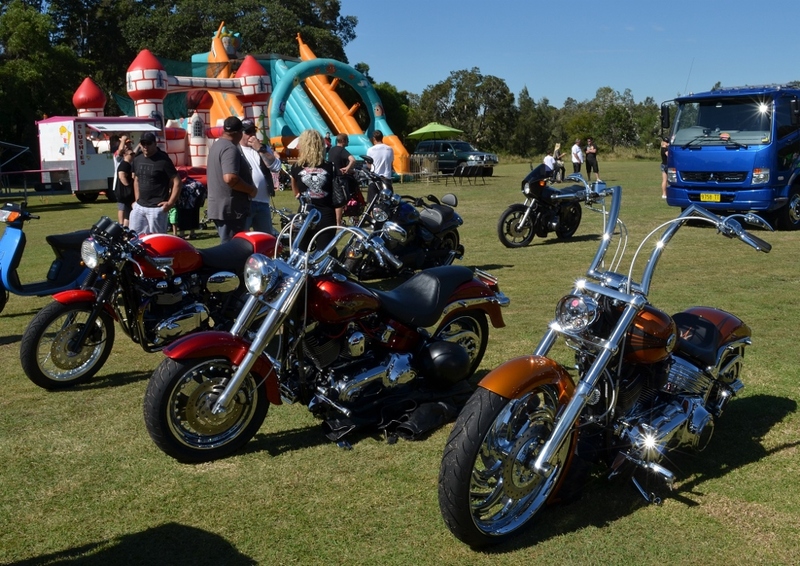 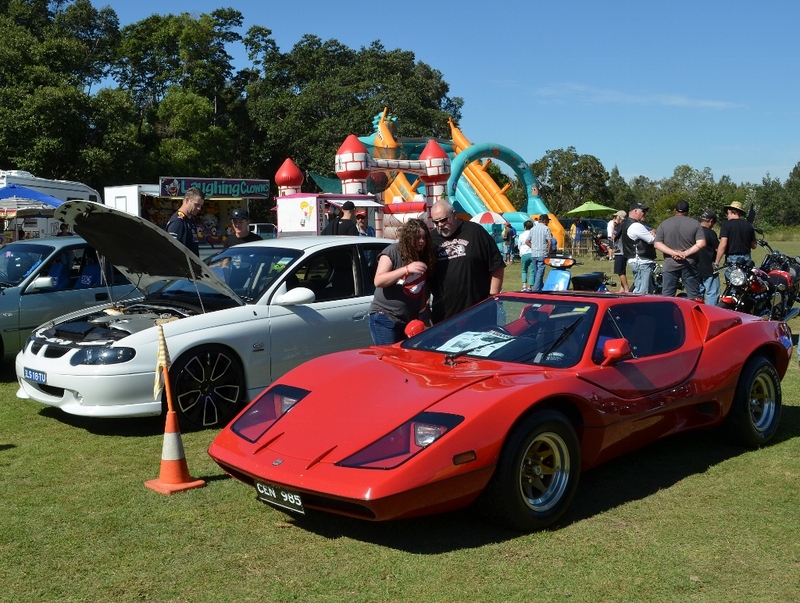 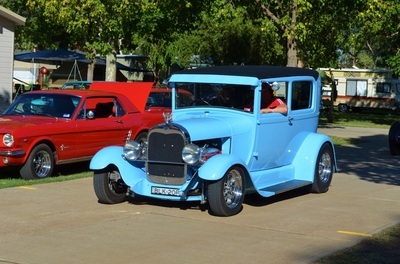 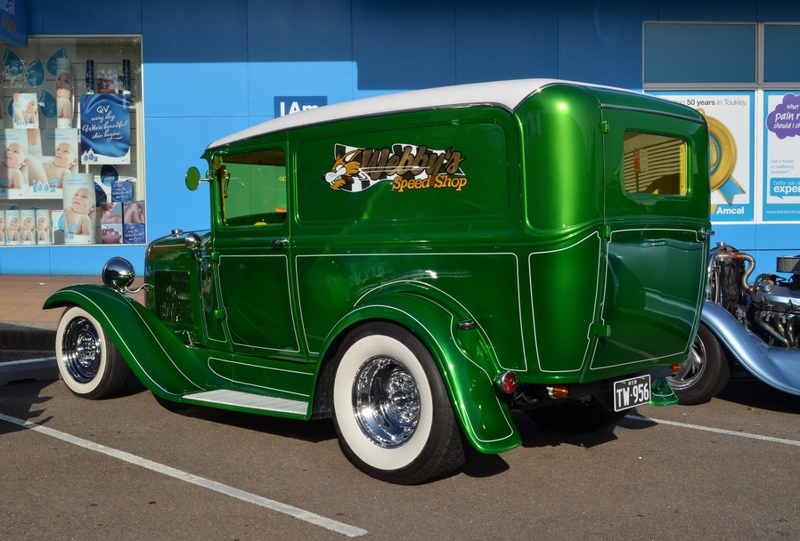 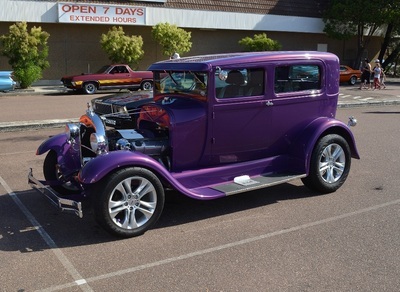 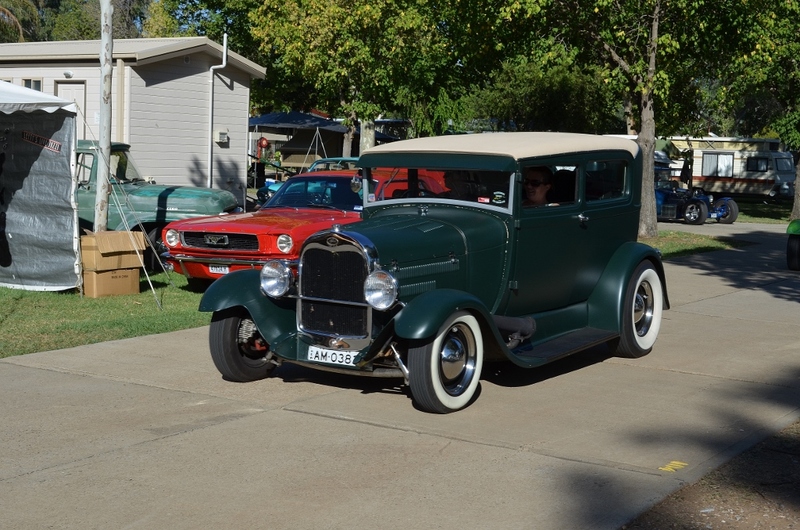 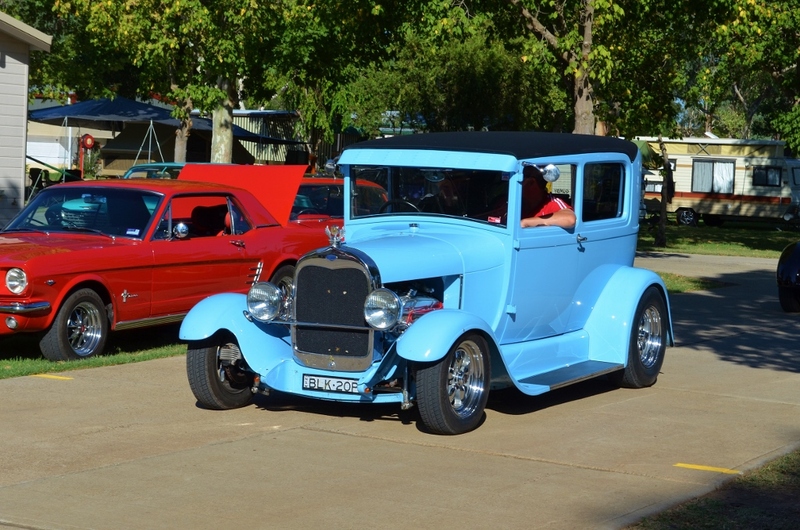 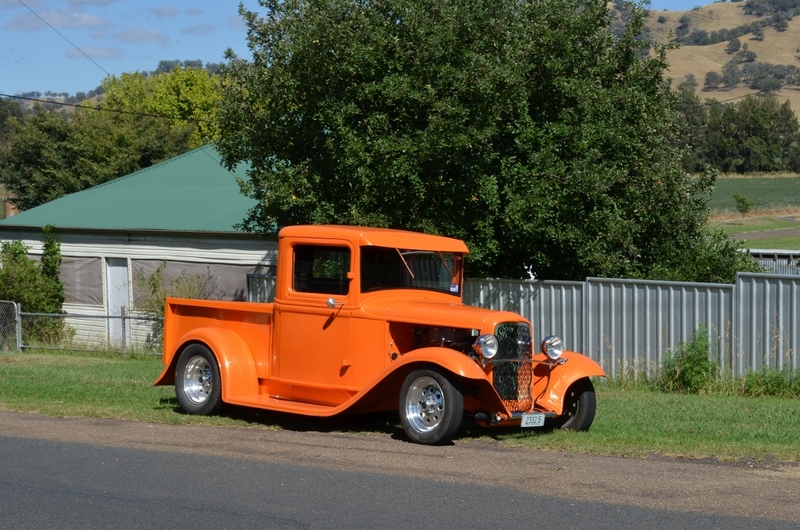 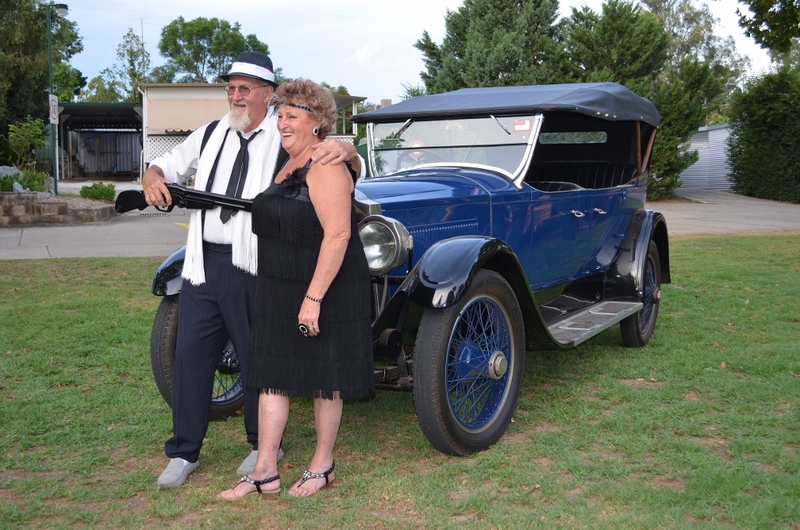 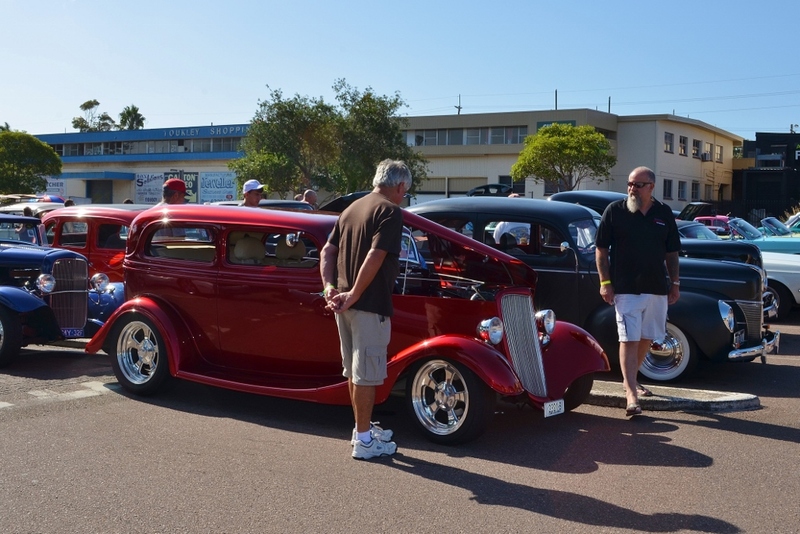 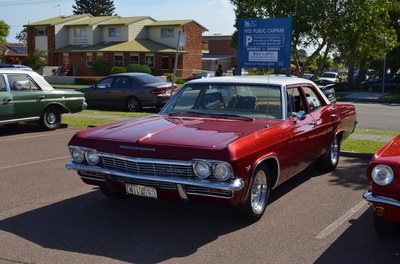 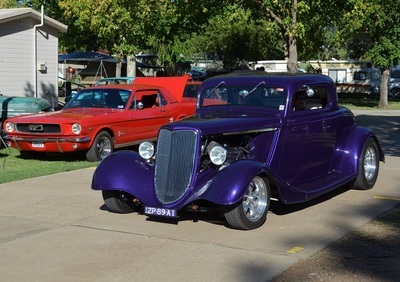 Tomago Show and Shine was back on the calendar in April this year after a couple of years absence. 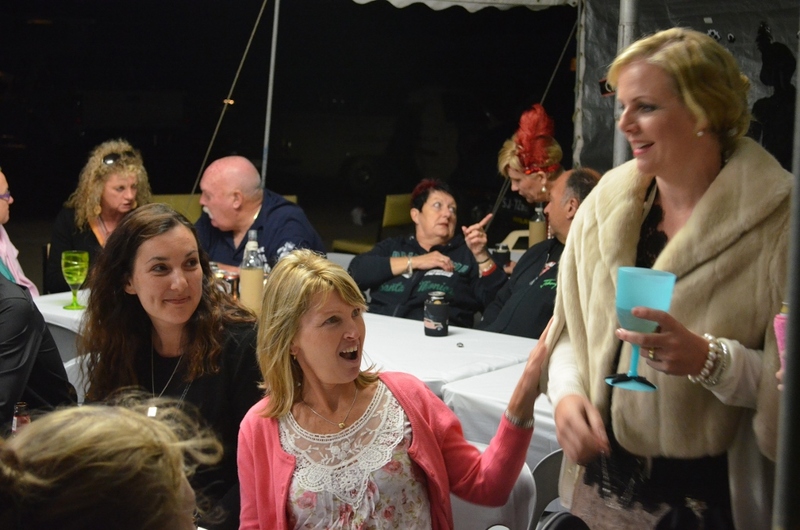 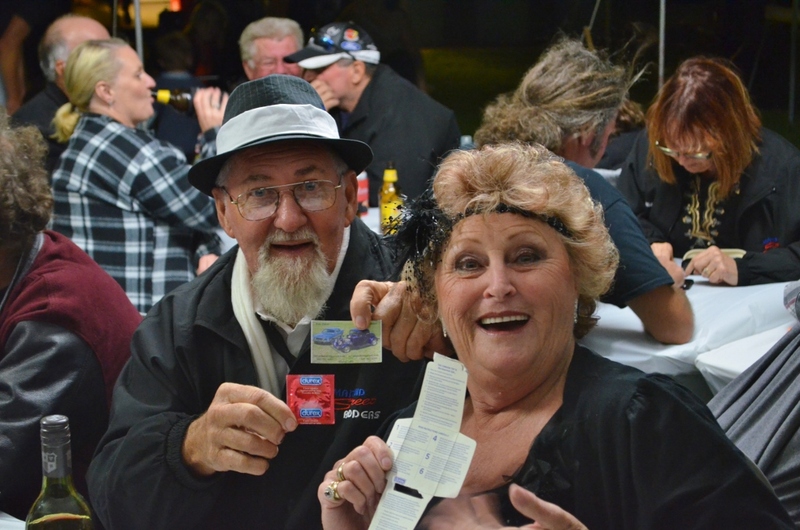 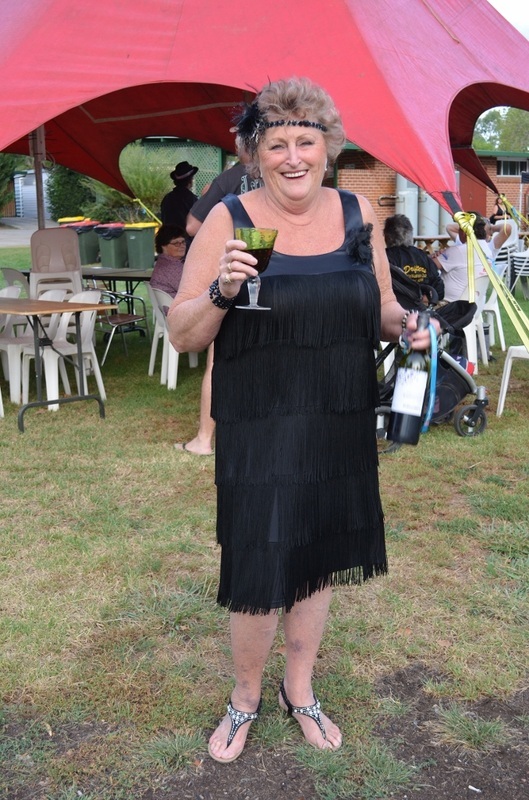 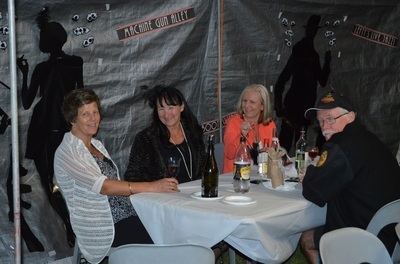 The event is to help raise funds for the Westpac Helicopter and while the numbers were down on previous shows they still had plenty of entrants. 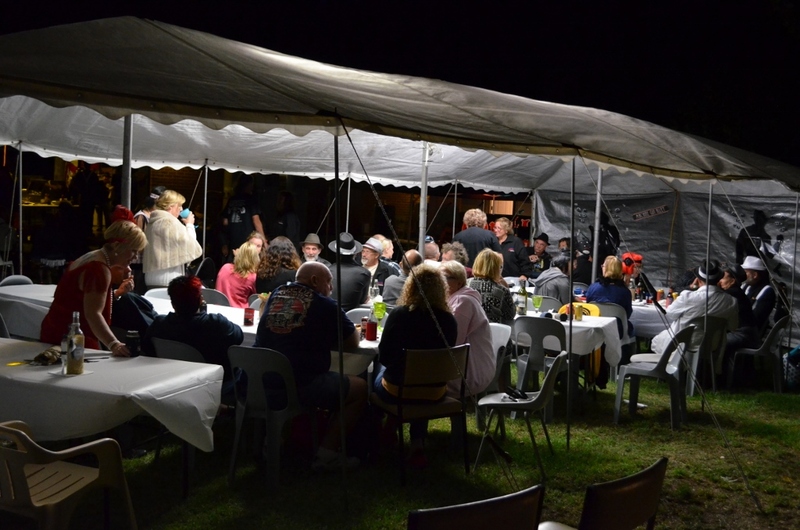 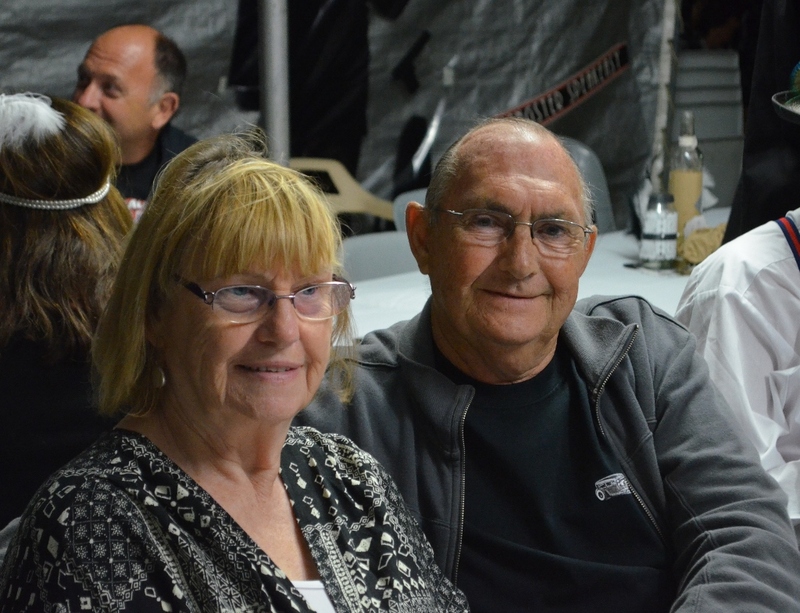 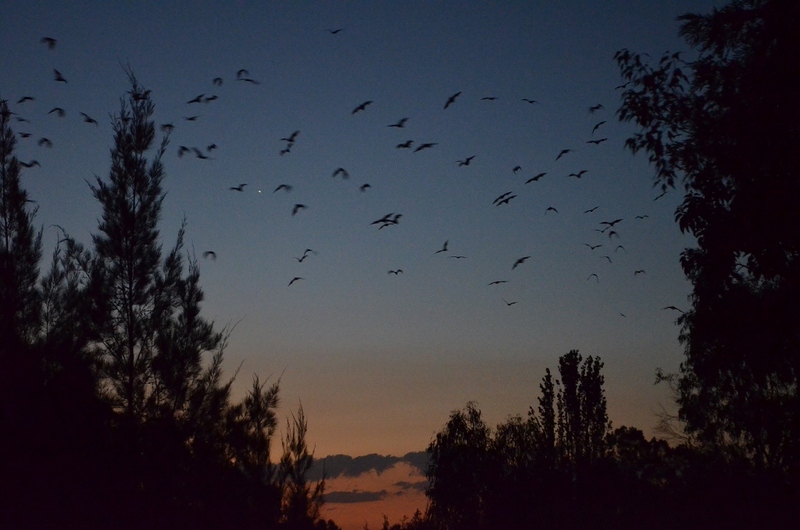 The weather was perfect and those who attended had a good time and some of us had a great meal at the club. 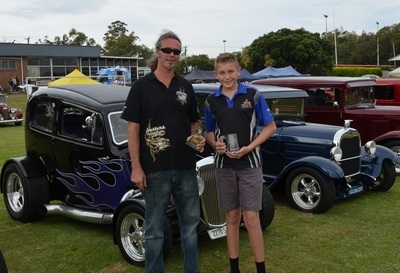 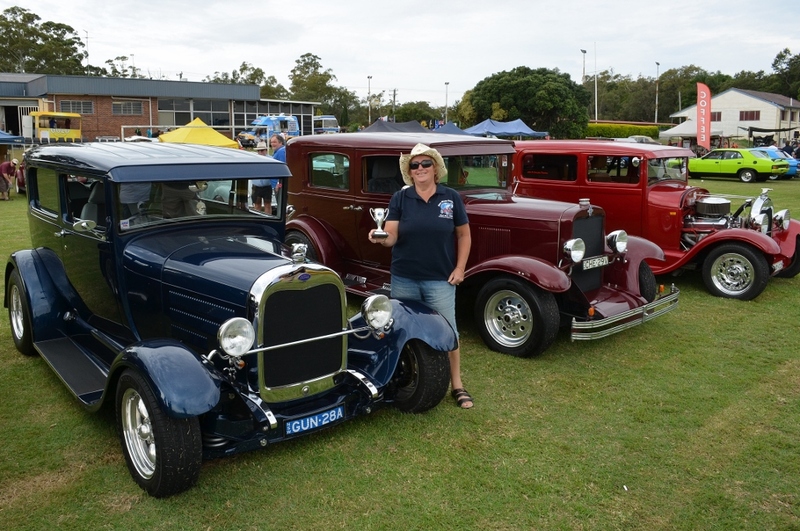 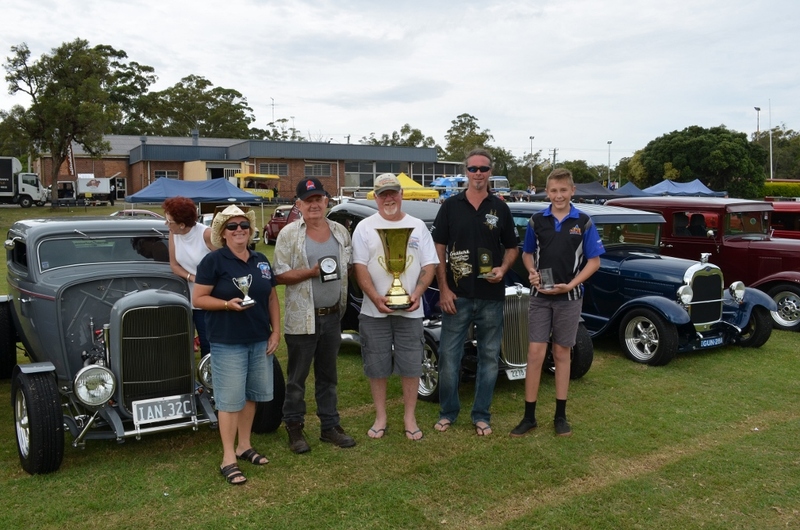 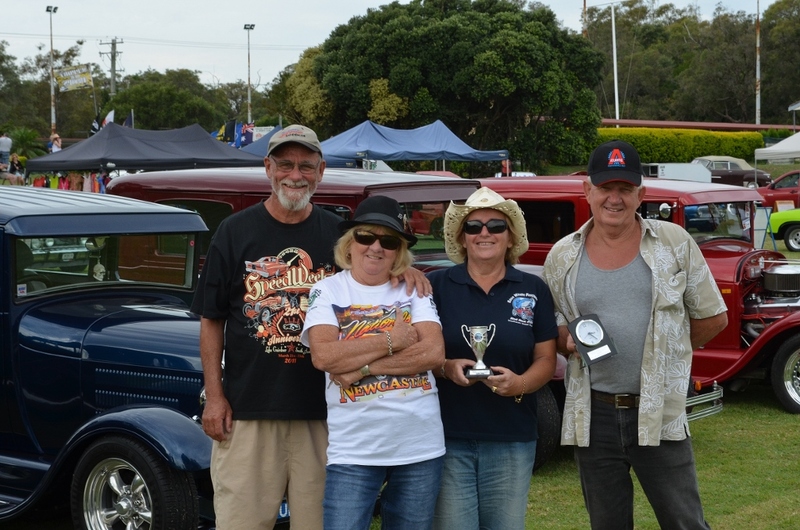 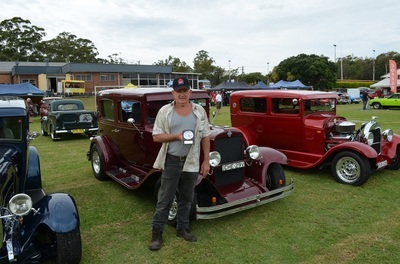 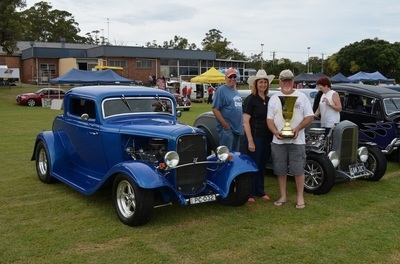 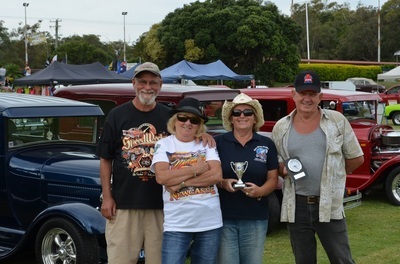 Maitland Street Rodders did well in the trophy stakes with Paul taking out car of the show, Sandy in the top 5, Dan winning best Hot Rod and a sponsors choice and Glenda was runner up in the Hot Rod category.